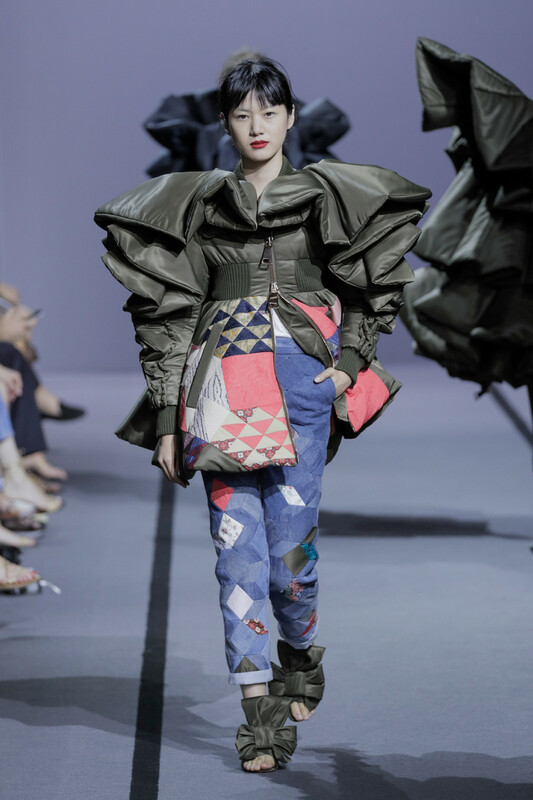 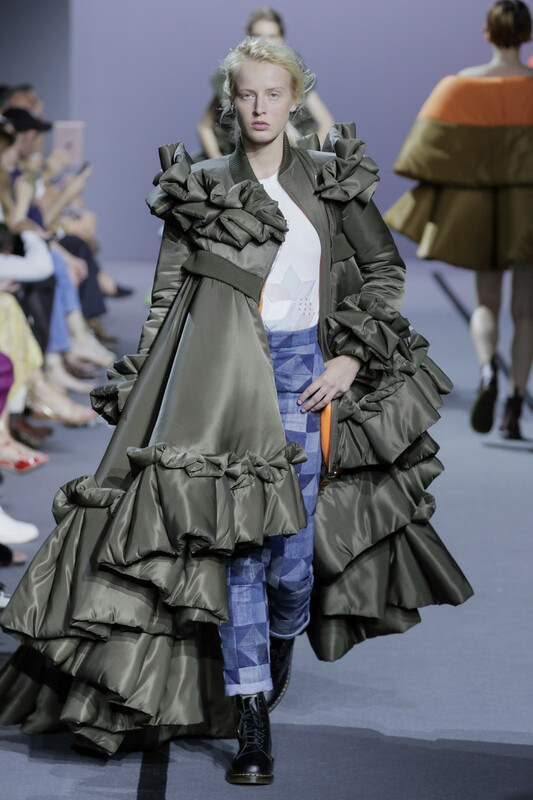 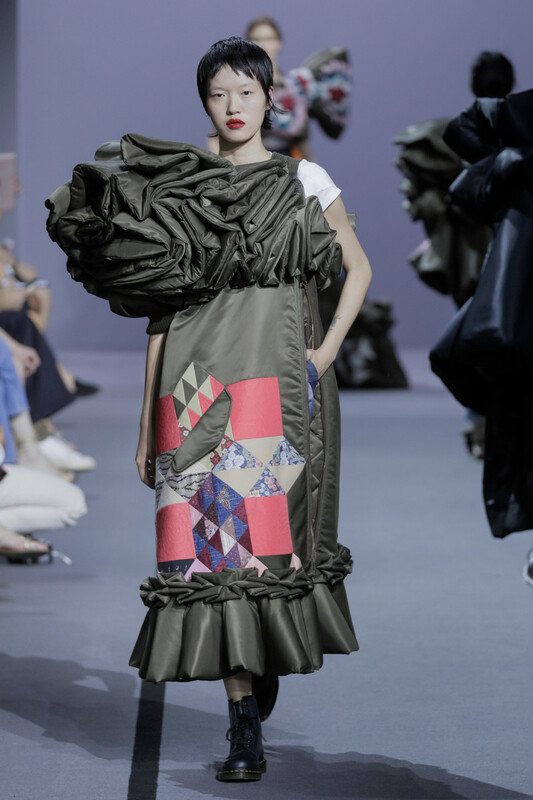 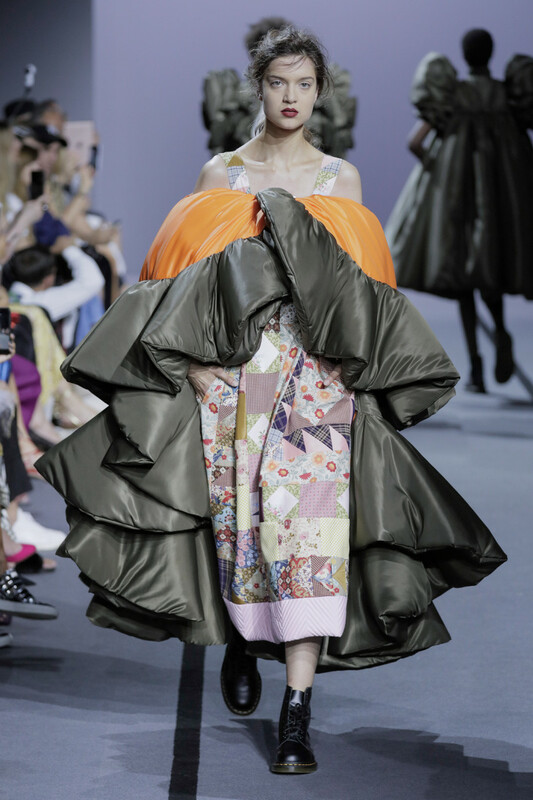 The designer-duo Viktor & Rolf created their entire s2018 couture-collection from the same fabric: a technical satin duchesse from Japan, a noble cloth that for the design duo spells couture. 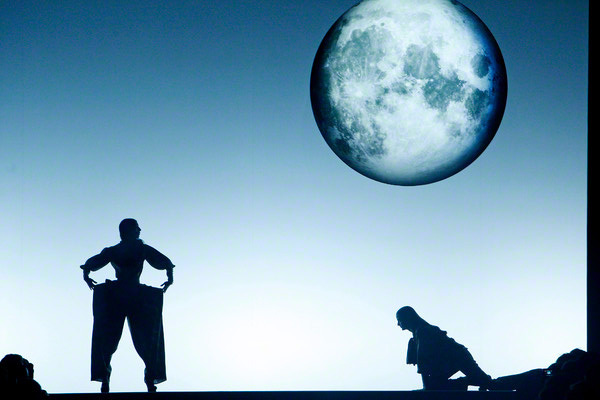 They ticked off a run of best-of silhouettes while they were at it. 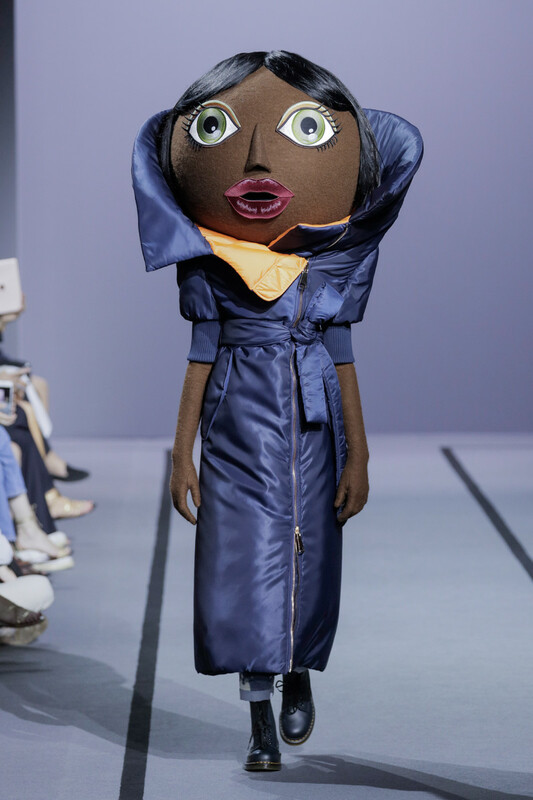 The opening woven minidress recalled the hessian dress worn by Maggie Rizer in the label’s fall 1999 collection, for instance, with signature elements like cape shapes, flowers, bows, frills and ruffles adding texture to the collection. 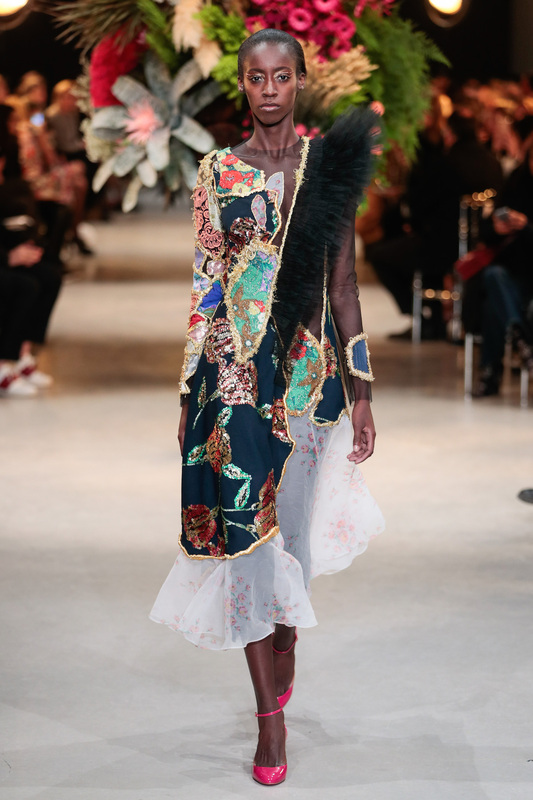 Long silk gowns and skirts cut on the bias sported bold colored stripes or geometric motifs sewn into the fabric, recalling granny patchworks. 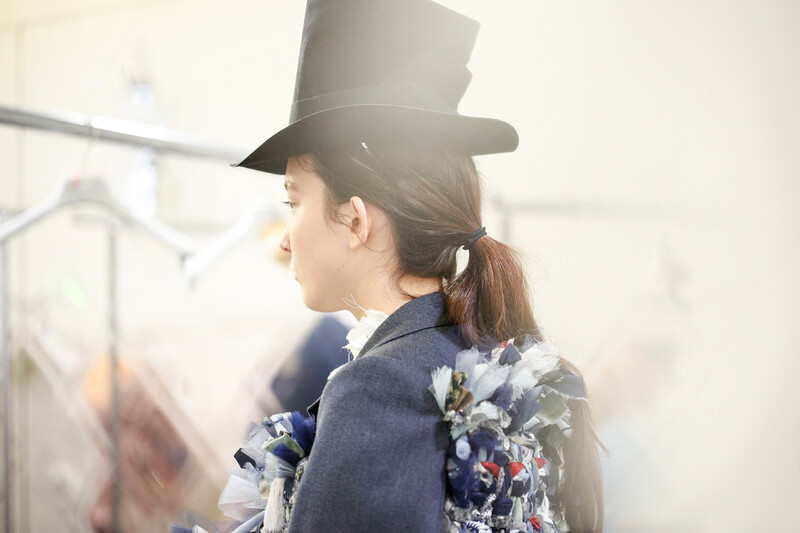 The standouts included a double-breasted blue and red striped blazer with a royal-blue frill framing it, running from the collar down the sleeves. 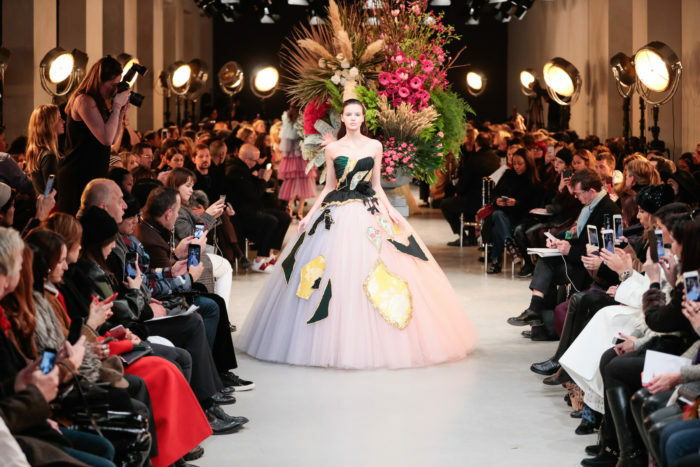 The collection had an old-school couture vibe but was wearable, with the highlights including a green silk minidress with 3-D daisies. 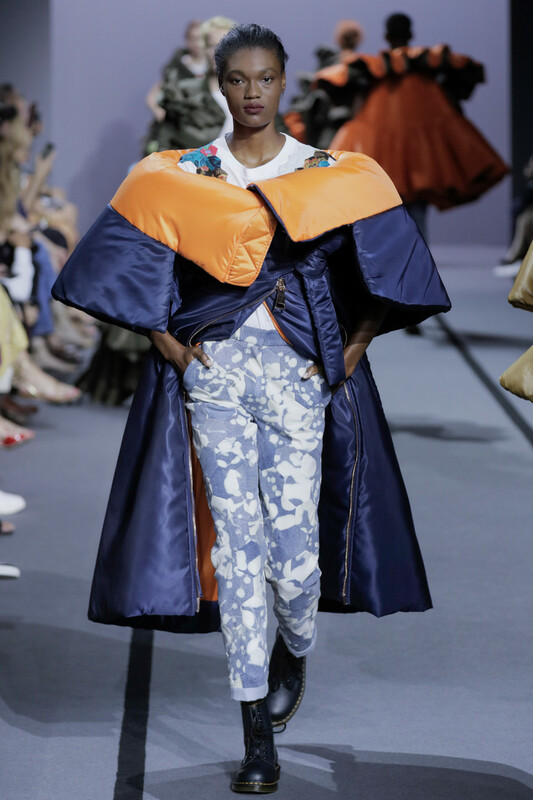 The newness in the colorful lineup mixing conservative and clownish attitudes came not only in the innovation, with the designers managing to create new materials using the fabric, but also in its sustainable bent. 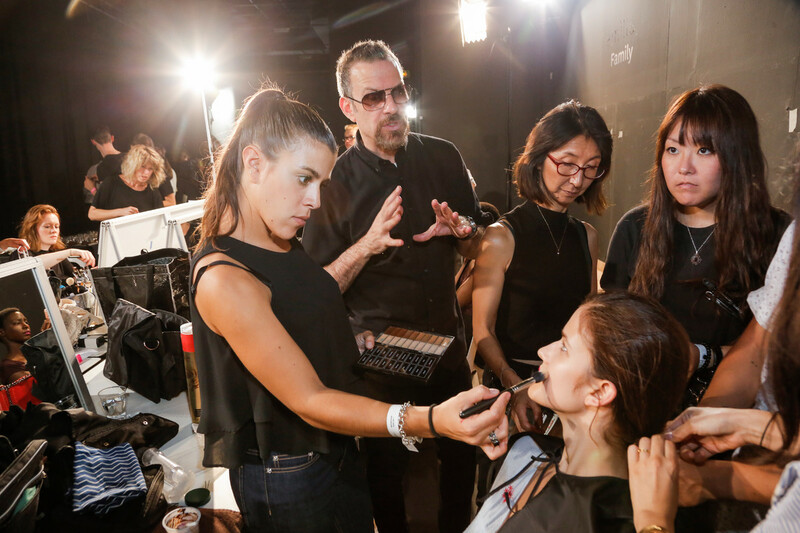 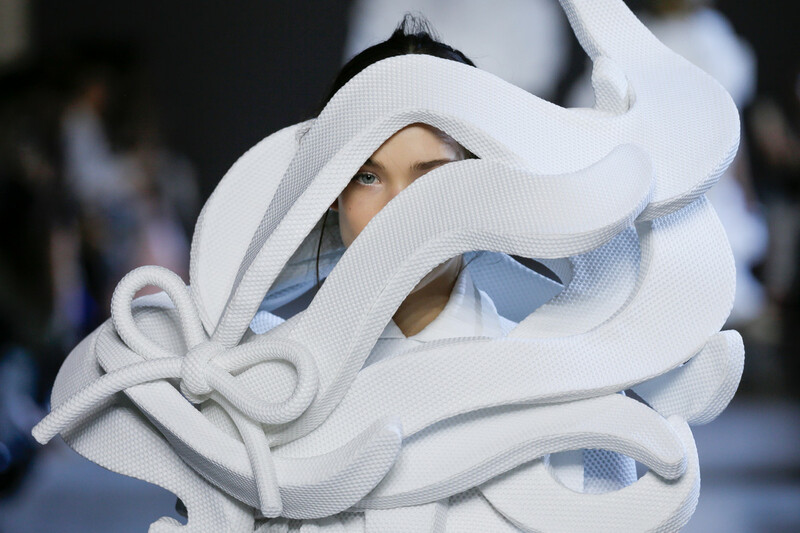 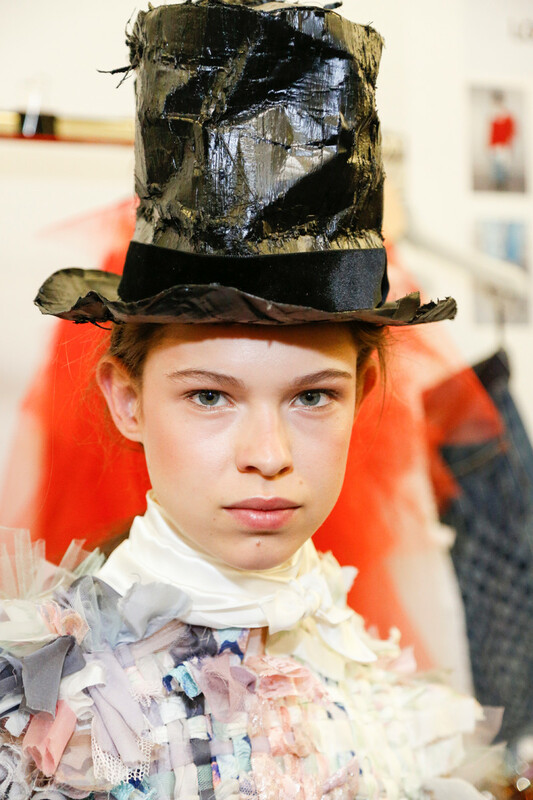 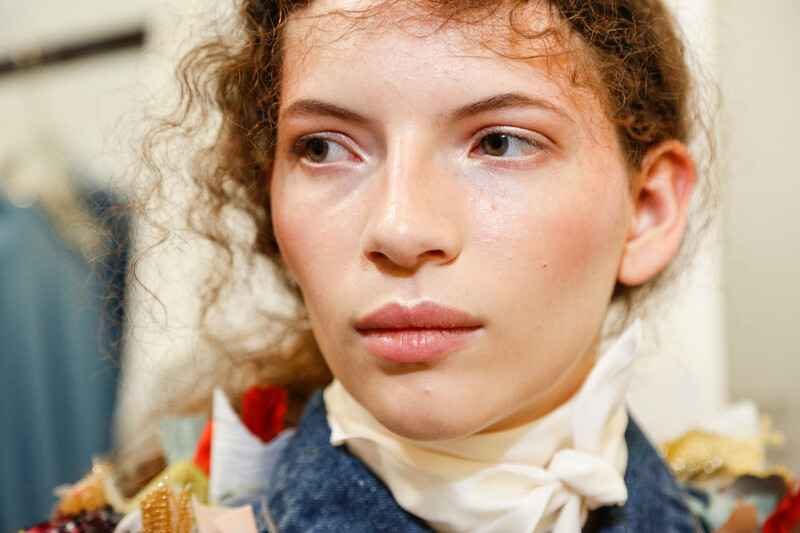 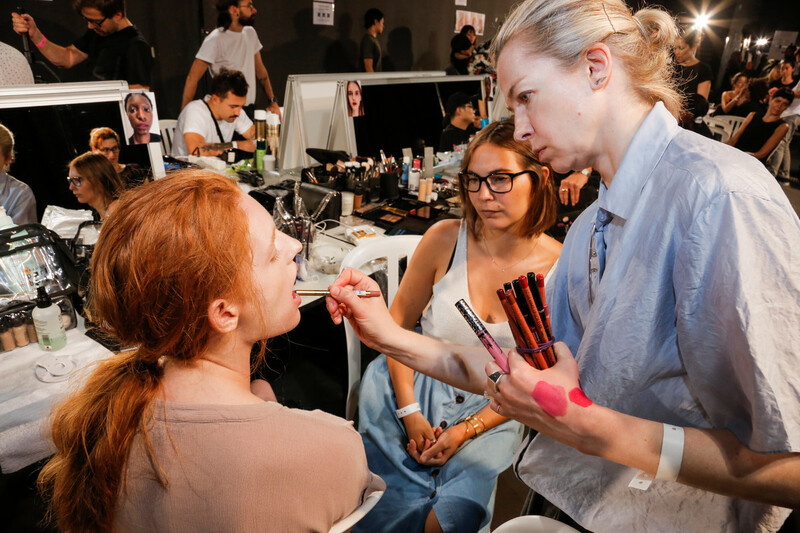 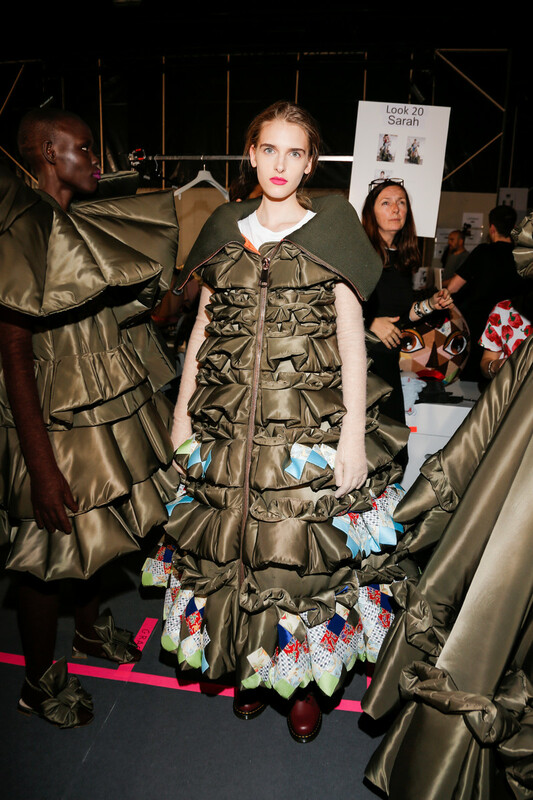 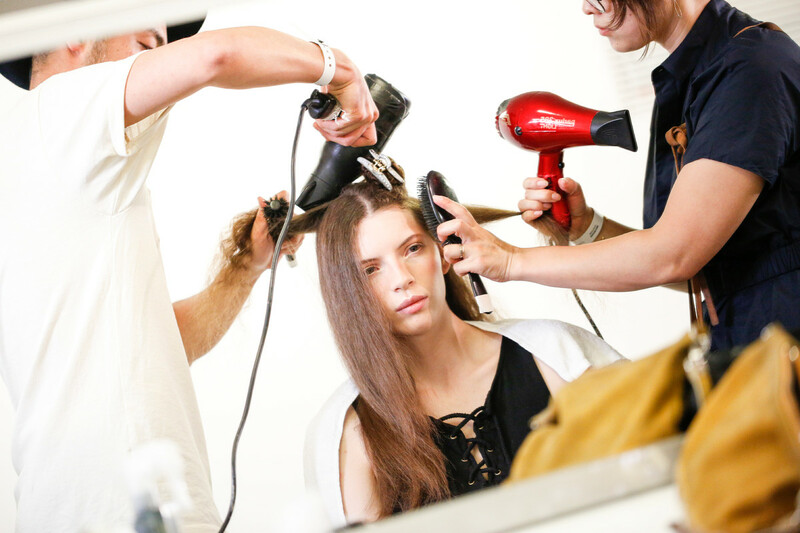 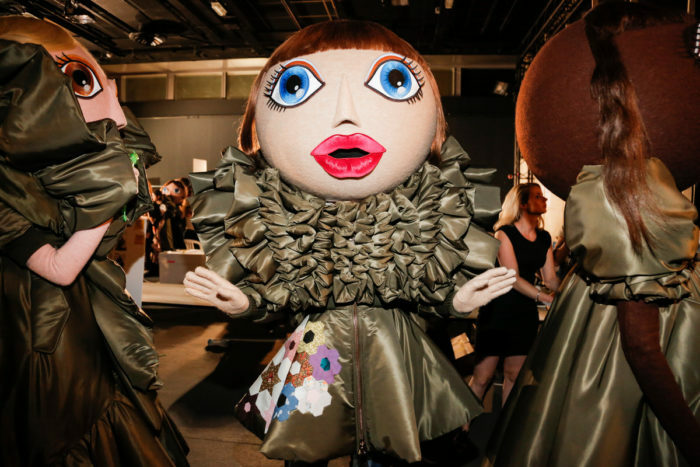 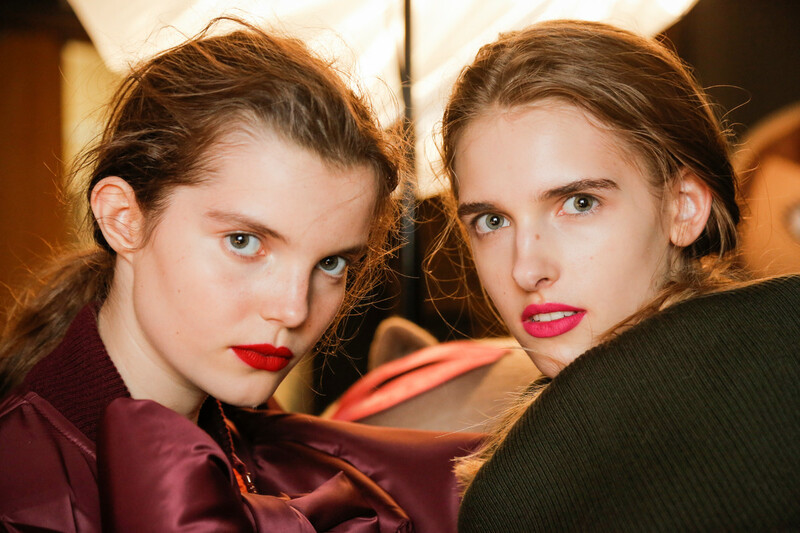 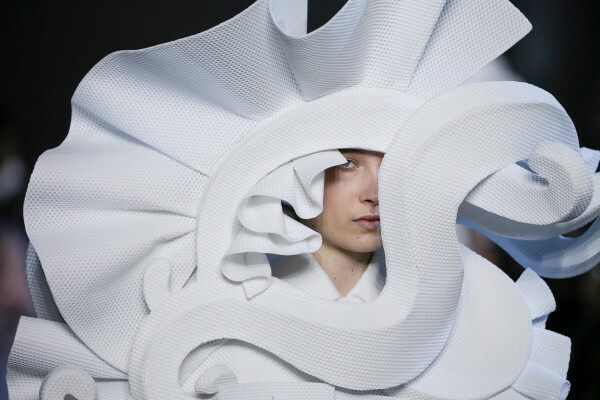 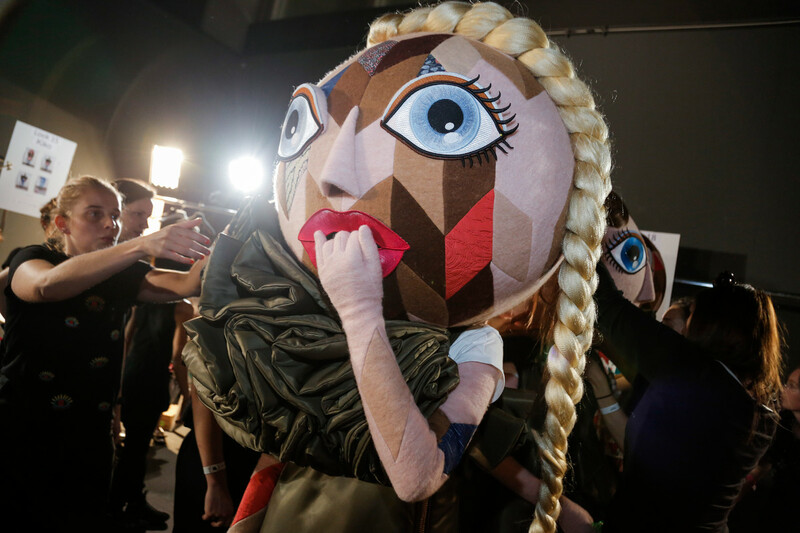 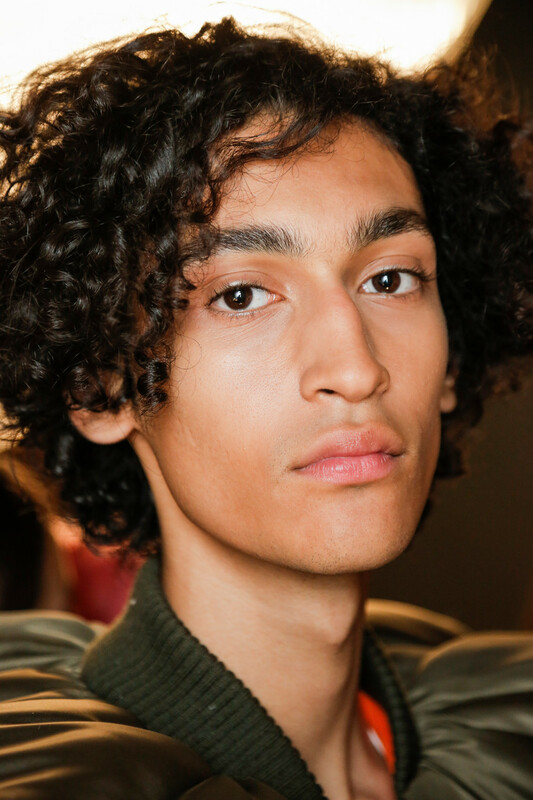 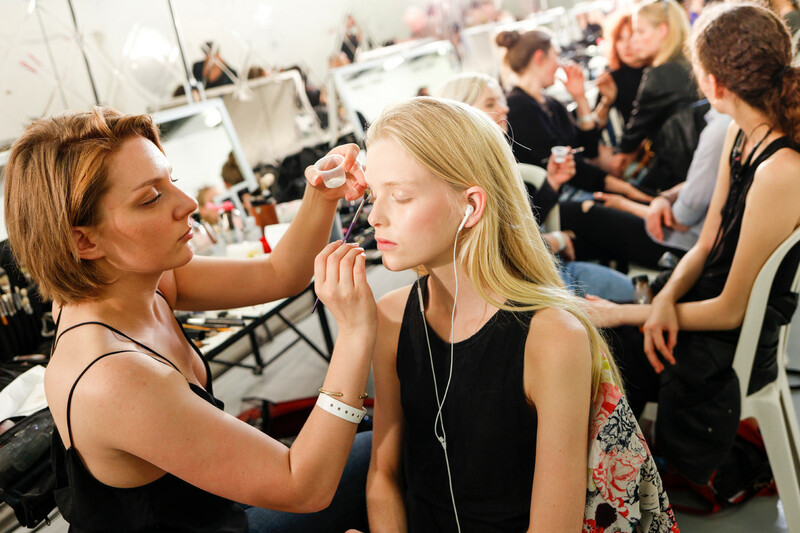 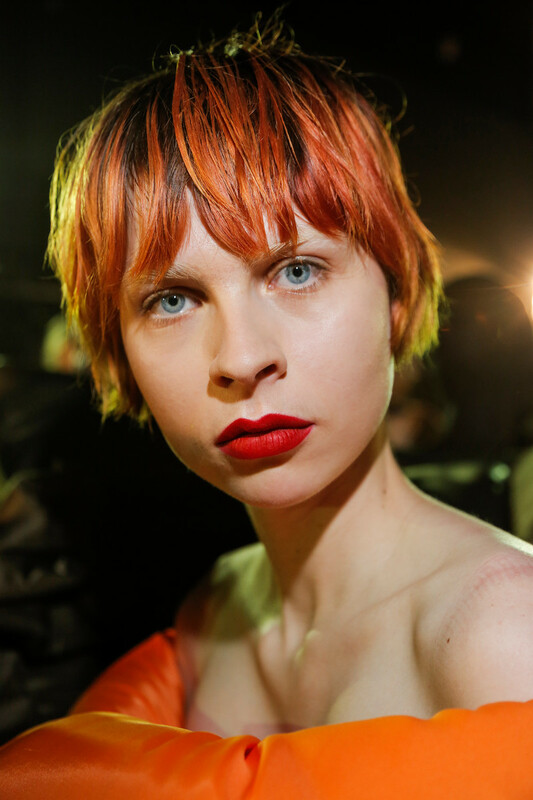 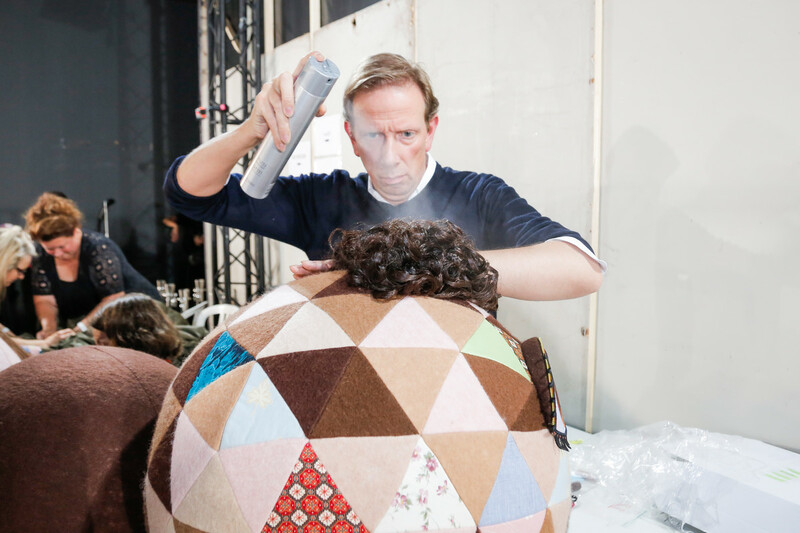 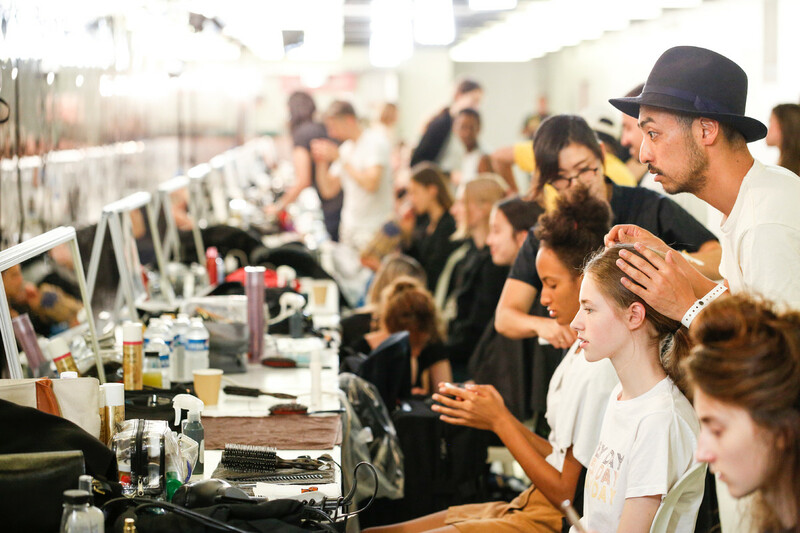 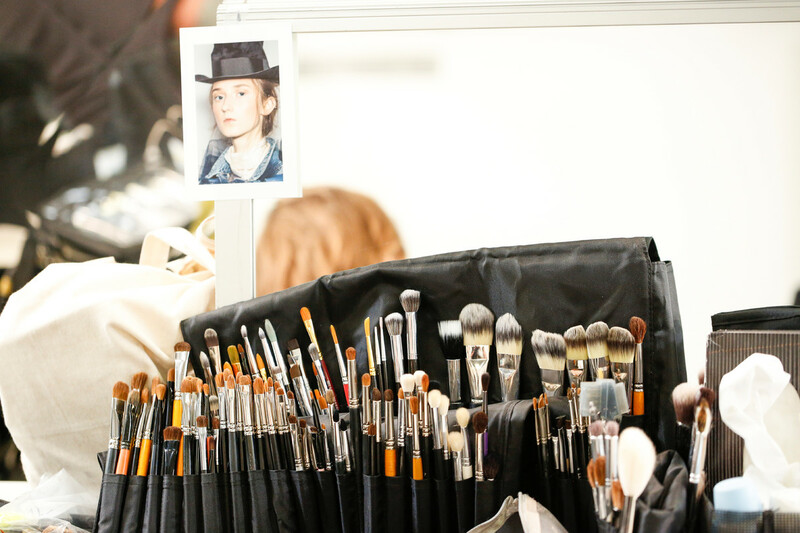 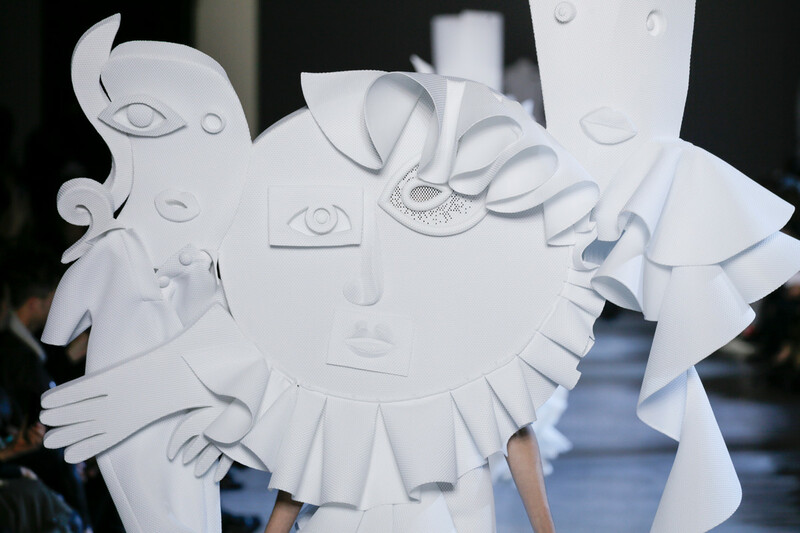 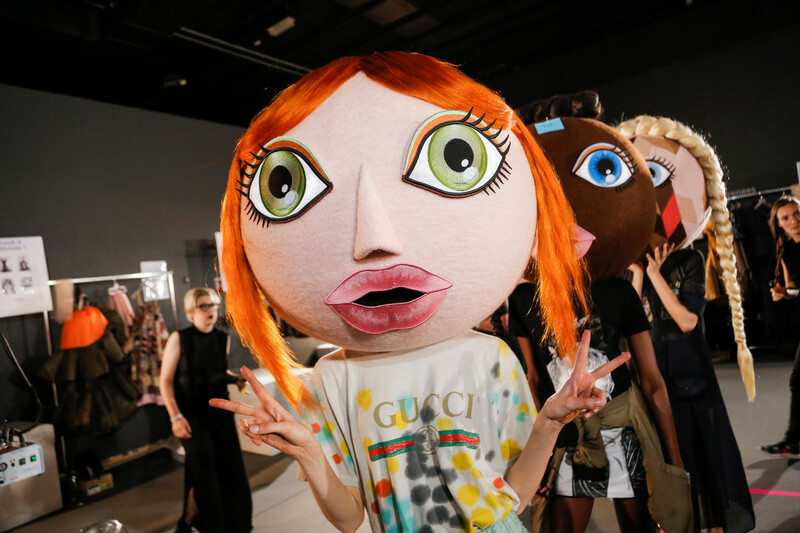 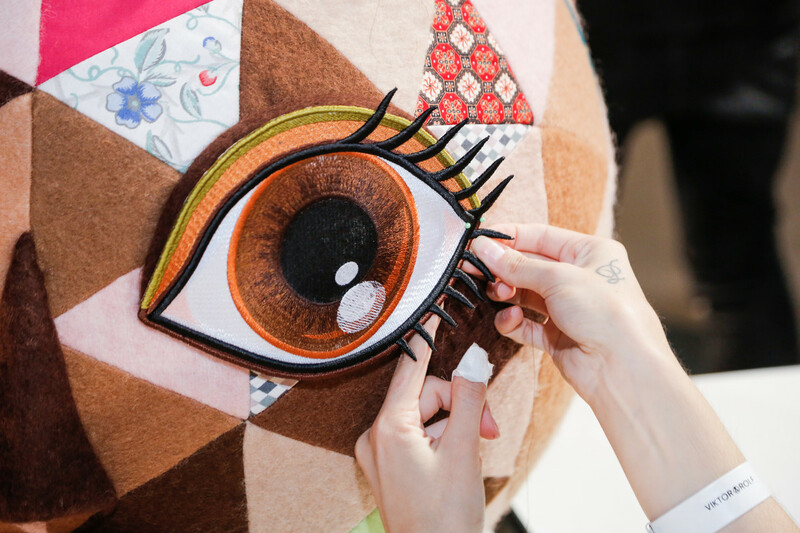 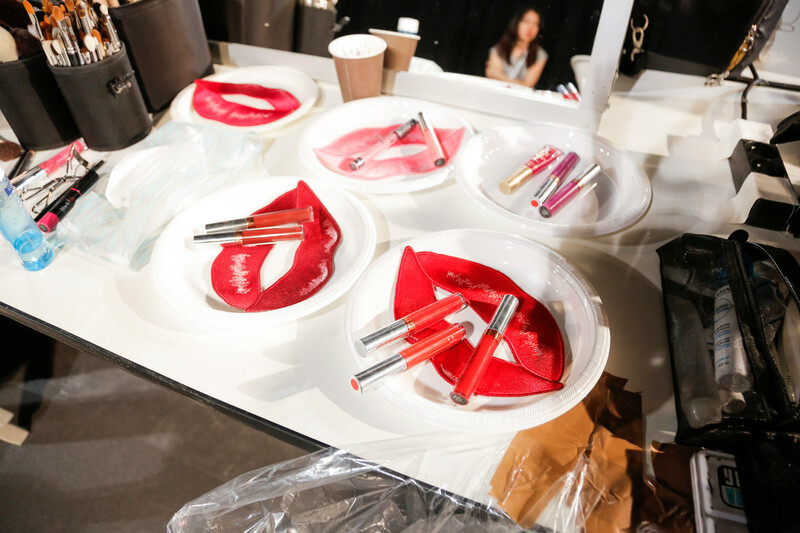 Take a look backstage at the haute couture-show of Viktor & Rolf. 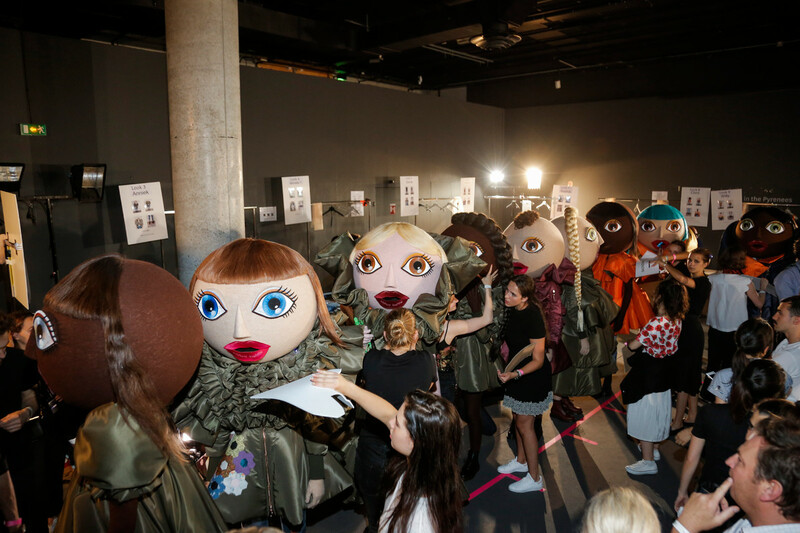 Lats minute action before the dolls came alive on stage. 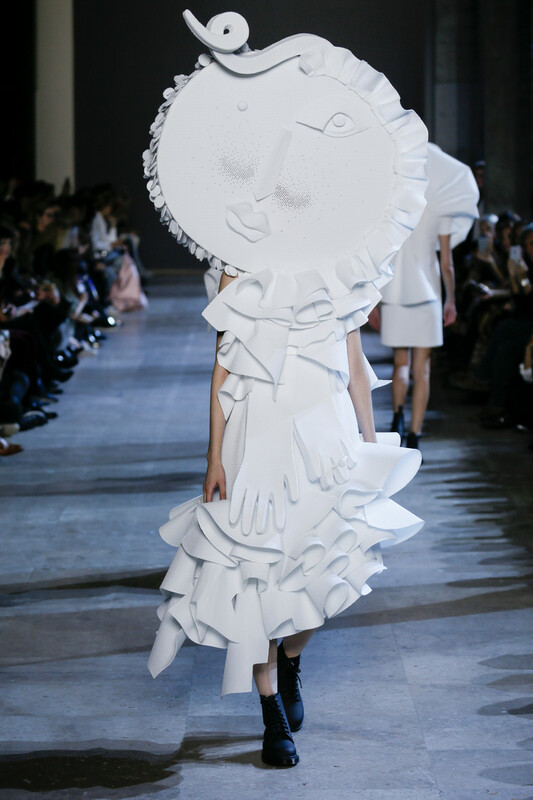 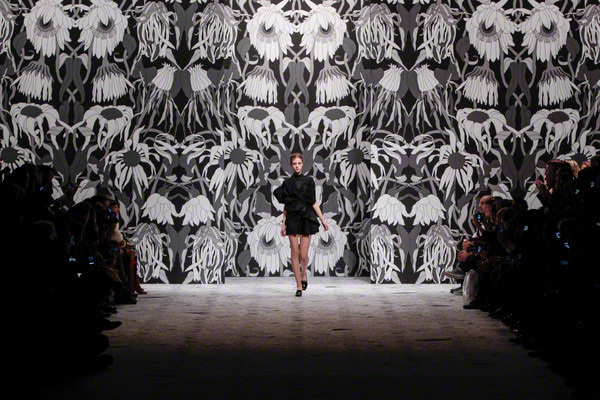 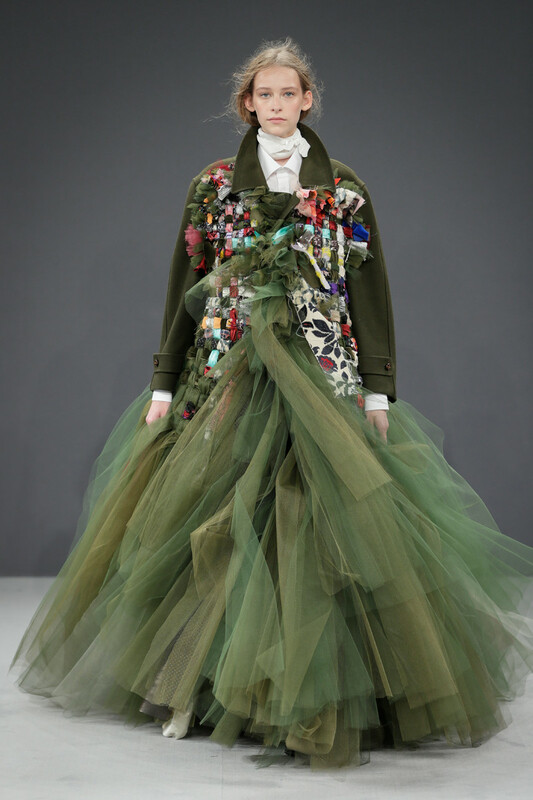 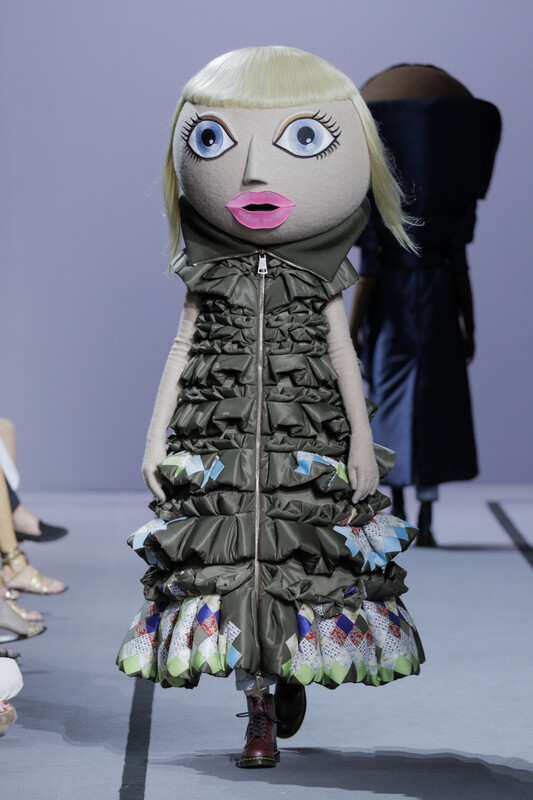 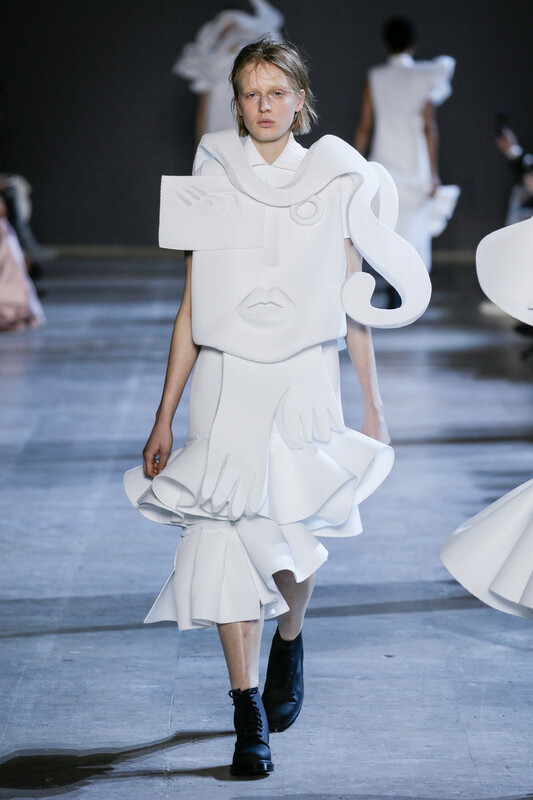 To state Viktor & Rolf’s couture collection was breathtakingly beautiful would still be an understatement. 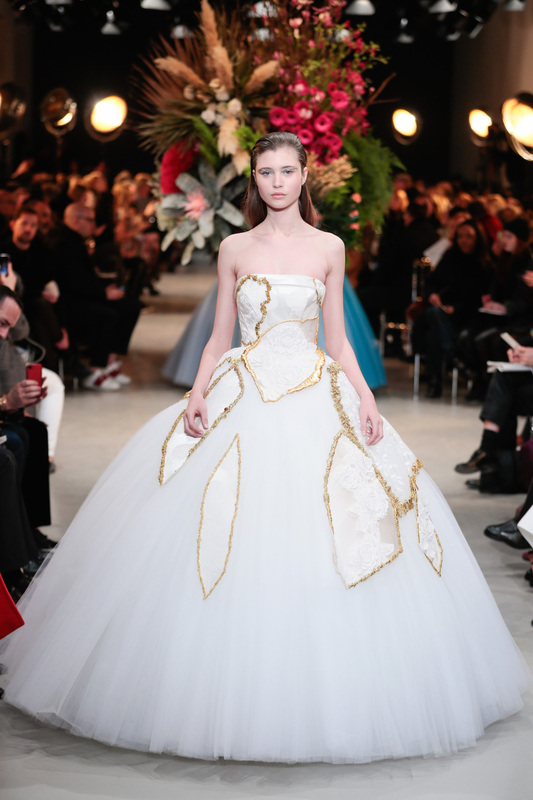 Their collection of broken dreams was simply stunning from beginning to end. 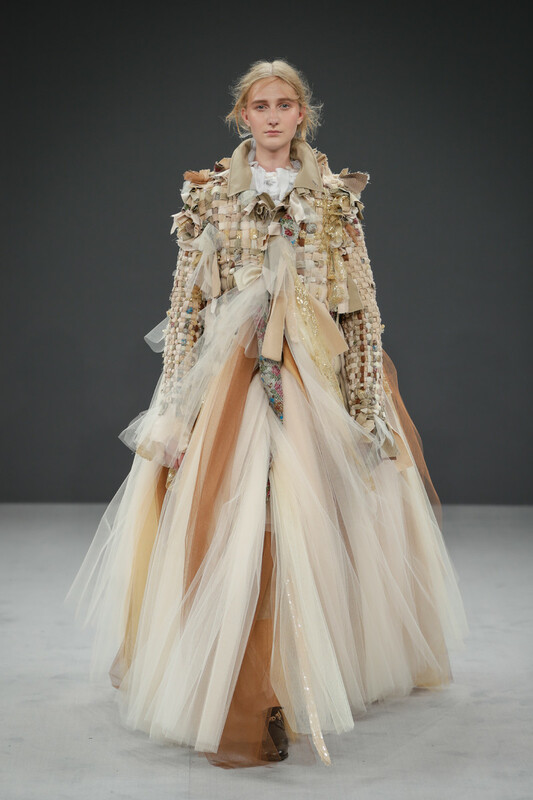 Inspired by Kintsugi (the Japanese art of repairing broken pottery with lacquer dusted or mixed with powdered gold, silver, or platinum as it’s breakage and repair are part of the history of an object) the Dutch design duo cut up old vintage gowns and used pieces of them on their brand new designs (quite the sustainable idea). 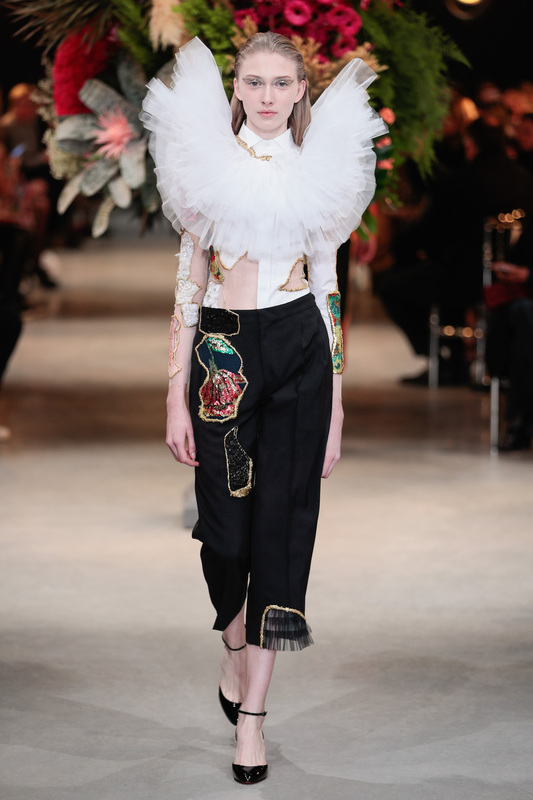 Attached with a gold or silver lining around it, just like the cups and bowls you’d find after Googling ‘Kintsugi’. 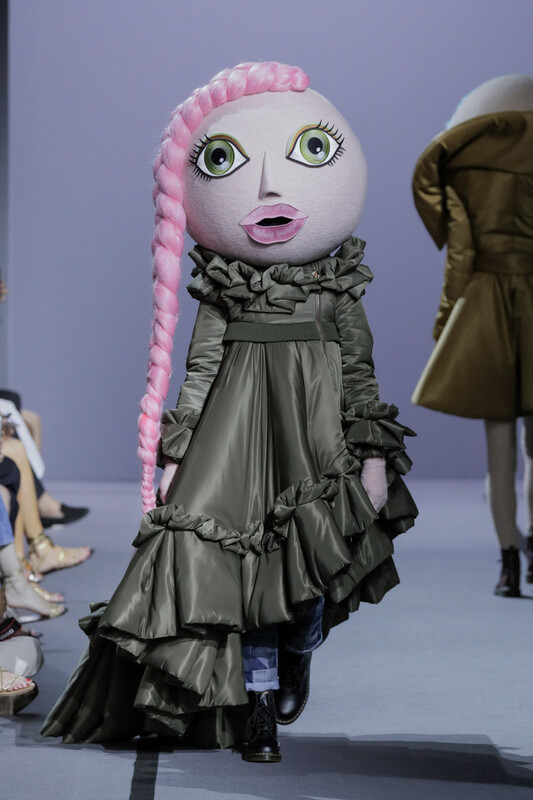 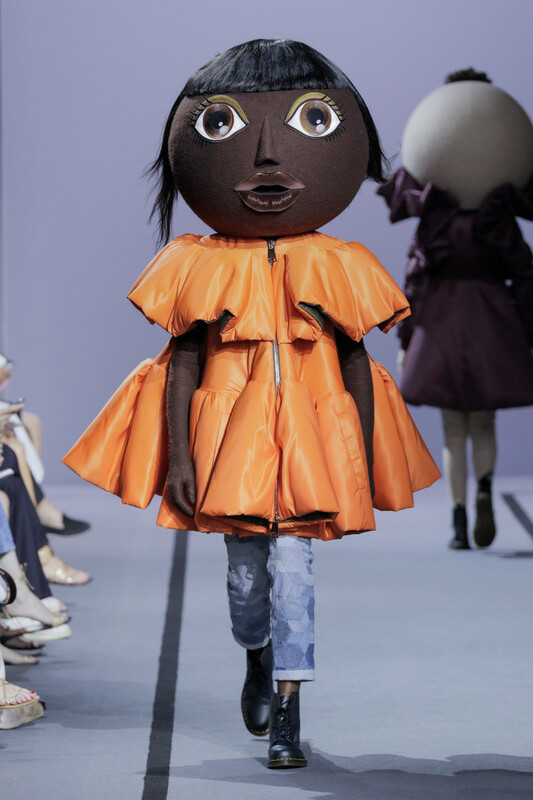 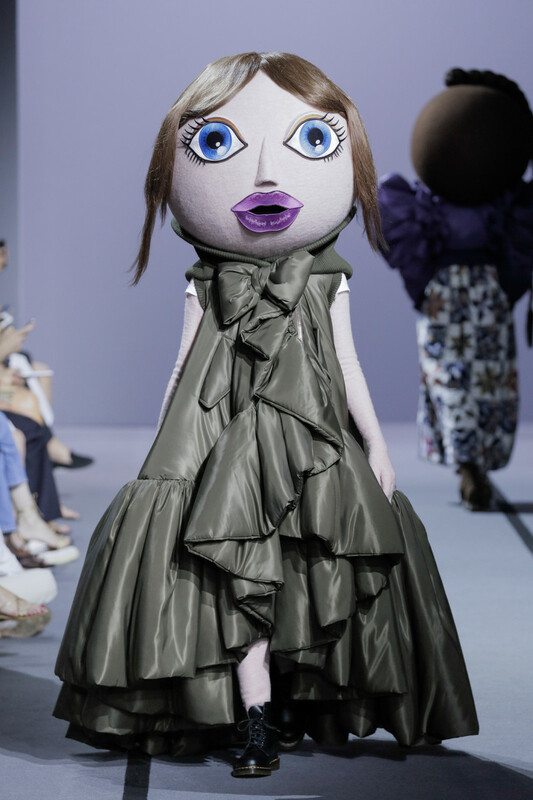 Now in case you thought this game of cut and paste would make the couture pieces end up like rag dolls, this was definitely not the case. 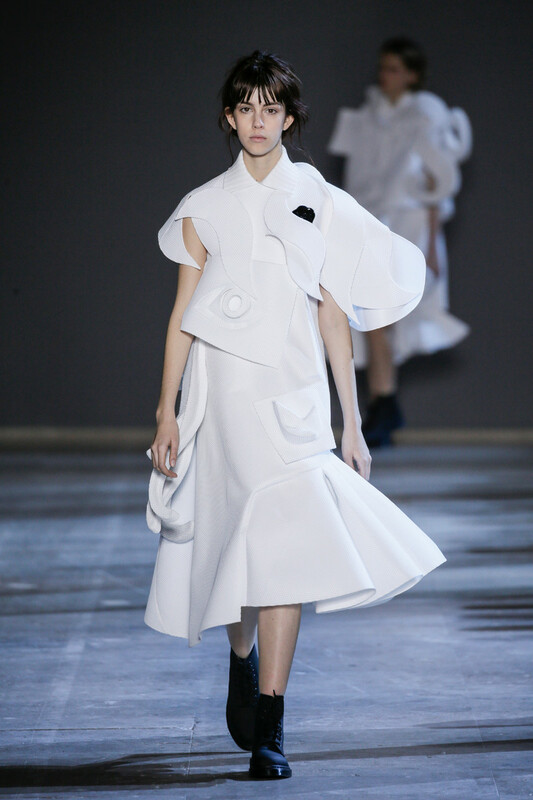 The pieces gave the new looks, which were already stunners, extra value, a deeper layer. 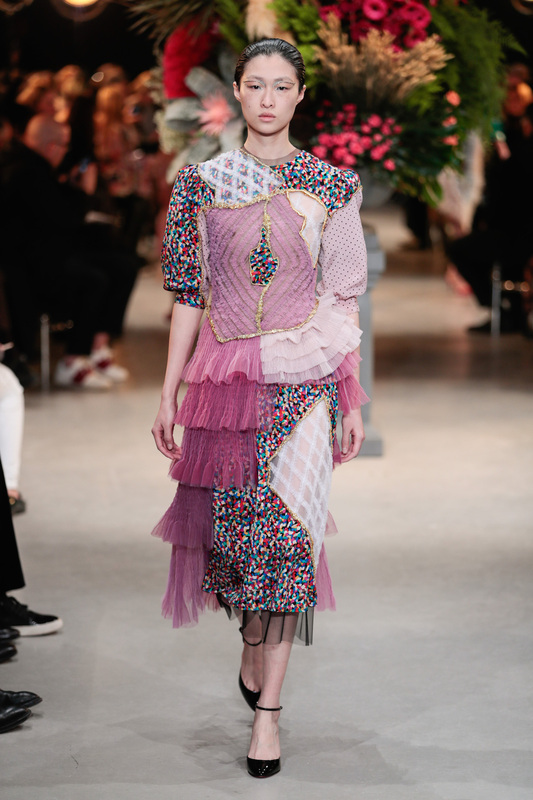 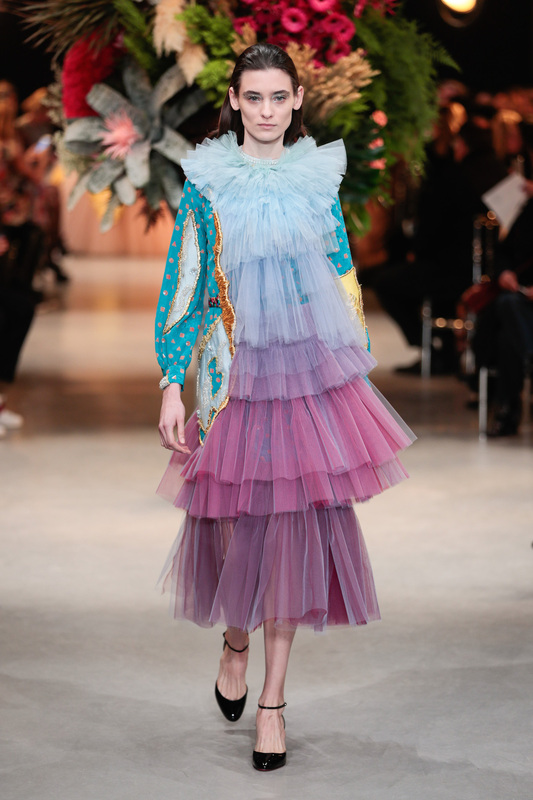 The color scheme (that moved from brights to pastels) worked gorgeously as did they interplay of sheerness, highly decorated jacquards, polka dots, checks and thick layers of 3D tule. 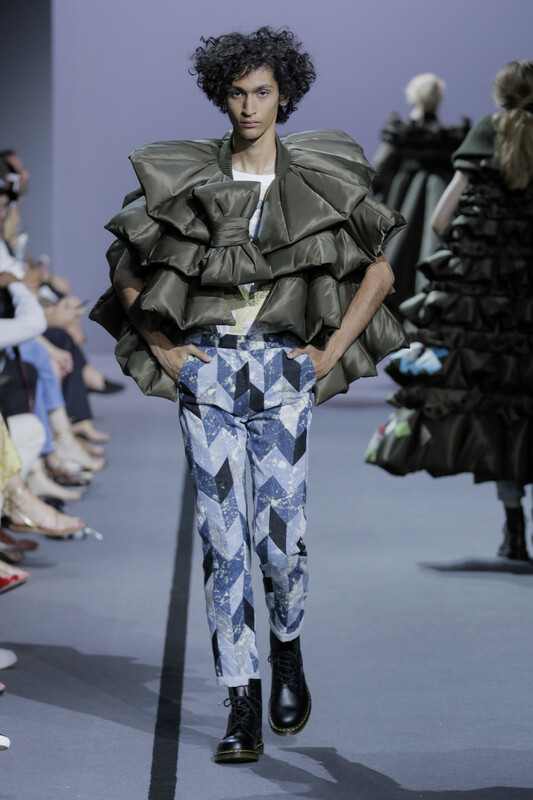 Viktor and Rolf even pulled off some impressive couture pants. 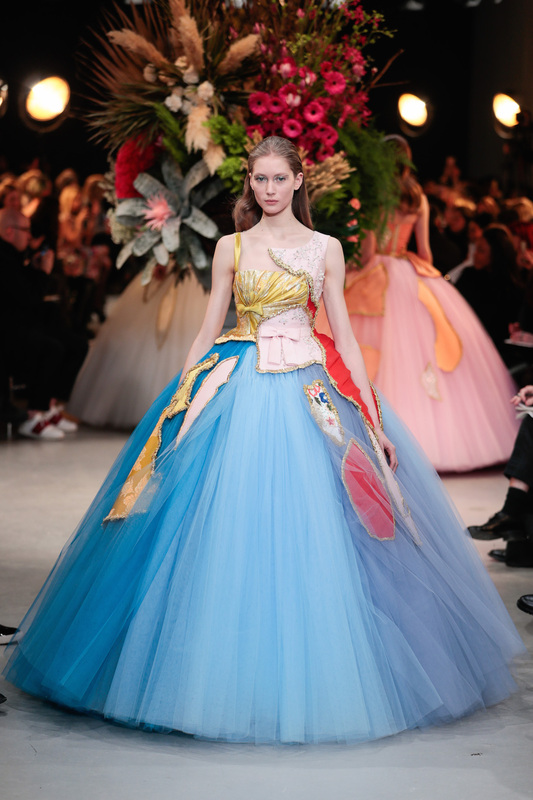 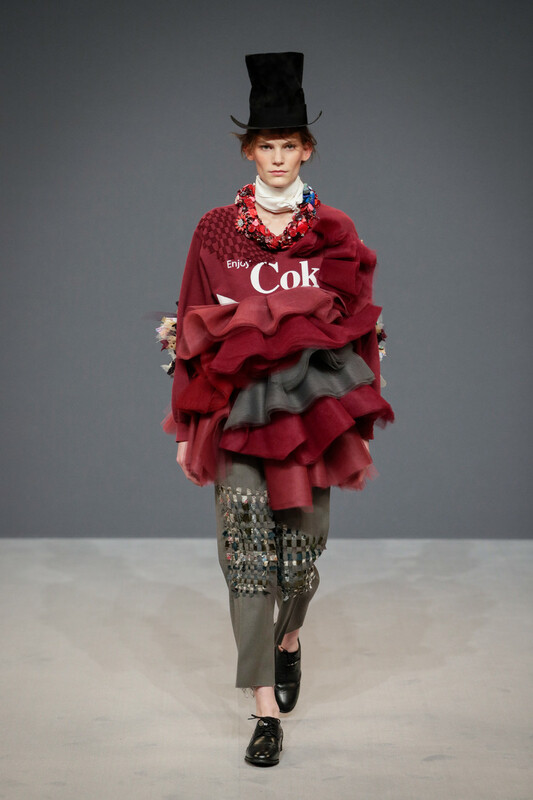 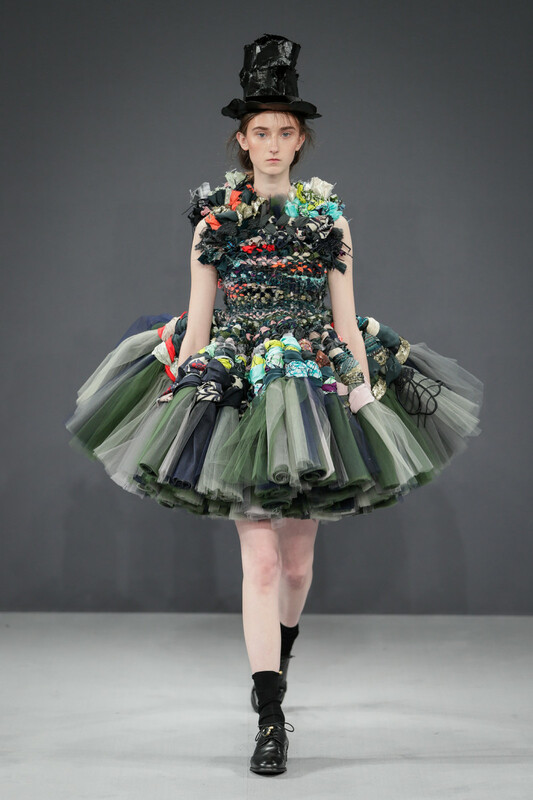 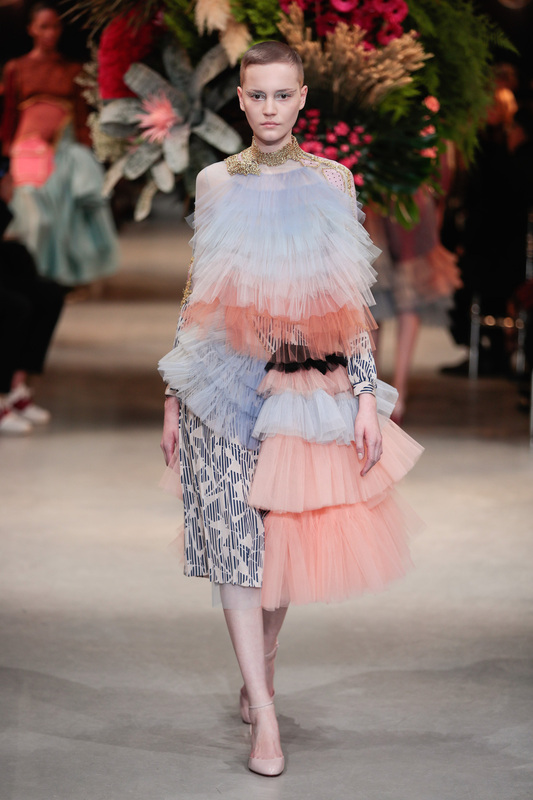 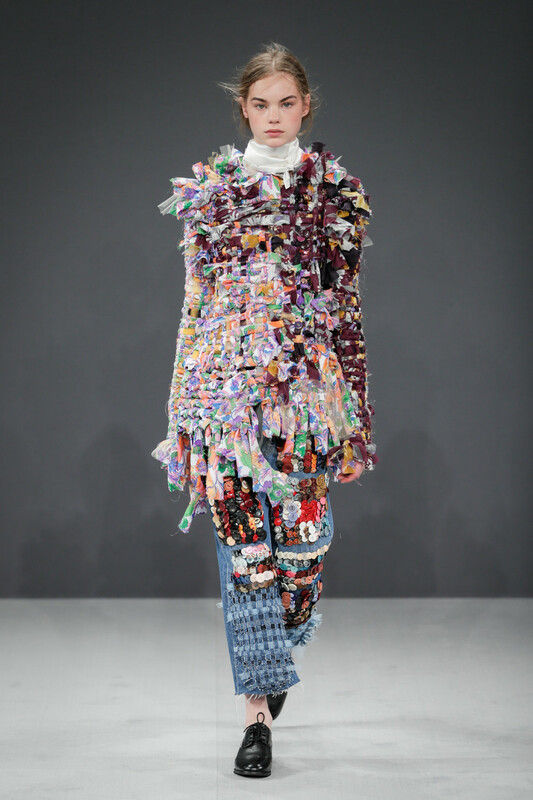 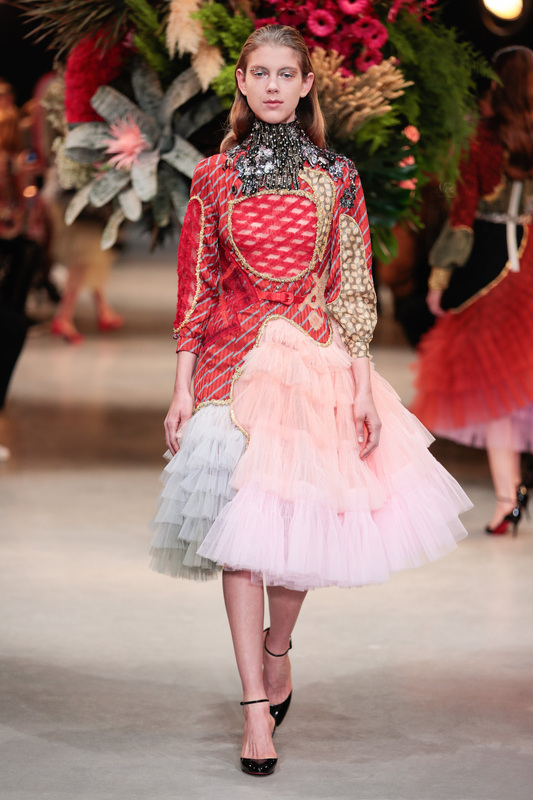 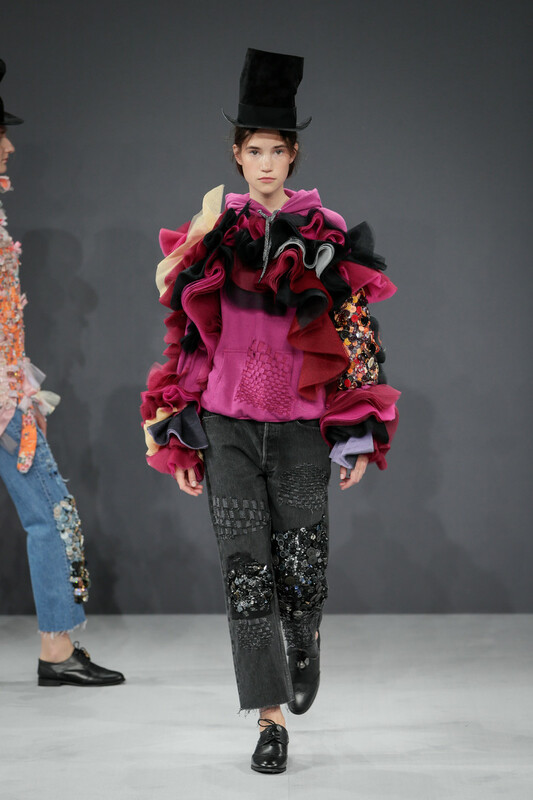 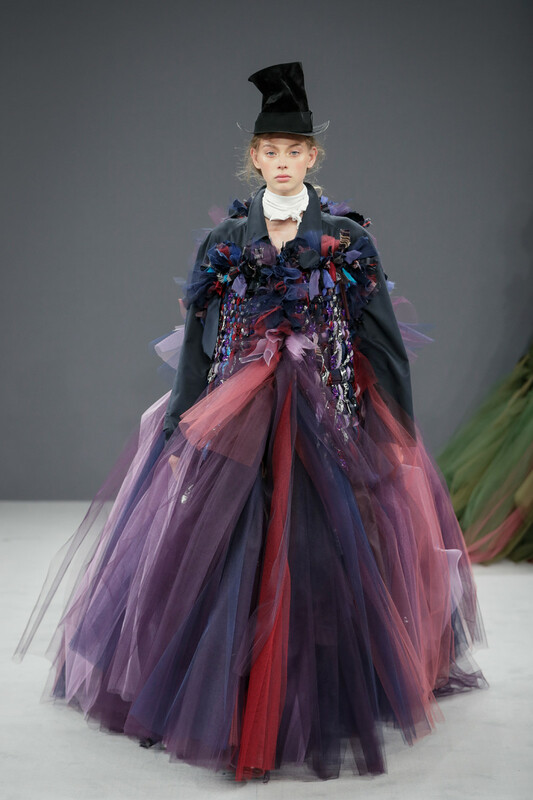 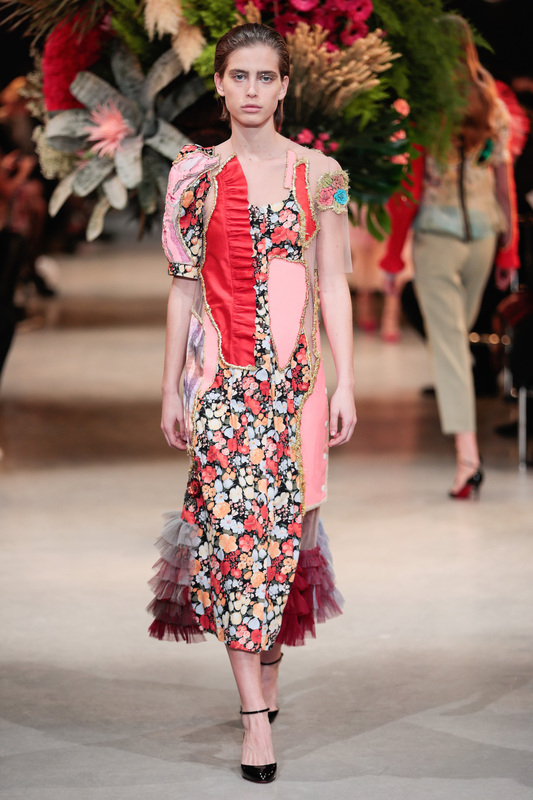 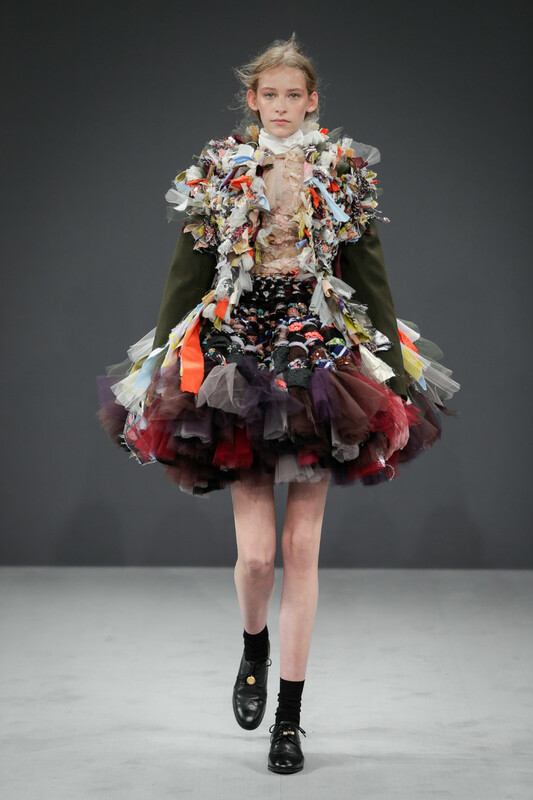 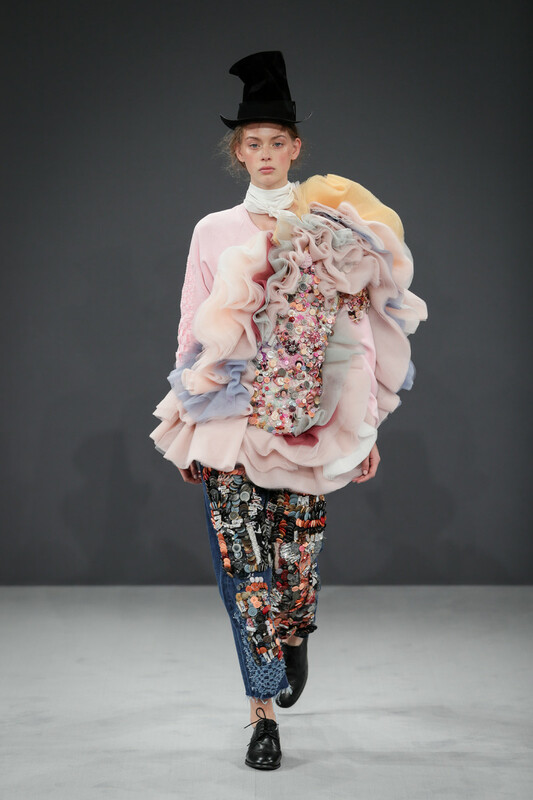 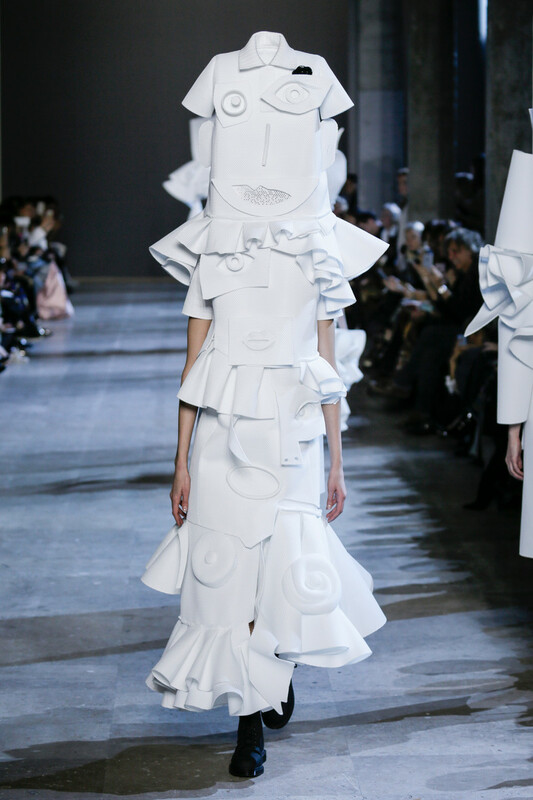 And believe it or not this collection even appeared quite wearable (given that it was haute couture and Viktor & Rolf). 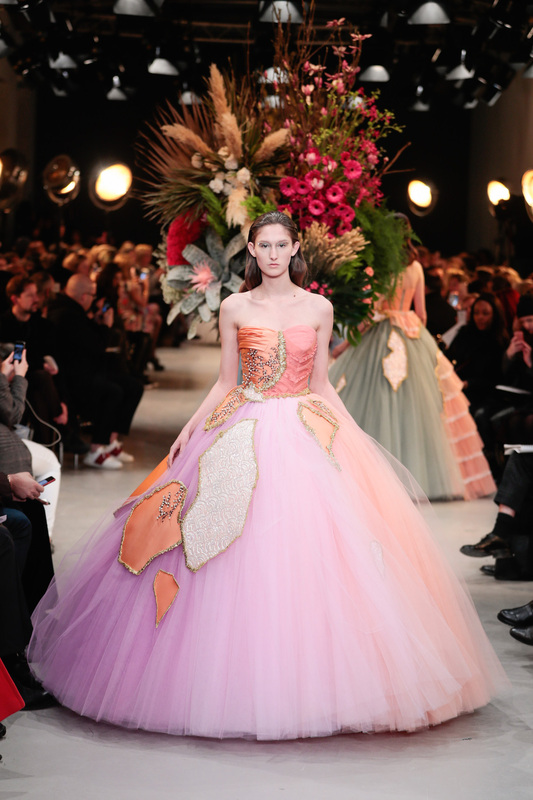 The finale of five different (broken) dream dresses was every girls fantasy. 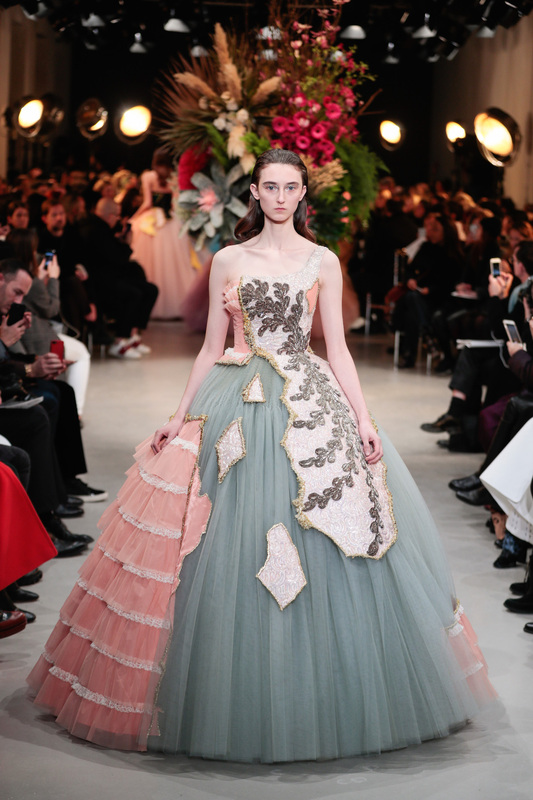 The deep green cut-outs attached to the light pink gown (look 28) was the perfect couture gown mash up. 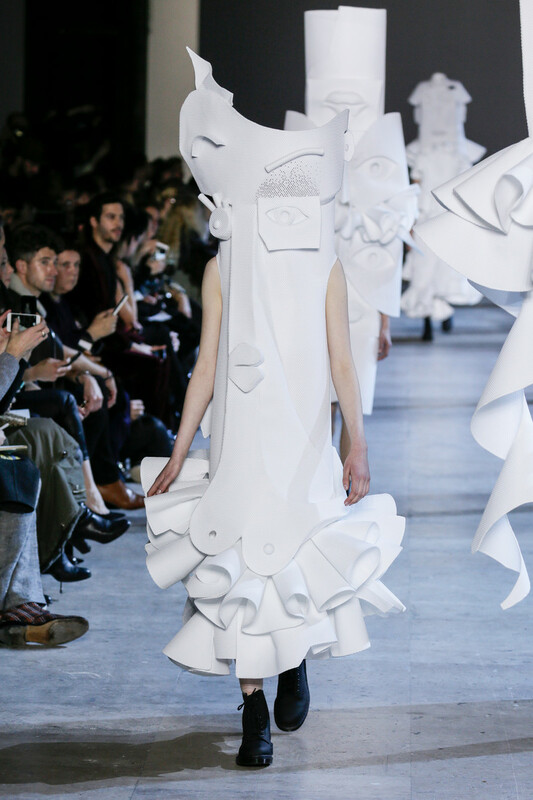 Couture collage done like only Viktor & Rolf would. 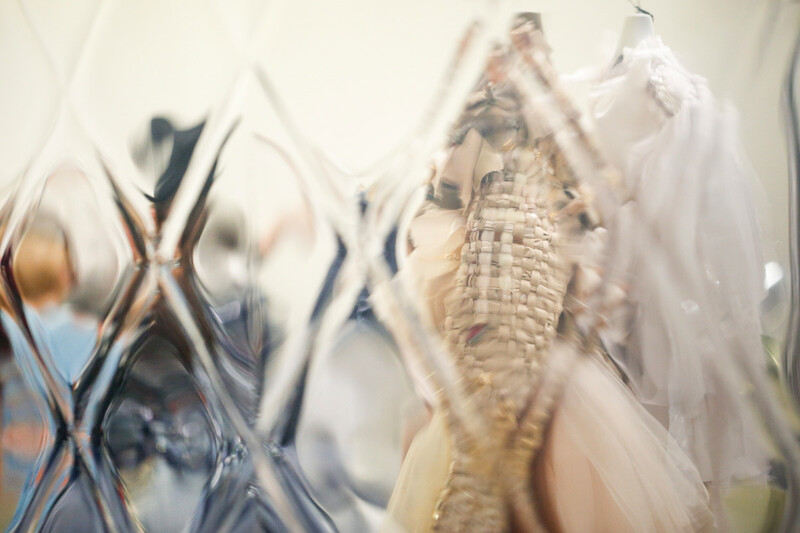 Can you tell we’re head over (their shiny, ankle strap) heels? 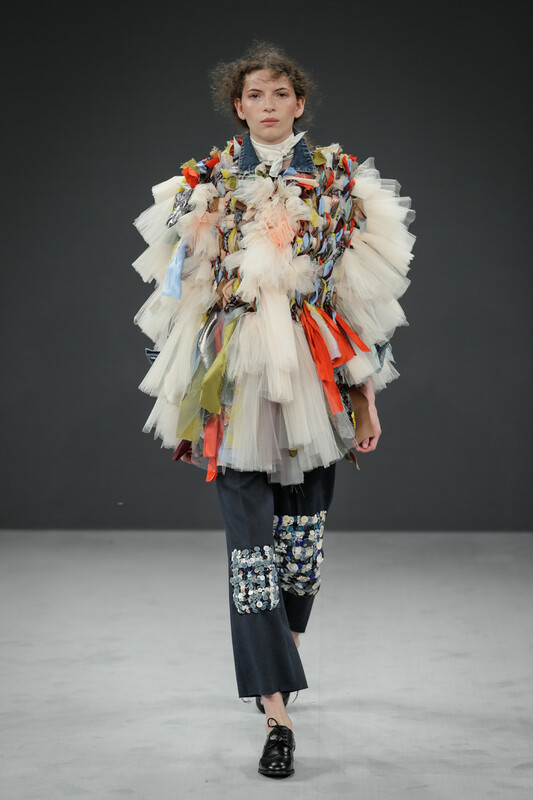 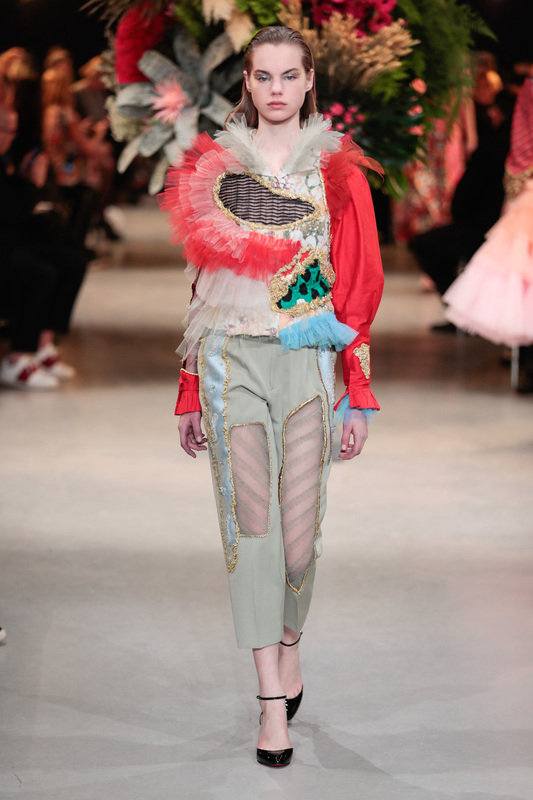 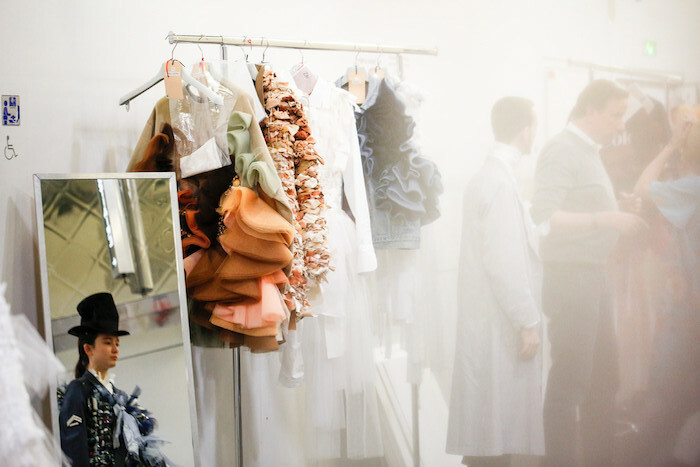 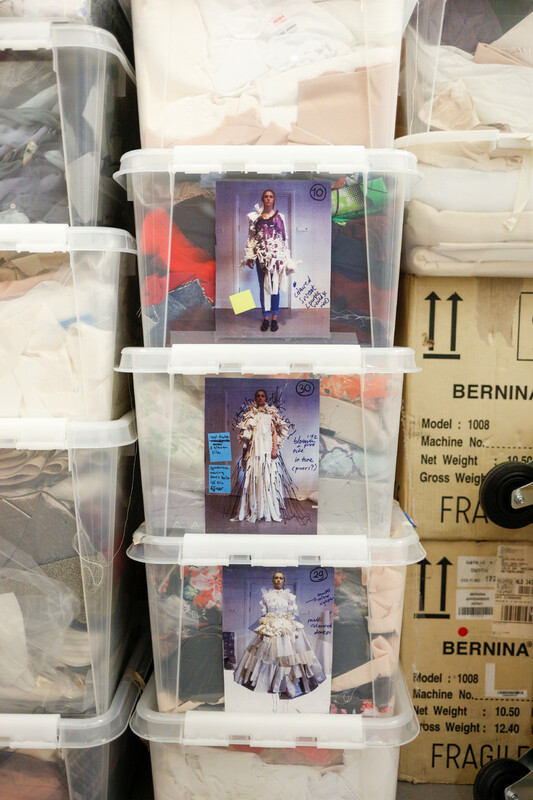 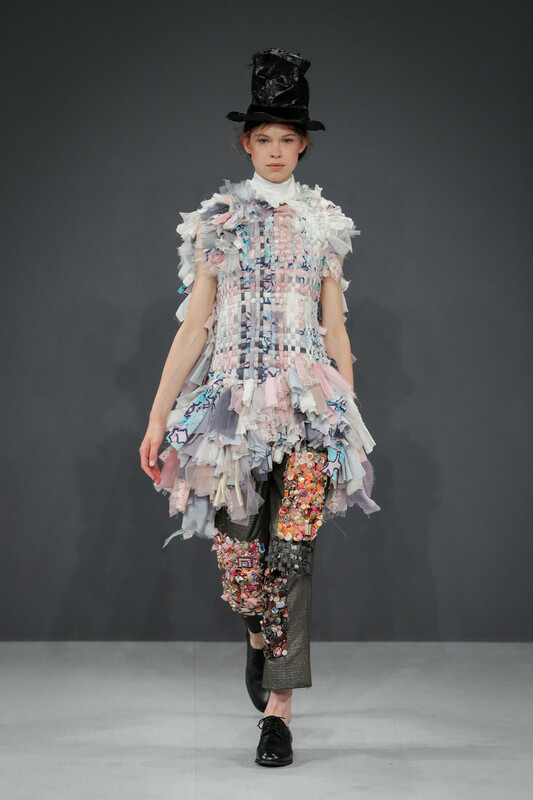 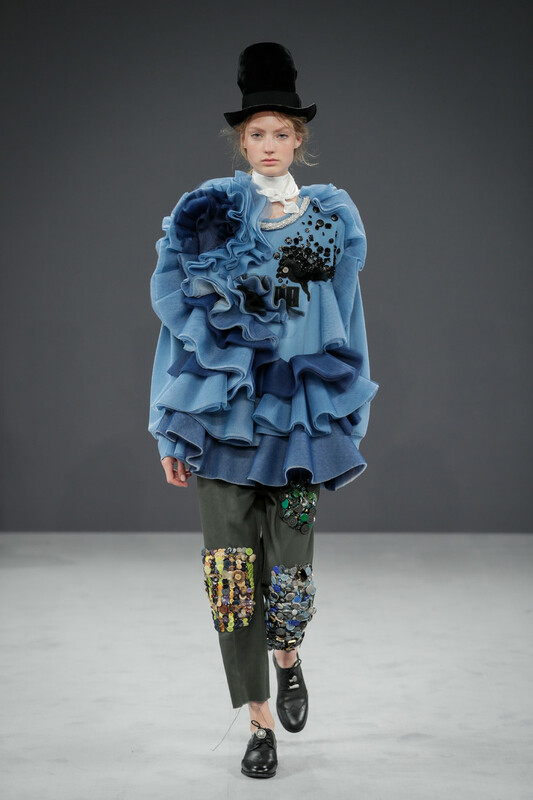 Viktor Horsting and Rolf Snoeren have kept everything from their old collections, even the leftover silver sequins from the collection that won the Dutch duo top prize at the Hyères festival back in 1993. 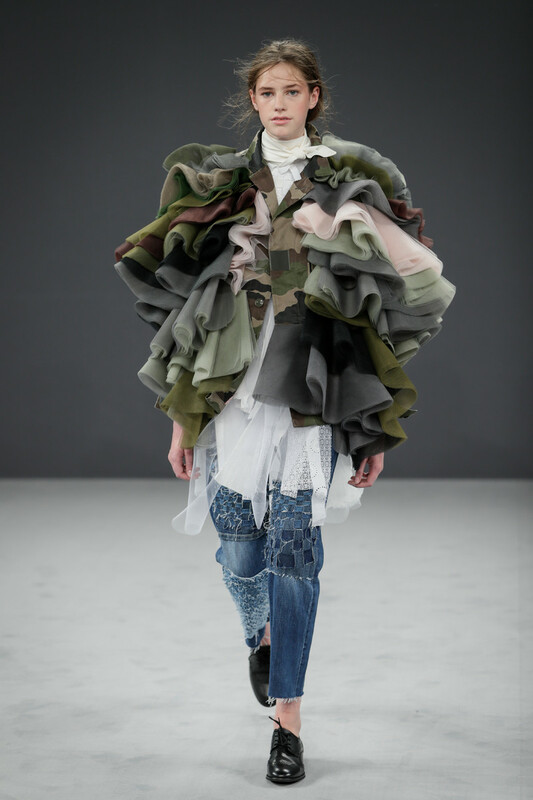 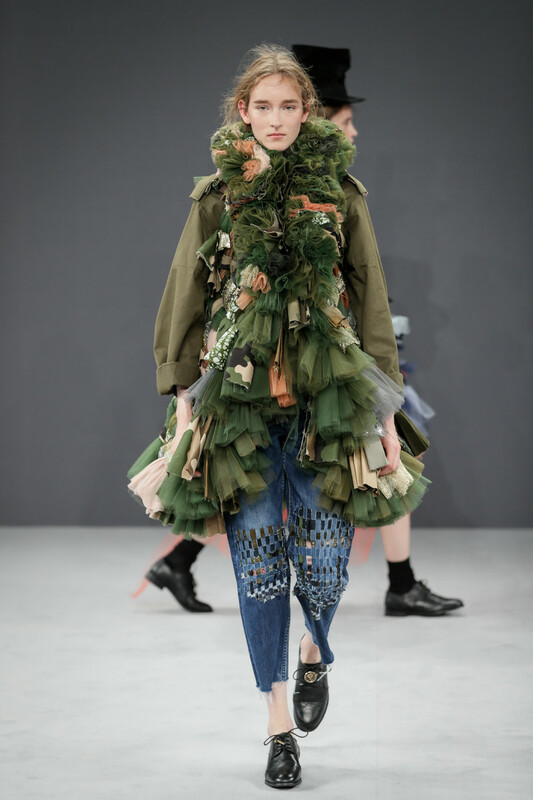 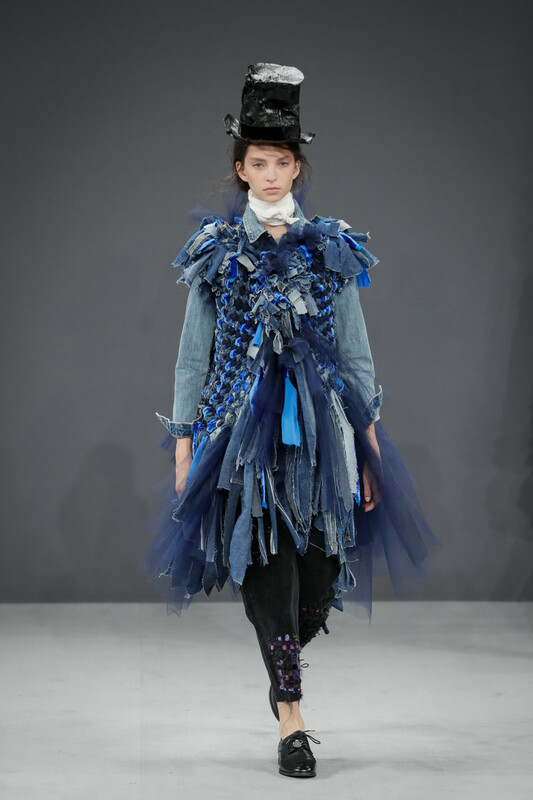 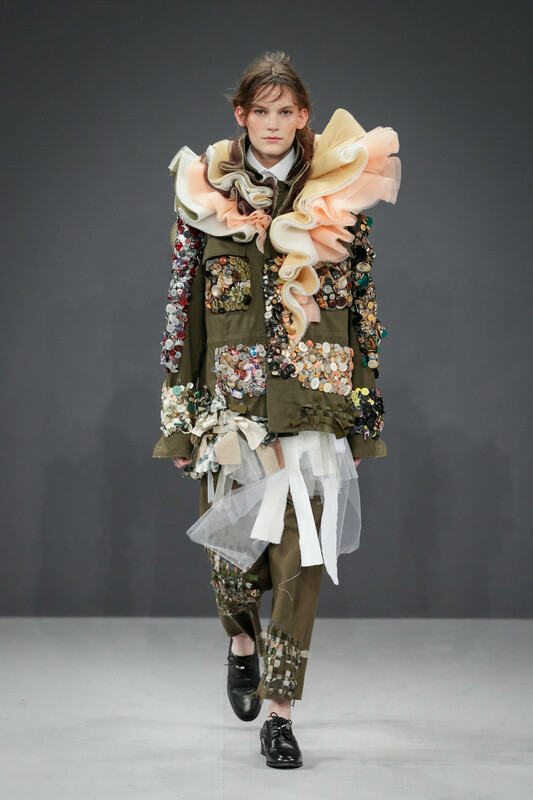 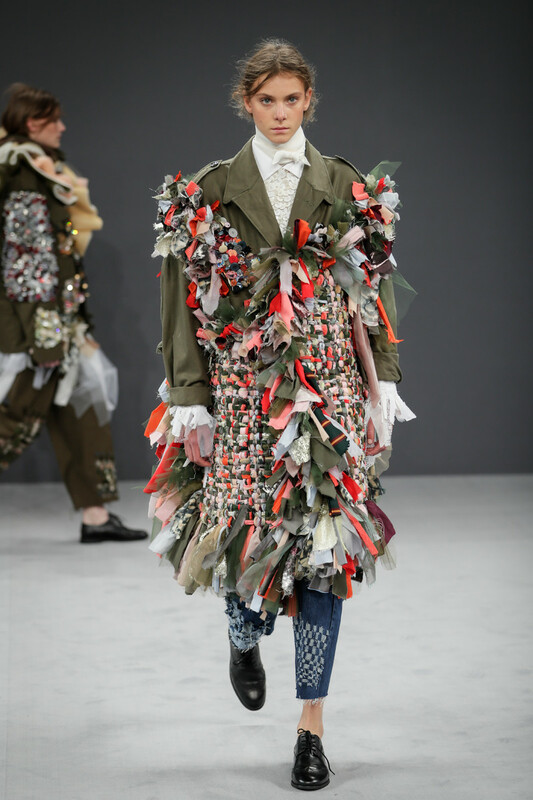 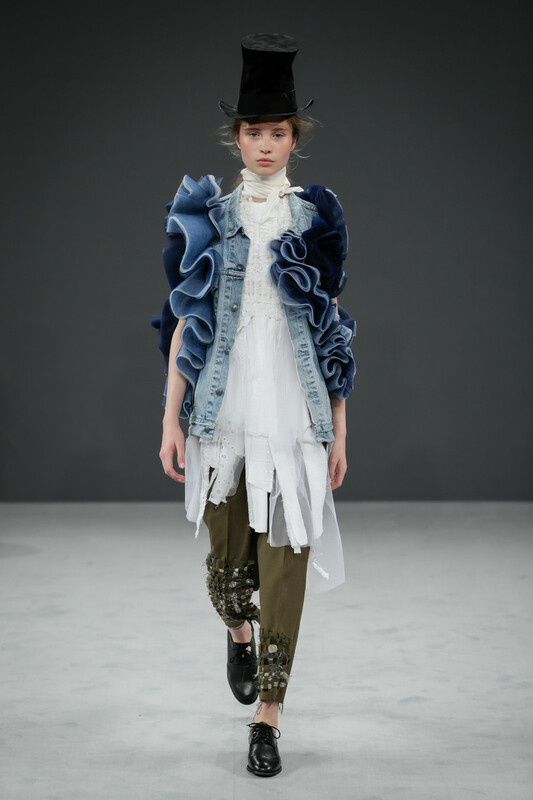 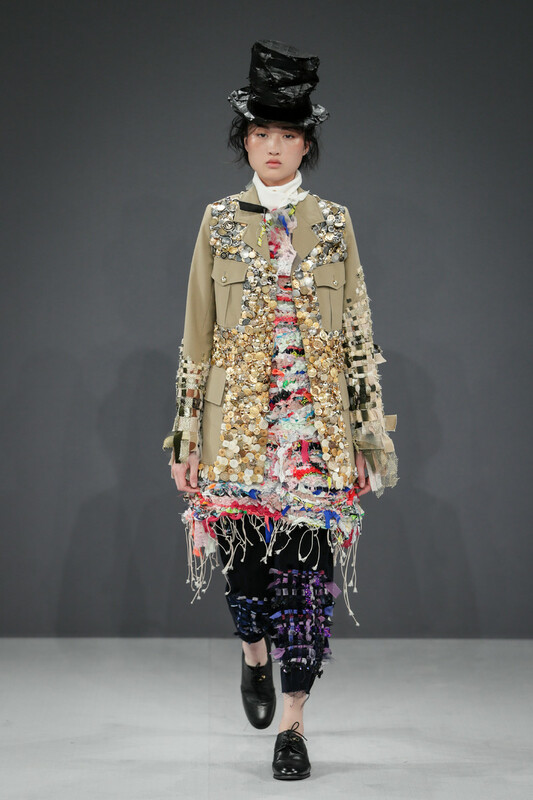 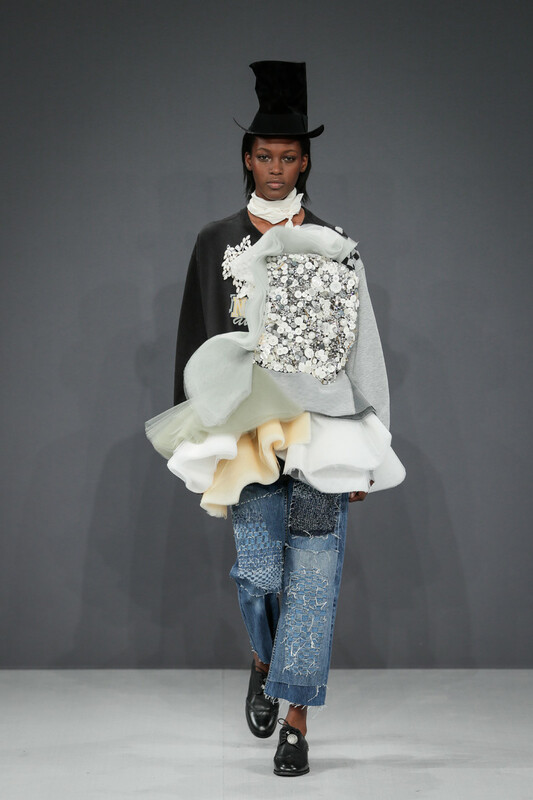 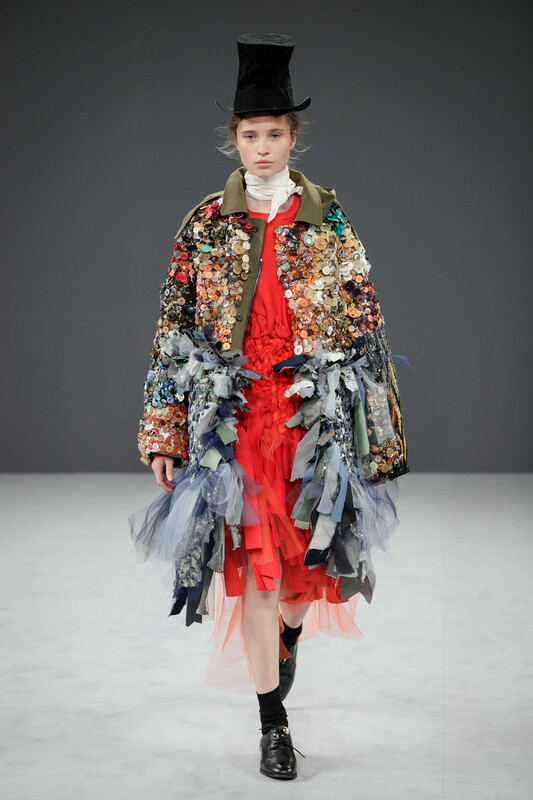 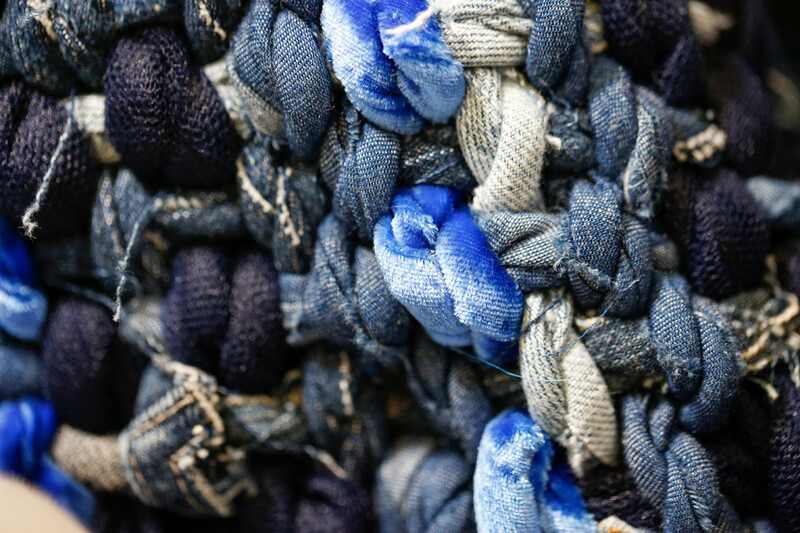 They repurposed those sequins, and scraps from collections across their career, for their fall couture collection, weaving their own fashion history into rag-rug embellishments on vintage trenchcoats, military jackets, sweatshirts and denim. 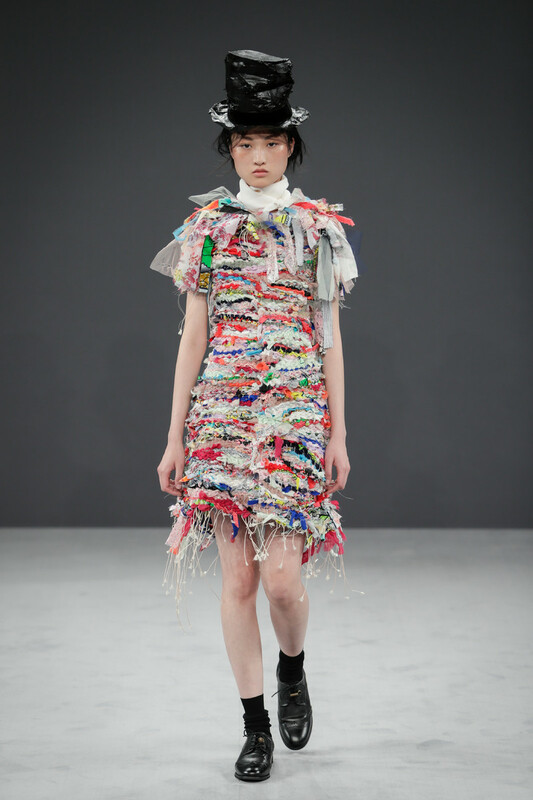 Their impulse was sustainability — and to challenge themselves to create something different from fragments of the past. 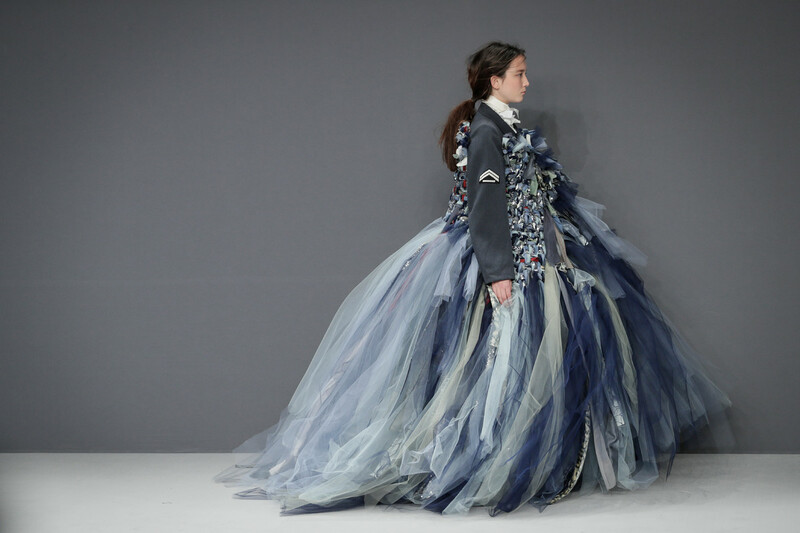 There were bits from their “Blue Screen” and “Van Gogh” shows — fall 2002 ready-to-wear and spring 2015 couture, respectively. 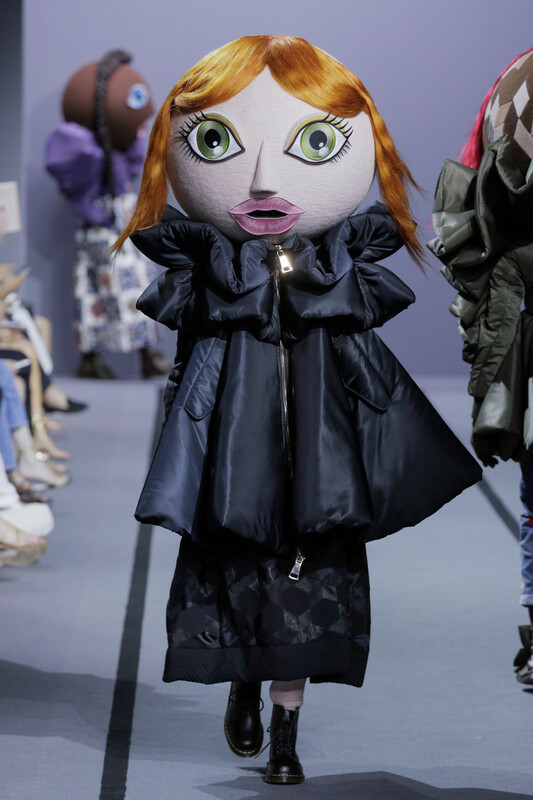 Beyond the fabrics, the silhouettes referenced past Viktor & Rolf shows, particularly the bulging finale coats, recalling their “Russian Doll” collection. 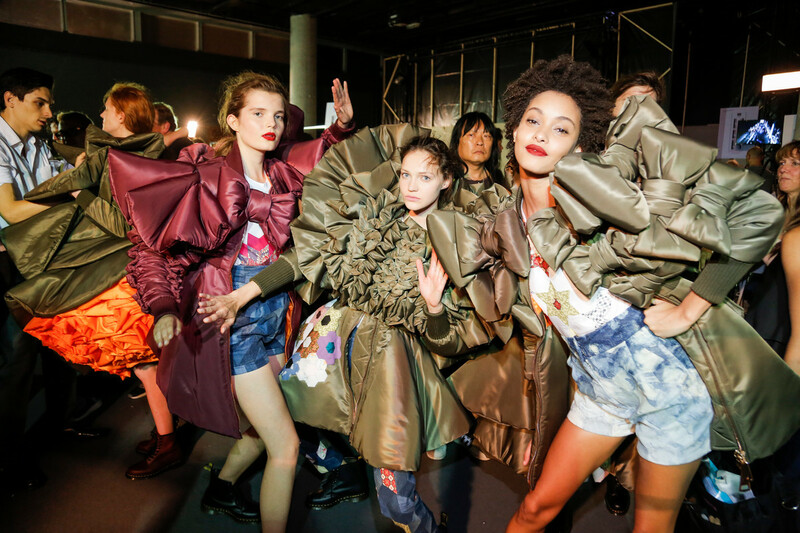 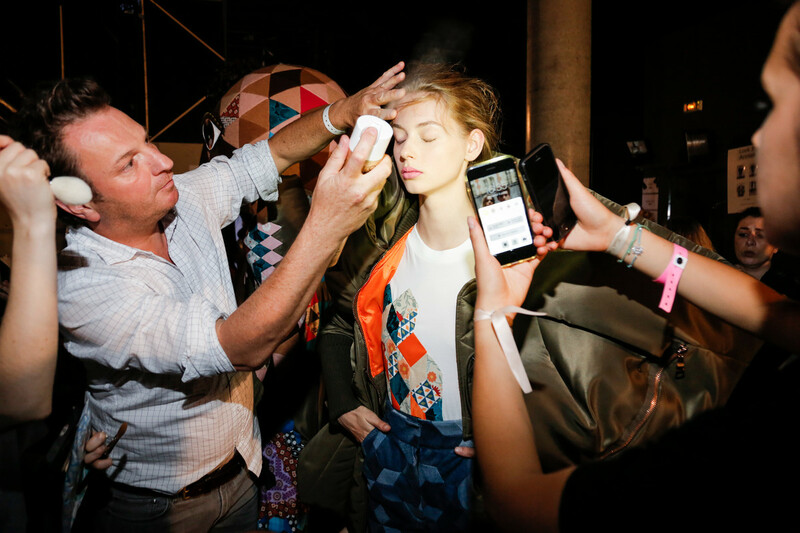 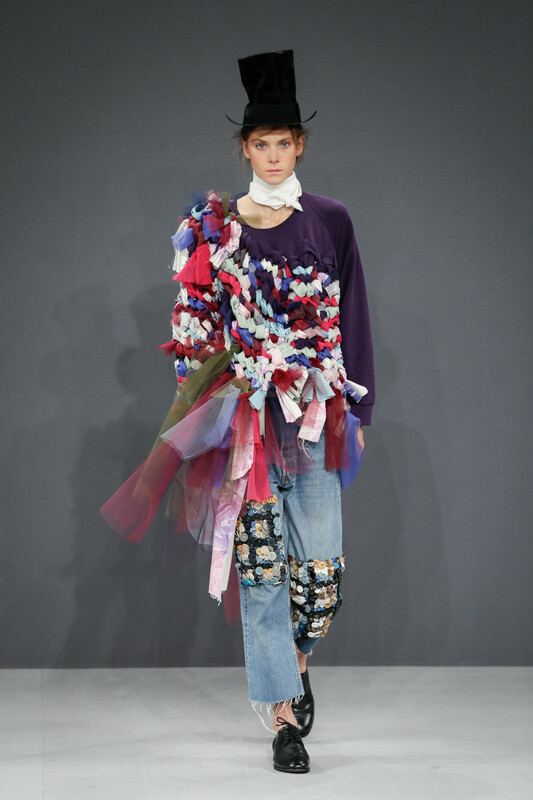 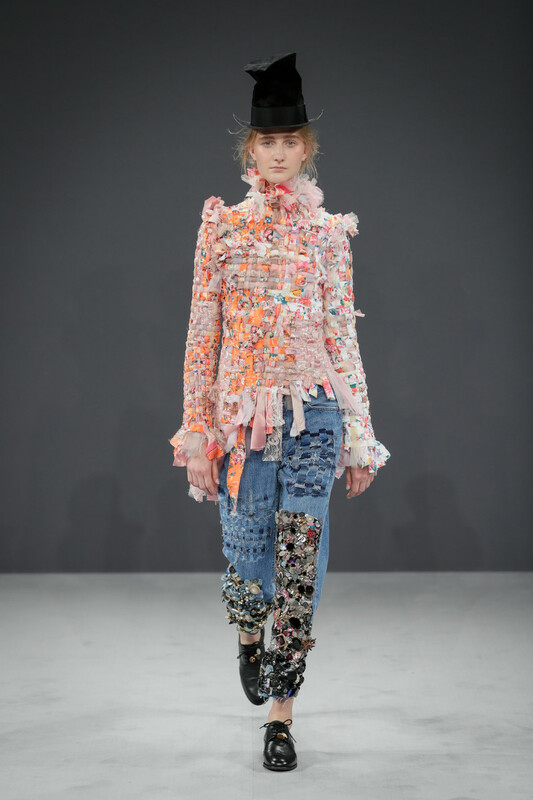 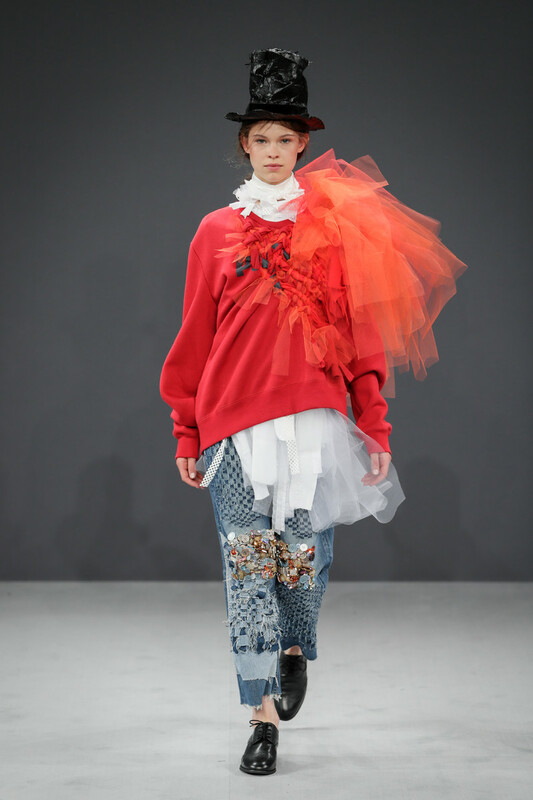 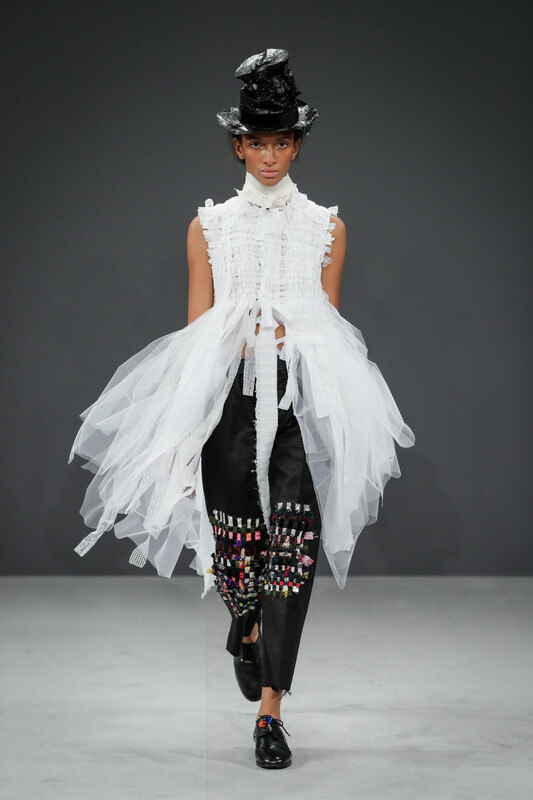 The sweatshirts and military jackets were marvels of jutting ruffles and twinkling patches of vintage buttons and errant crystals, the patches repeating on cropped jeans and khakis. 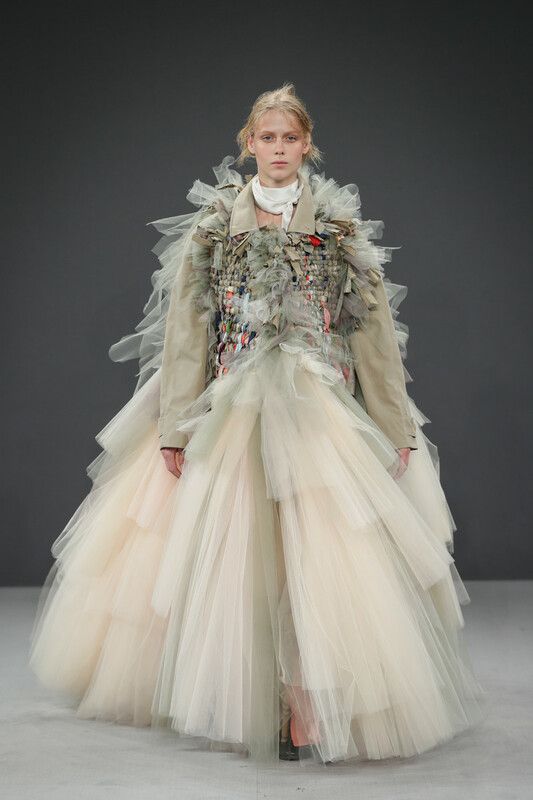 The show reached a dramatic crescendo with a clutch of trenchcoats that morphed into full-skirted ballgowns, scraps of tulle tinted into delicate dégradés. 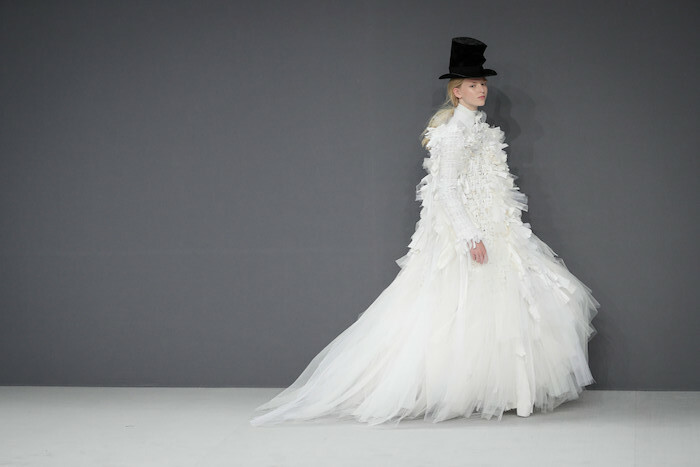 The white gown that capped the display also winked to Viktor & Rolf’s next move: A collection of wedding dresses to debut in October during New York Bridal Week. 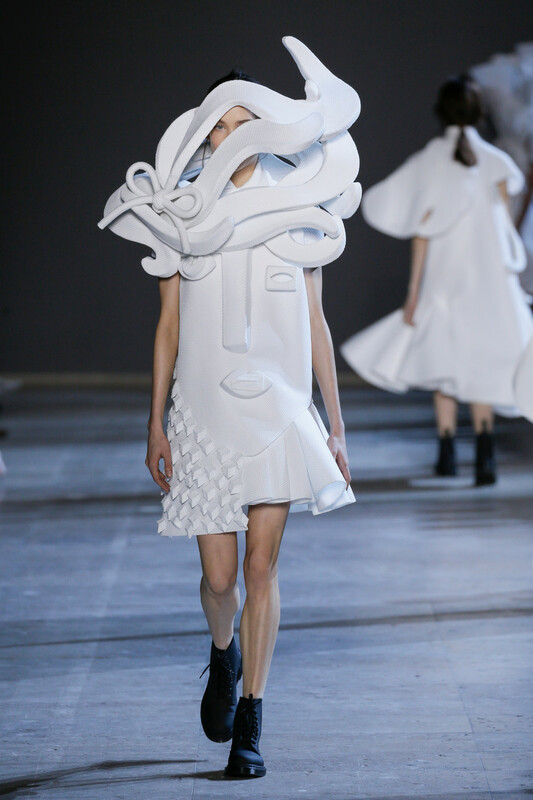 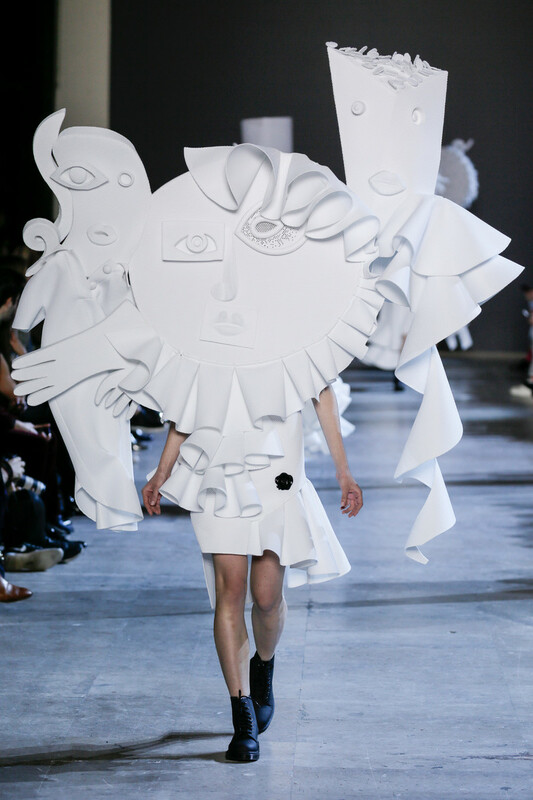 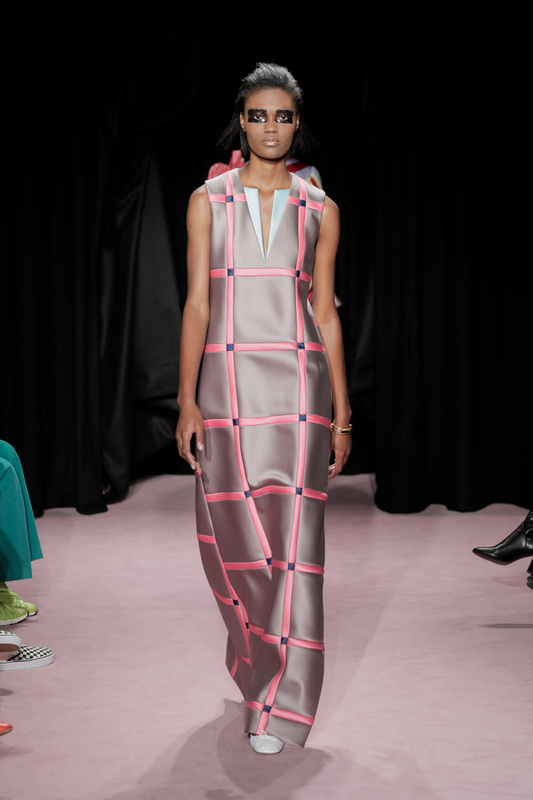 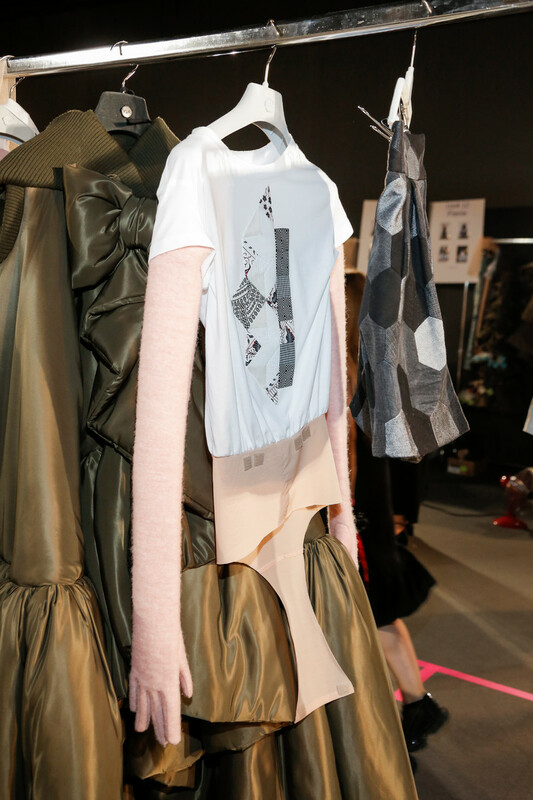 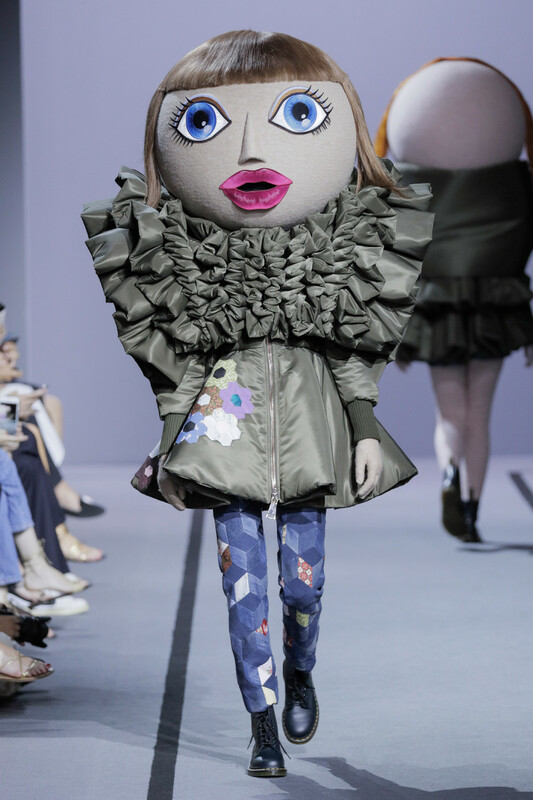 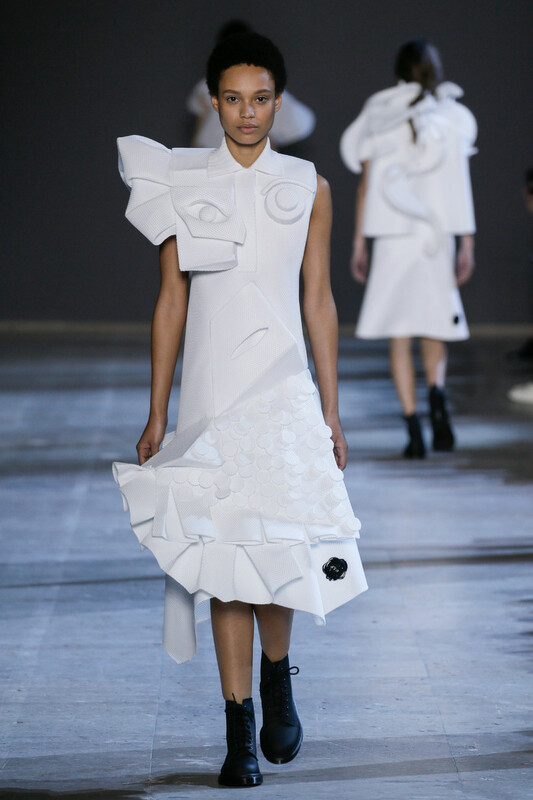 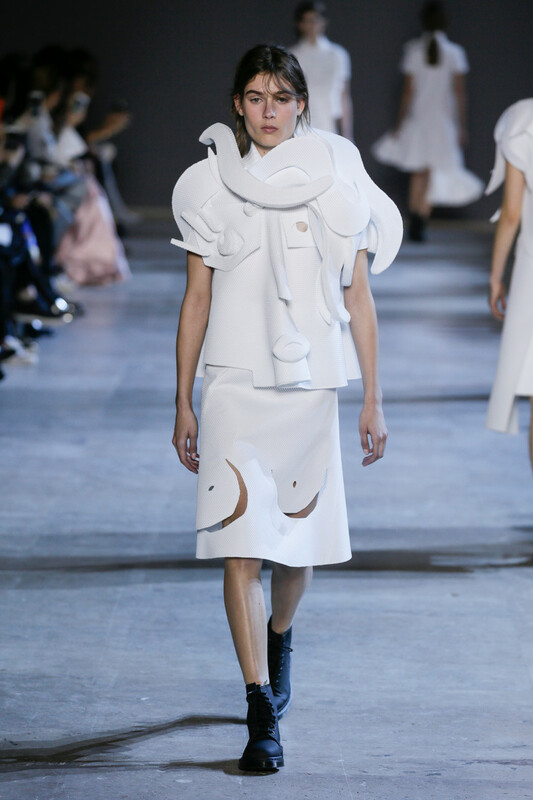 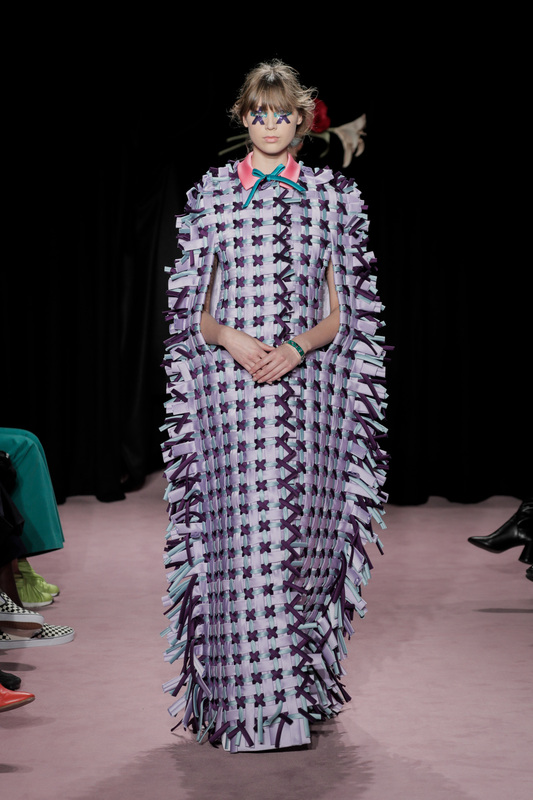 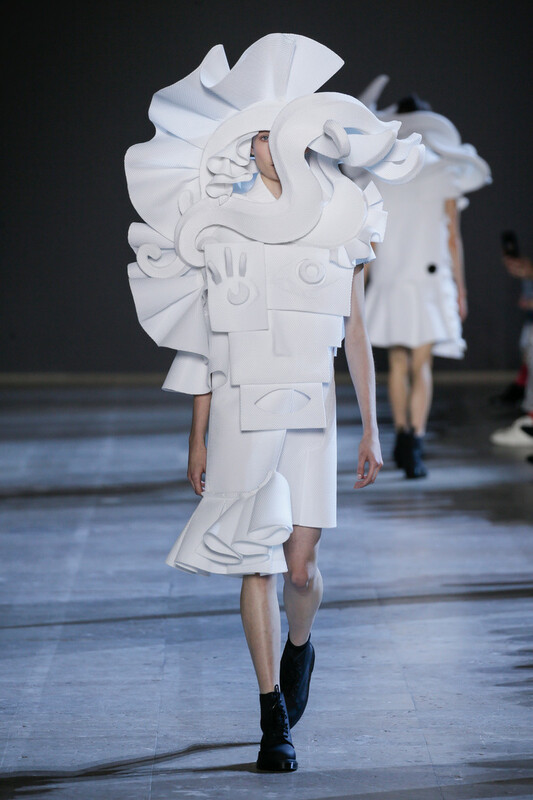 Leave it up to Viktor & Rolf to blow our minds with a collection of wearable art (turning into almost unwearable art). 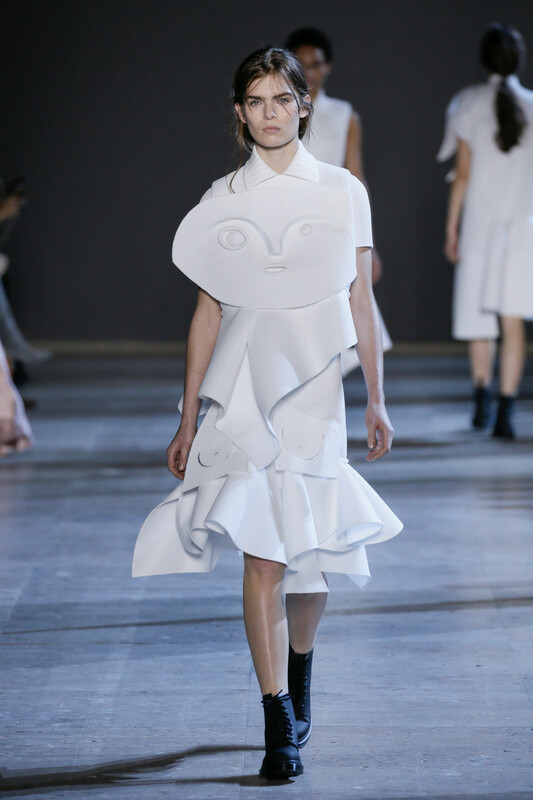 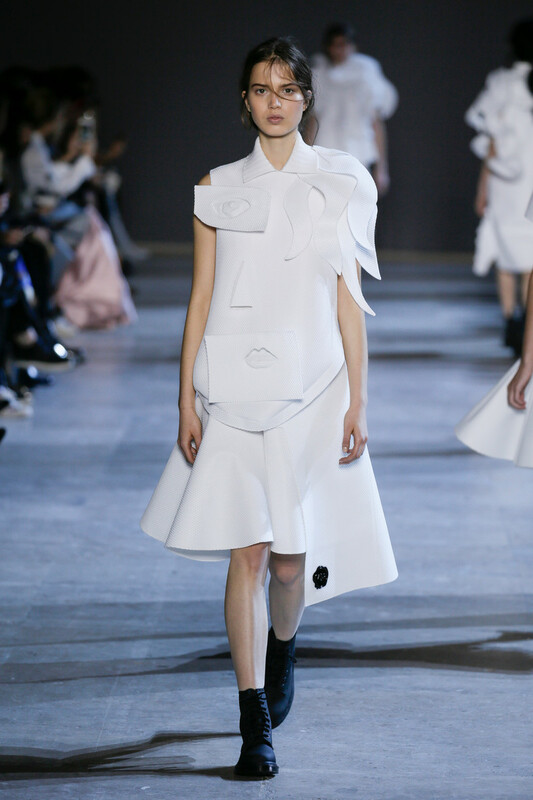 Starting off with a perfect cute little white polo dress inspired by Cubist portraits the couture pieces got bigger and bolder with every single look. 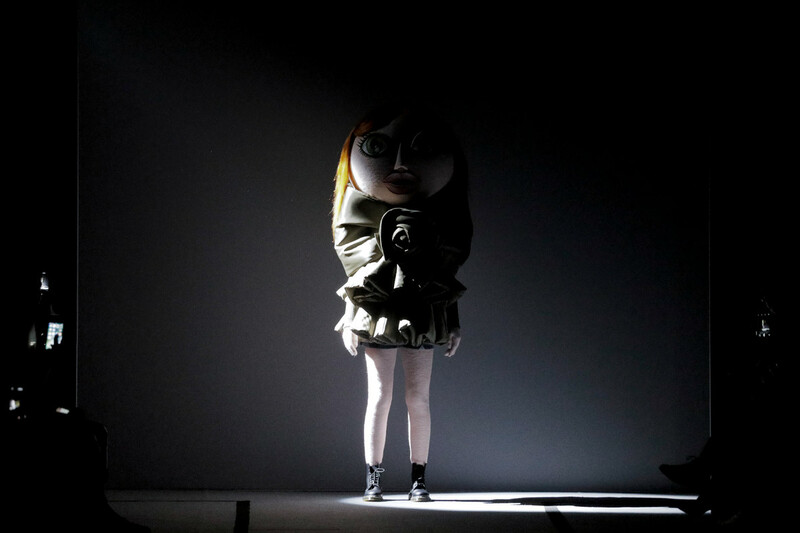 Slowly yet steadily turning that girl in the little white dress paired with the latest black shaded Dr. Martens 1460 Ajax Boots into a girl sporting a larger than life white totem. 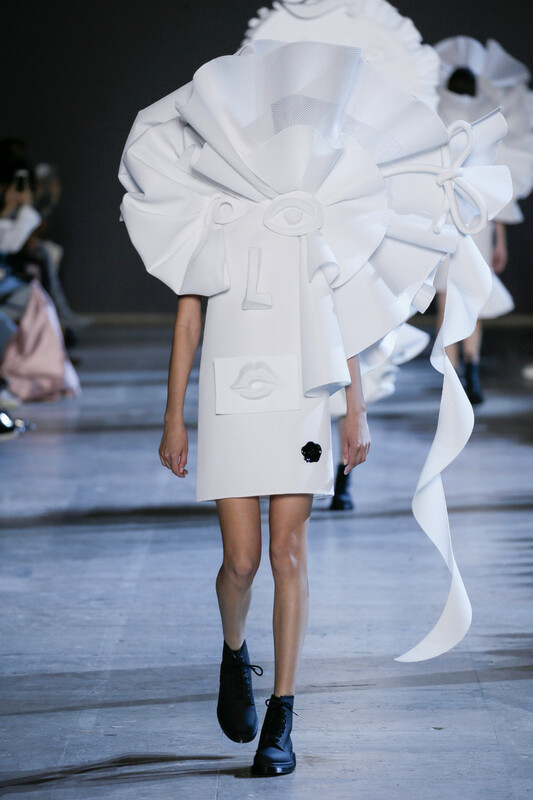 Eyes, noses and lips everywhere, in the mix with V&R’s signature sculptural XL ruffles and bows made out of a white technical piqué. 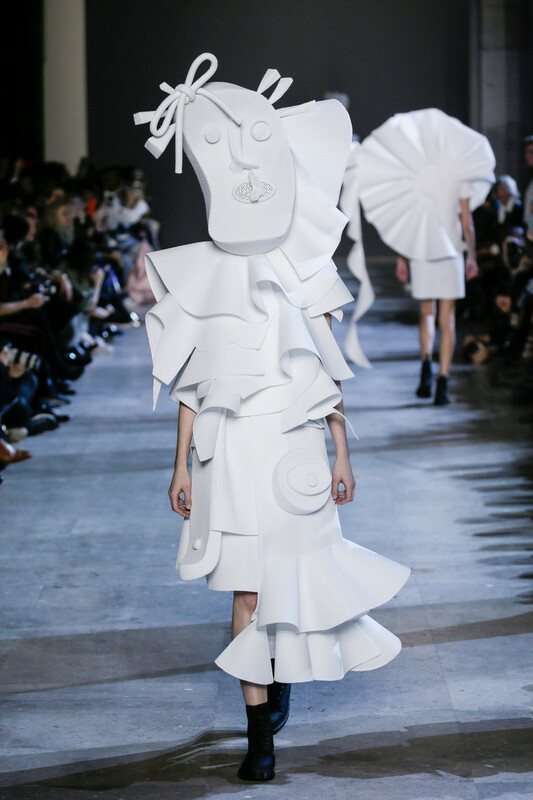 Walking couture sculptures, letting Viktor and Rolf focus on what they’re best at and what they love the most; designing pure pieces of art. 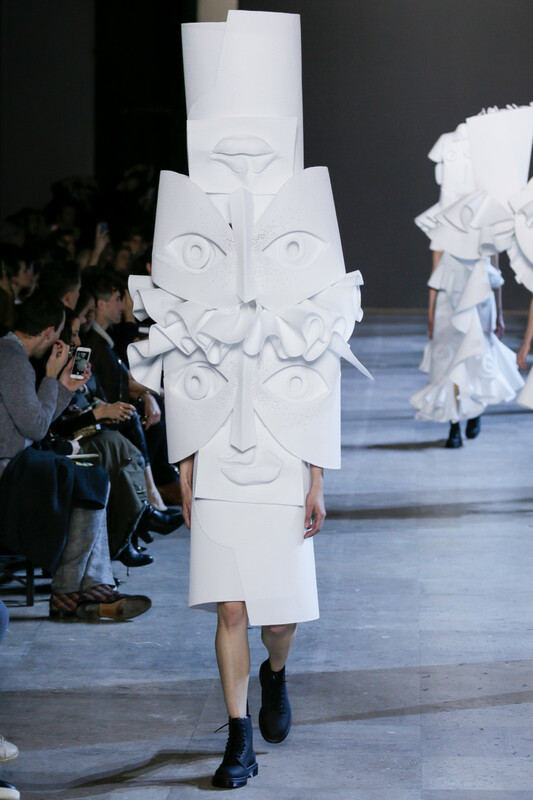 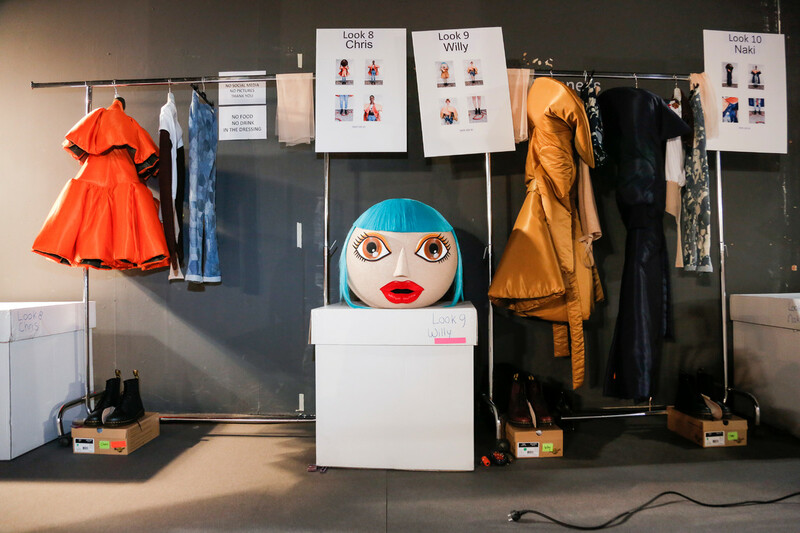 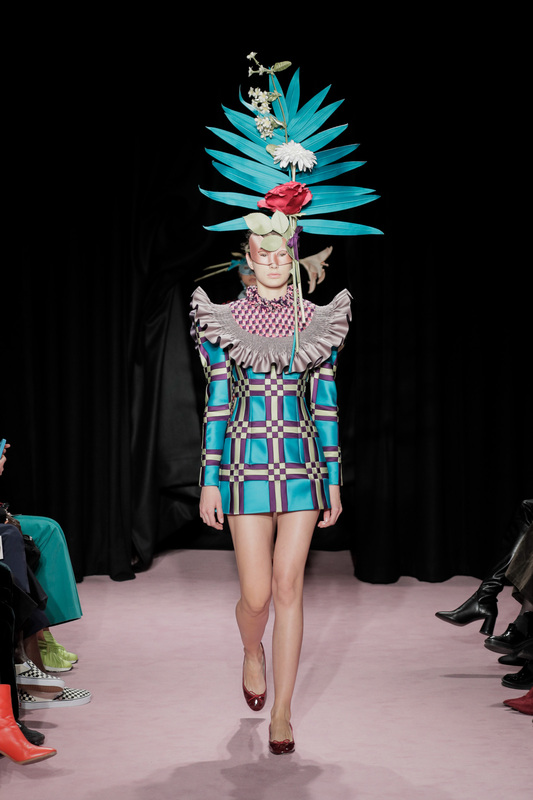 Creations not necessarily meant to be worn (although we’d love to see a totem look on some runway any time soon, what do you say front row guest Iggy Azalea..?) 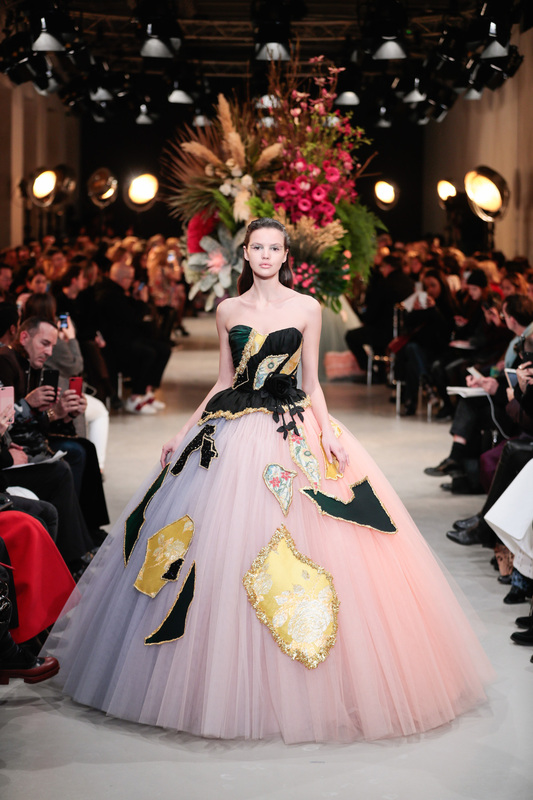 or make money with (V&R fragrances cover most of that part), but crafted couture to entertain and inspire. 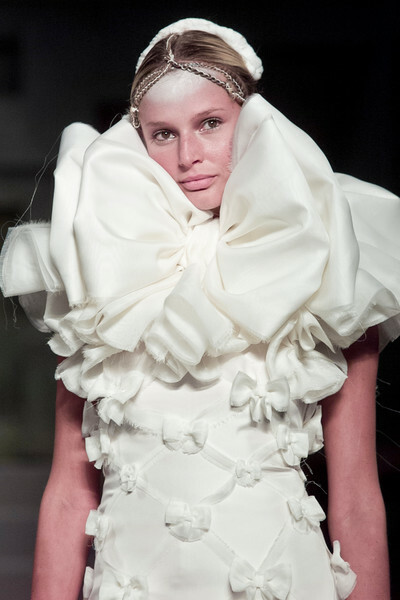 This was undoubtedly the most original take on the crispy white polo shirt we’ve ever laid our eyes on and we won’t soon forget. 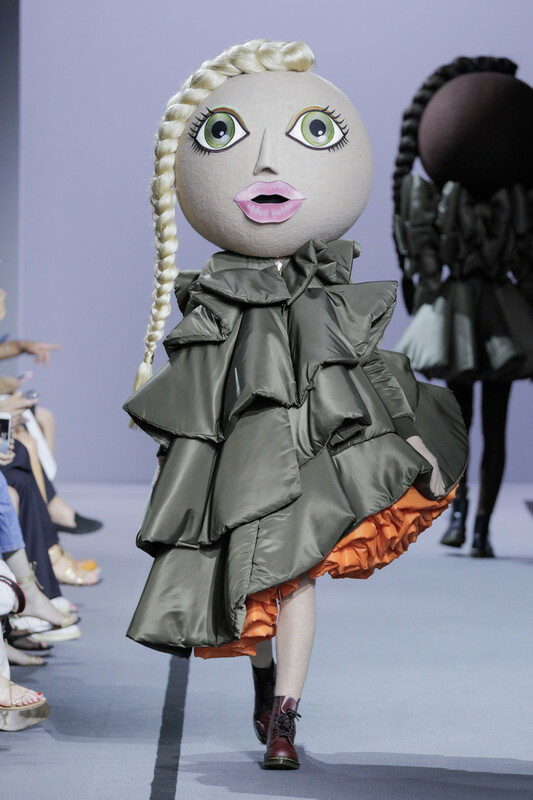 This morning the house of Viktor&Rolf announced via an exclusive story to WWD that it would stop creating and producing ready to wear after fall/winter 2015. 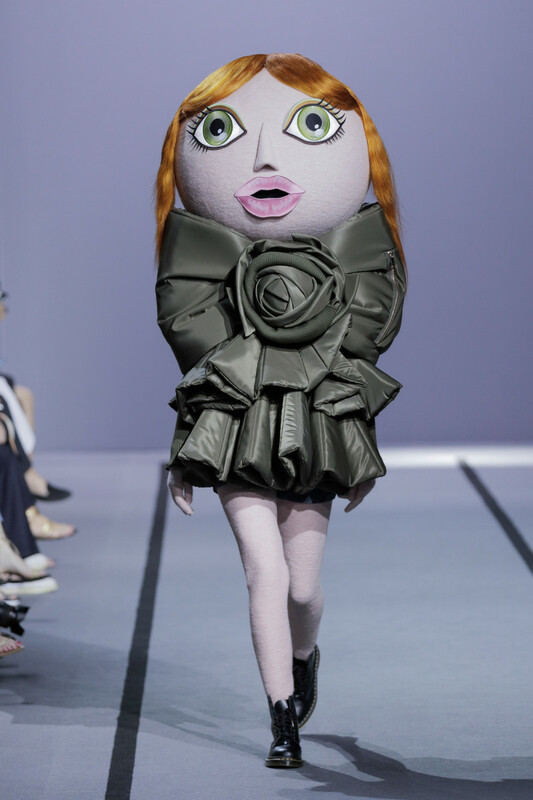 “Viktor & Rolf are to halt ready-to-wear following the fall-winter 2015 season and concentrate on couture, fragrances and licensed businesses. 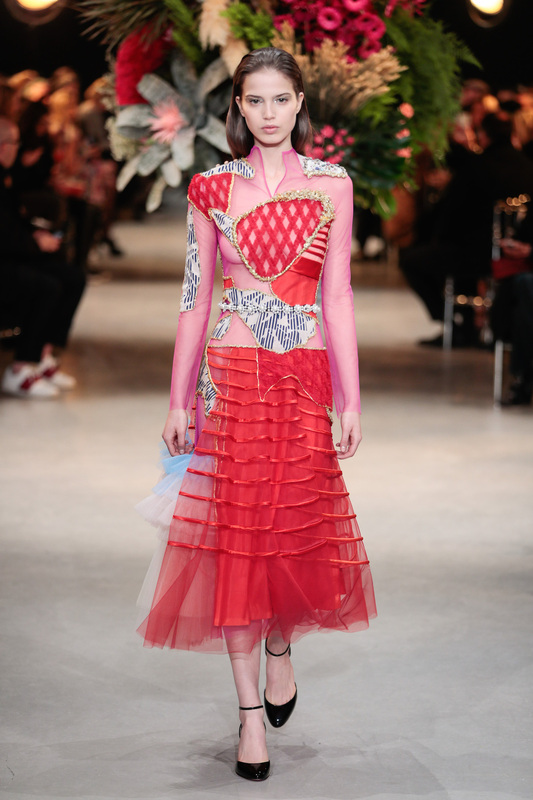 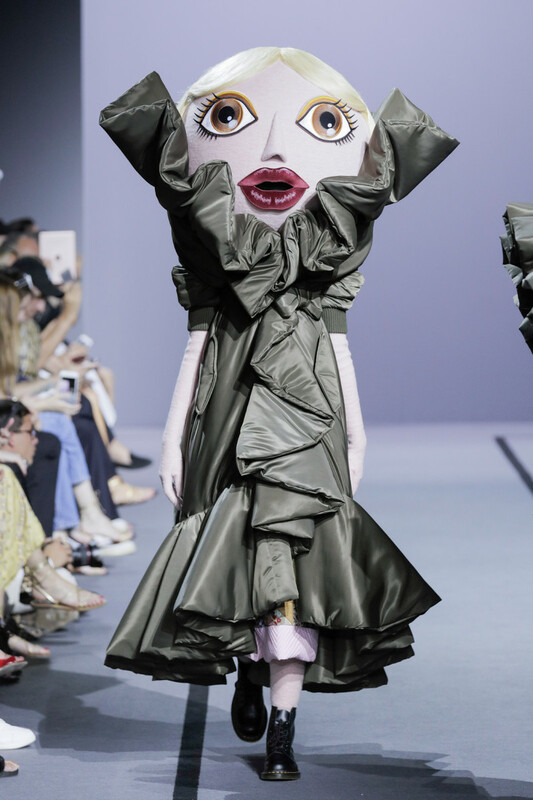 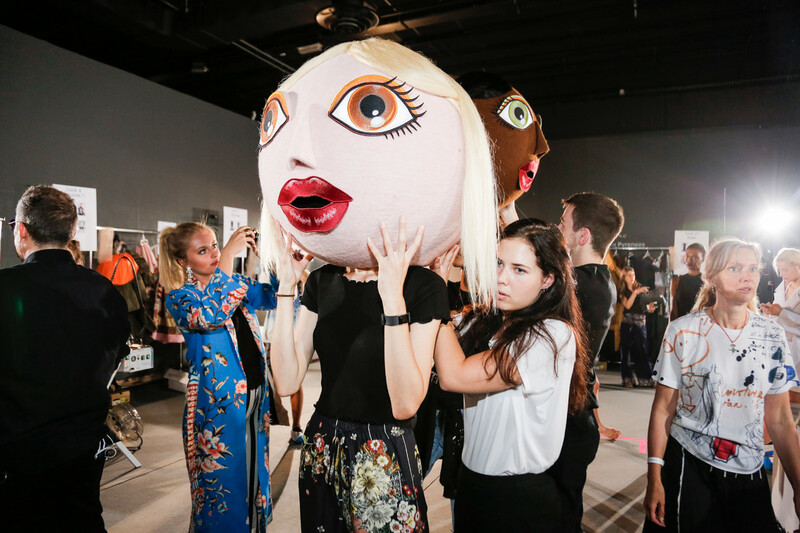 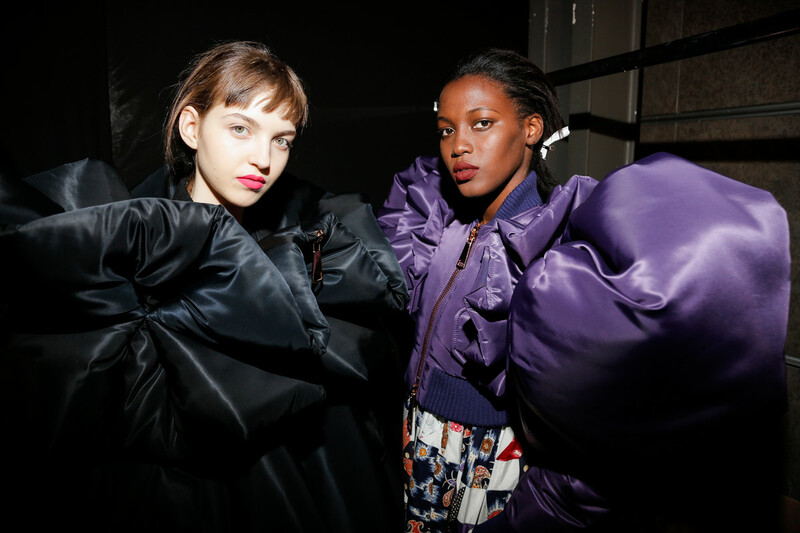 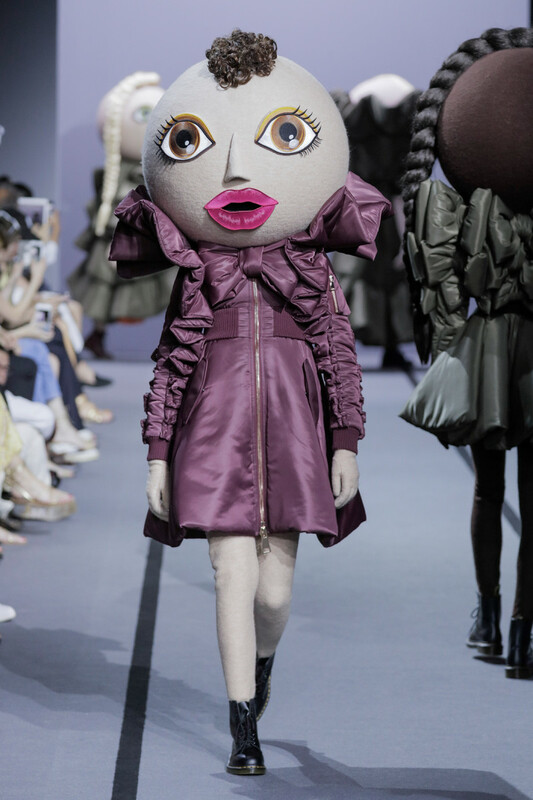 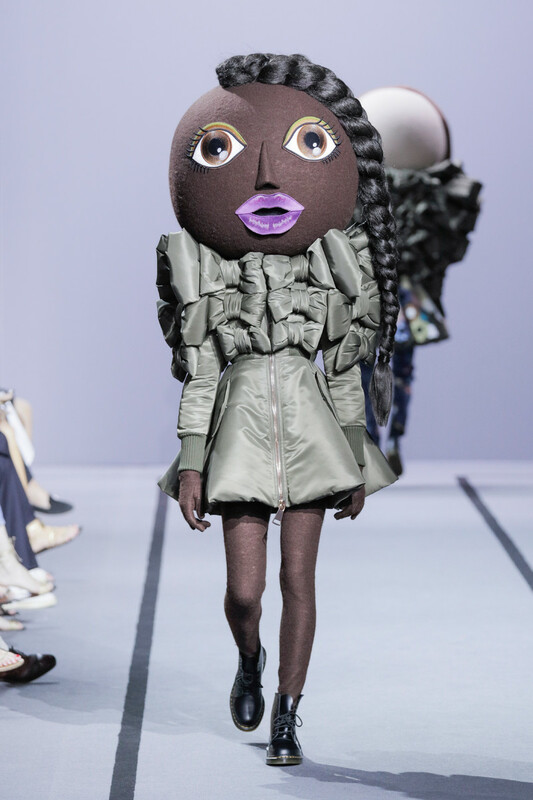 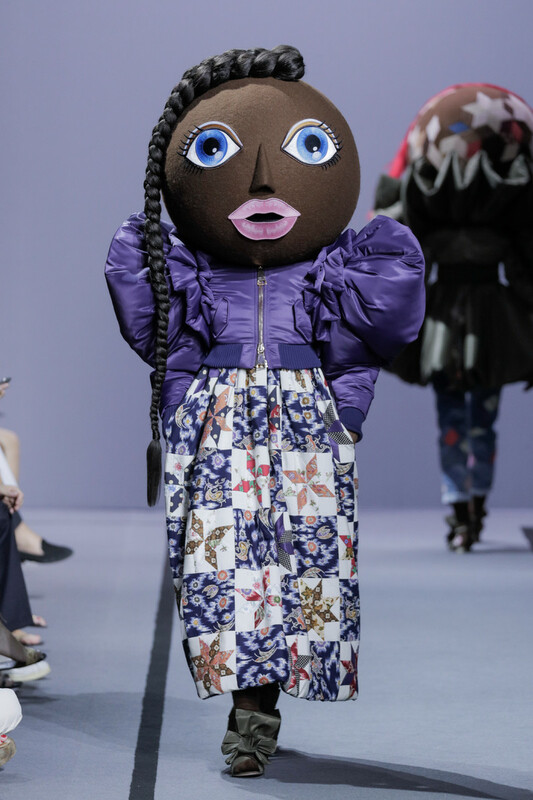 Disclosing the development first to WWD, Dutch designers Viktor Horsting and Rolf Snoeren said the decision was made in concert with majority shareholder OTB Group, the holding of Italian industrialist Renzo Rosso. 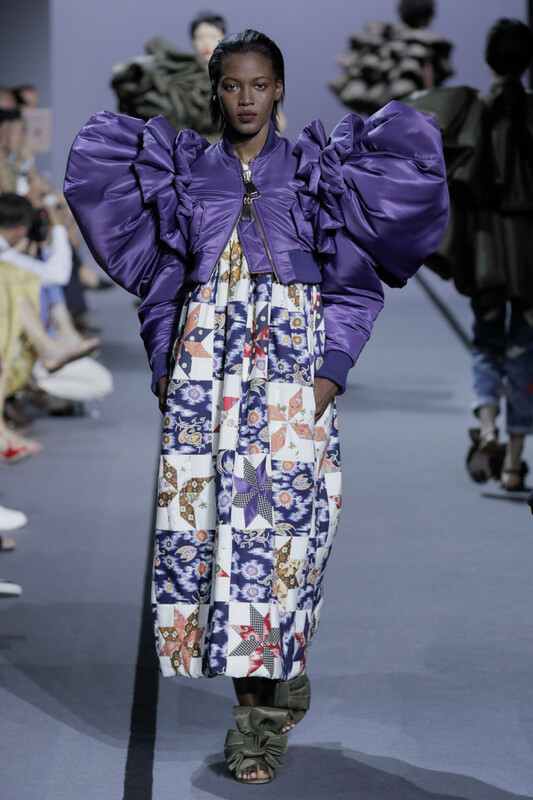 It echoes last fall’s bombshell when French designer Jean Paul Gaultier said he would shutter rtw after a 38-year career to focus on high fashions and the perfume business it fuels, along with special projects. 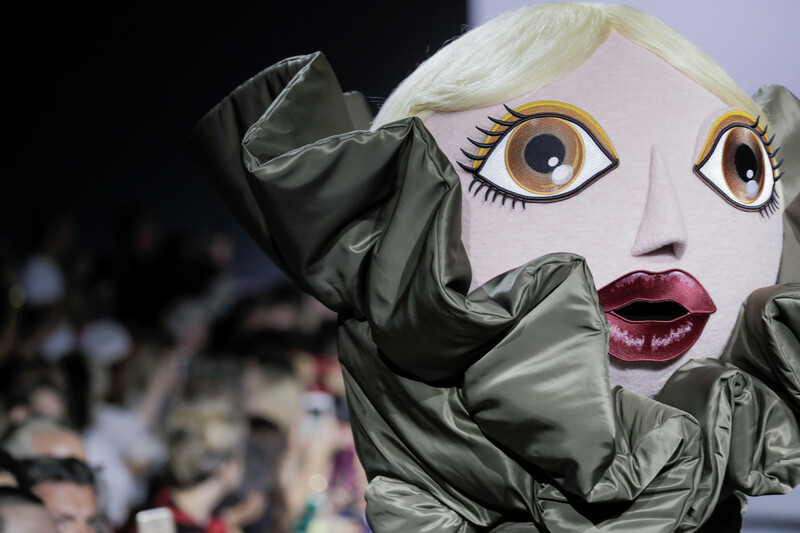 A Viktor & Rolf spokeswoman said the designers would present and sell a final fall-winter 2015 women’s wear collection, but skip the runway during Paris Fashion Week, scheduled for March 3 to 11. 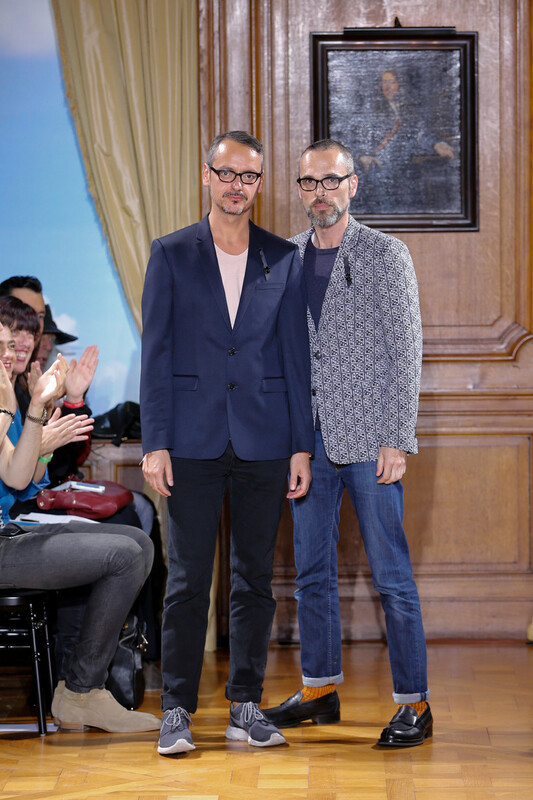 Viktor & Rolf ships its rtw collections for men and women to more than 100 specialty stores, and operates a freestanding store on Rue Saint Honoré in Paris, which is to go dark in early 2016. 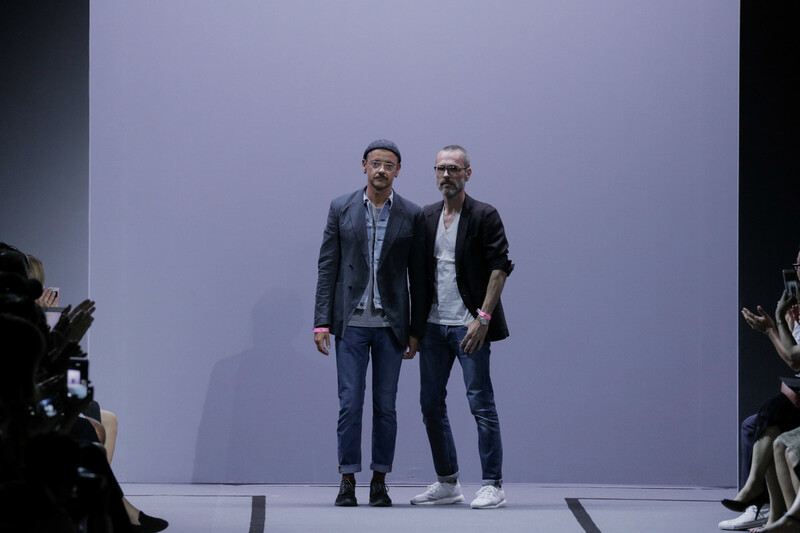 “We are extremely excited to push the boundaries of our vision in new, unexpected territories,” Snoeren concurred. 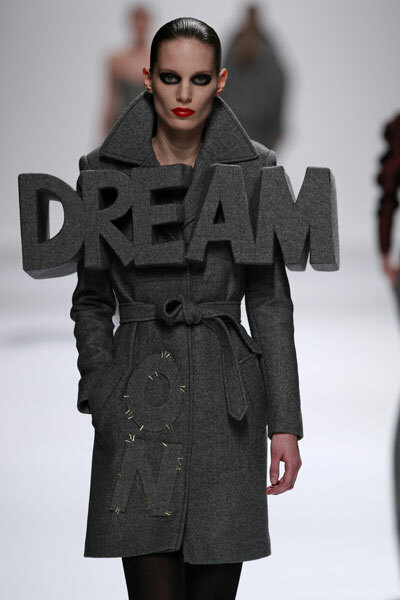 The designers launched their brand in 1993, started showing couture in Paris in 1998, and began focusing on rtw in 2000. 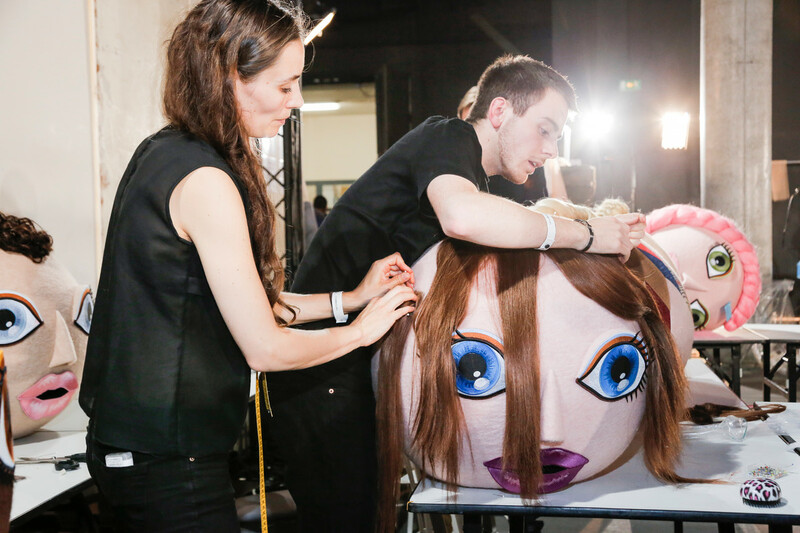 In 2005, they catapulted into the big league with the launch of Flowerbomb, their first women’s fragrance, in collaboration with L’Oréal. 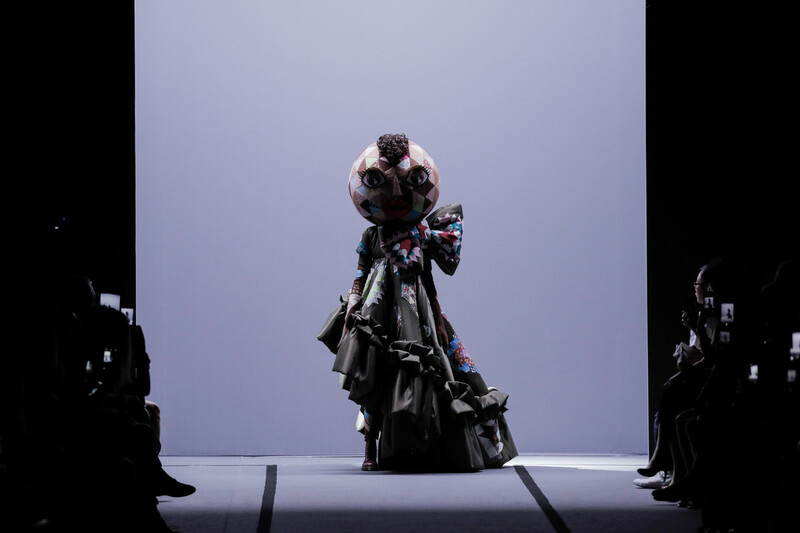 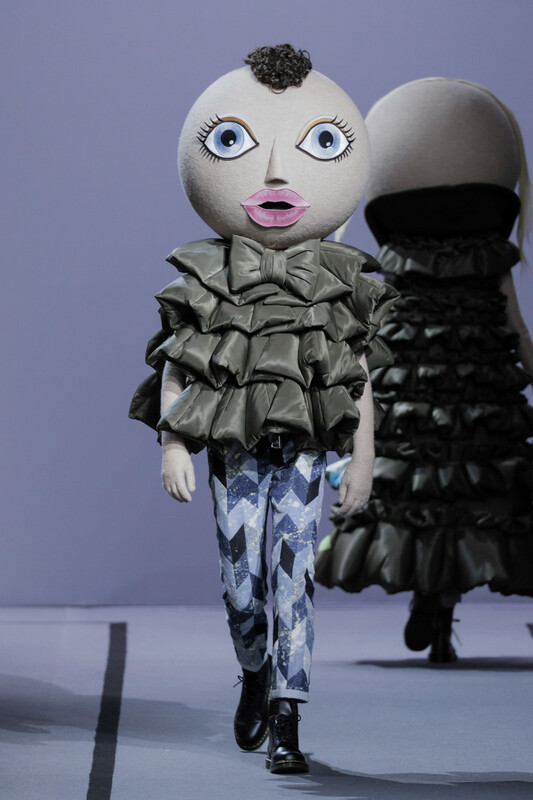 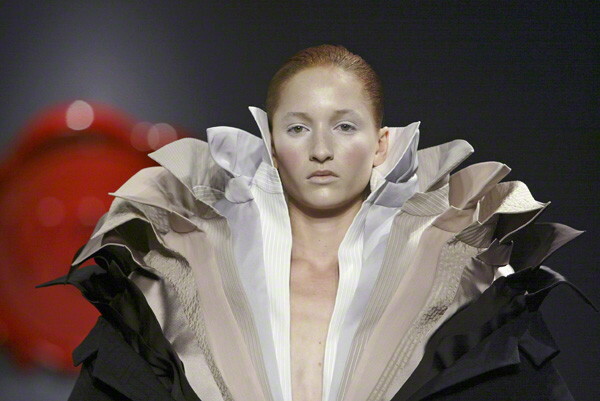 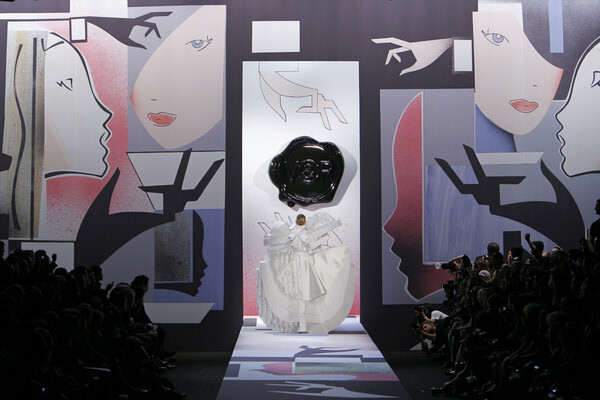 Viktor & Rolf showed five couture collections between January 1998 and July 2000, including the Atomic Bomb collection, featuring dramatic mushroom cloud-like cushioned necklines. 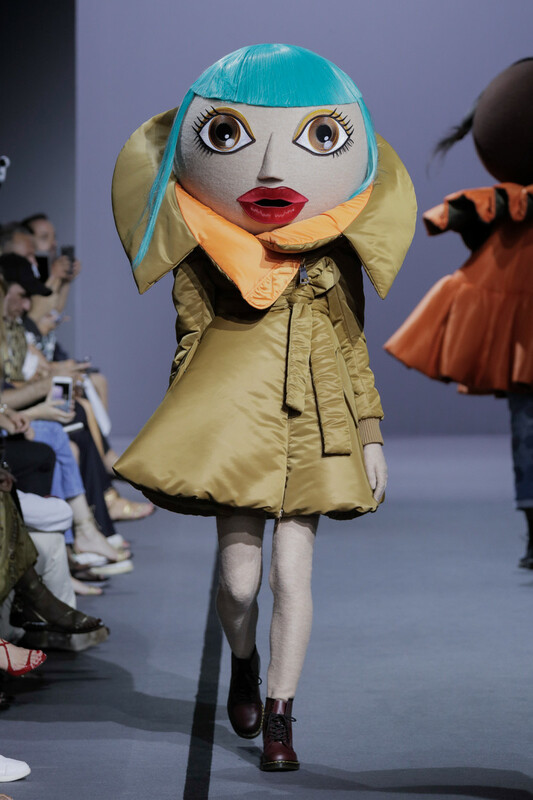 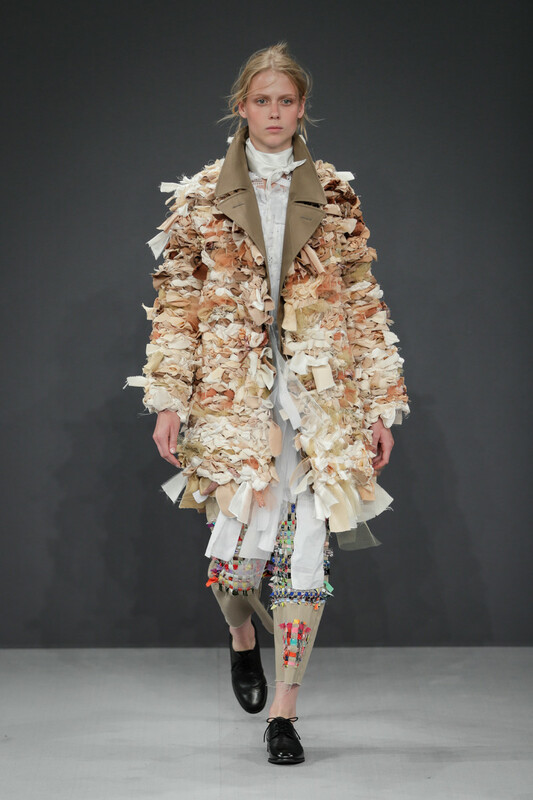 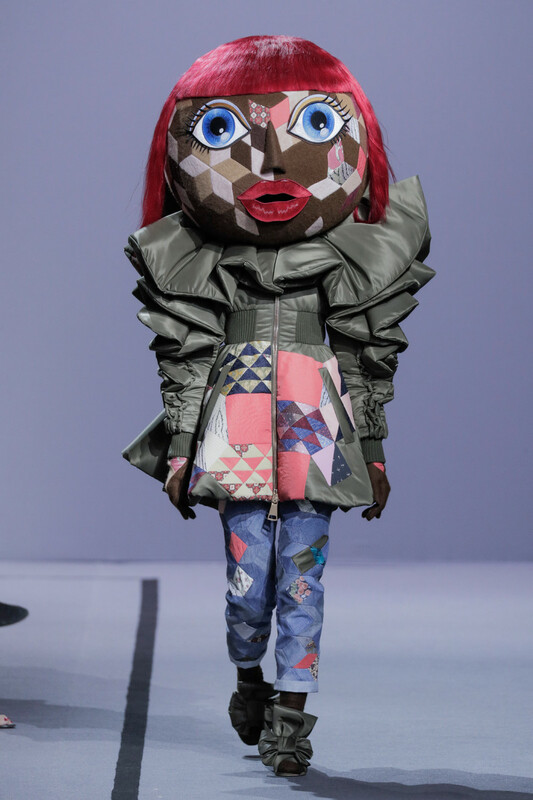 For the Russian Doll show, the designers dressed model Maggie Rizer in 10 layers of clothes, merging fashion with performance art. 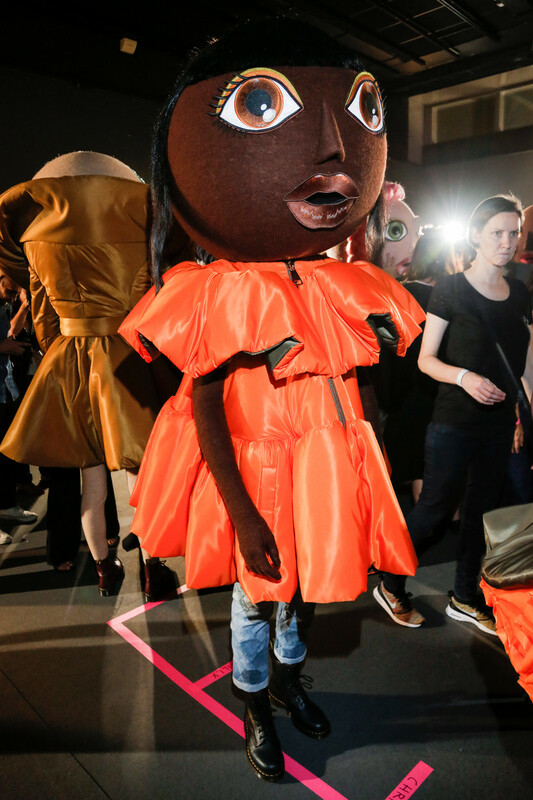 The majority of those pieces were sold to museums and institutions. 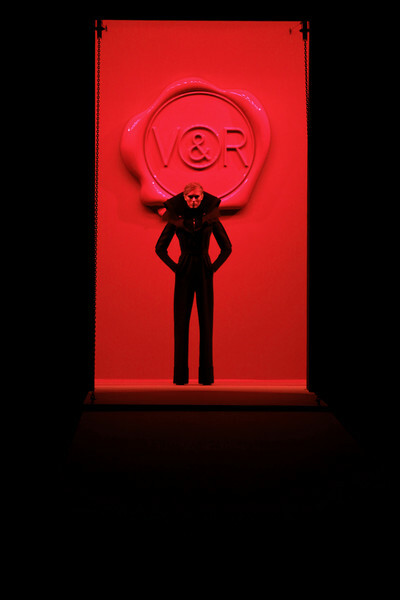 A men’s wear’s line, Viktor & Rolf Monsier, was introduced in 2003. 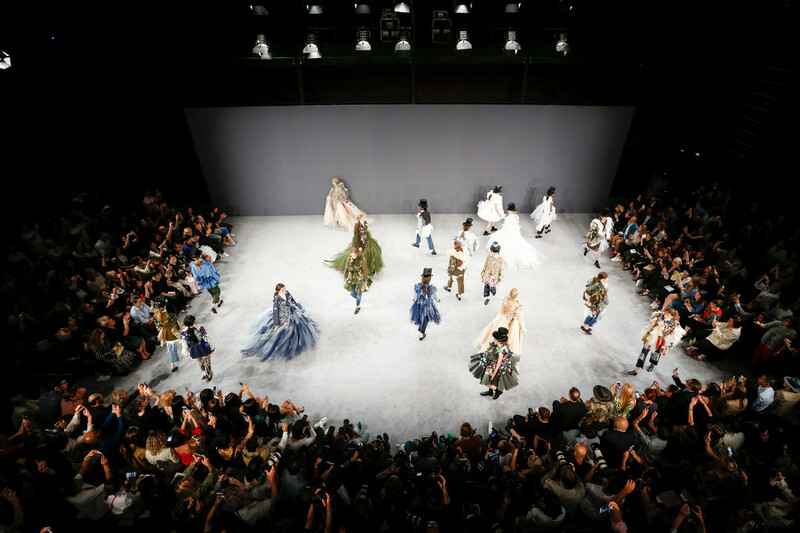 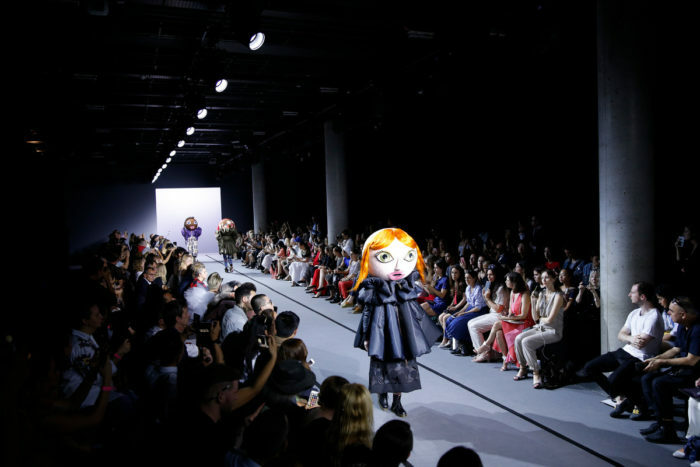 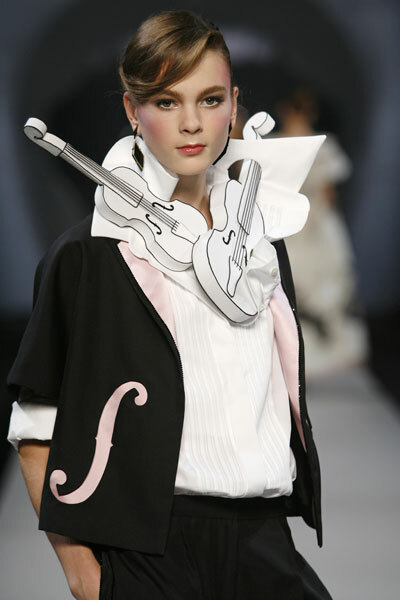 Despite this move into the mainstream, Viktor & Rolf maintained their reputation for unconventional catwalk presentations, many featuring live performances by actors and singers, including Tilda Swinton, Rufus Wainwright and Tori Amos. 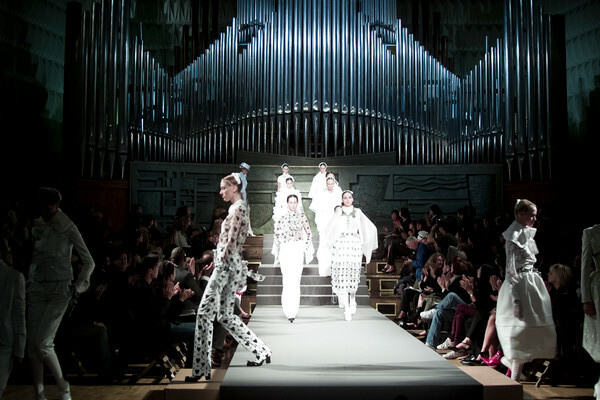 OTB Spa invested in the brand in 2008, heralding what seemed to be a new stage in its development. 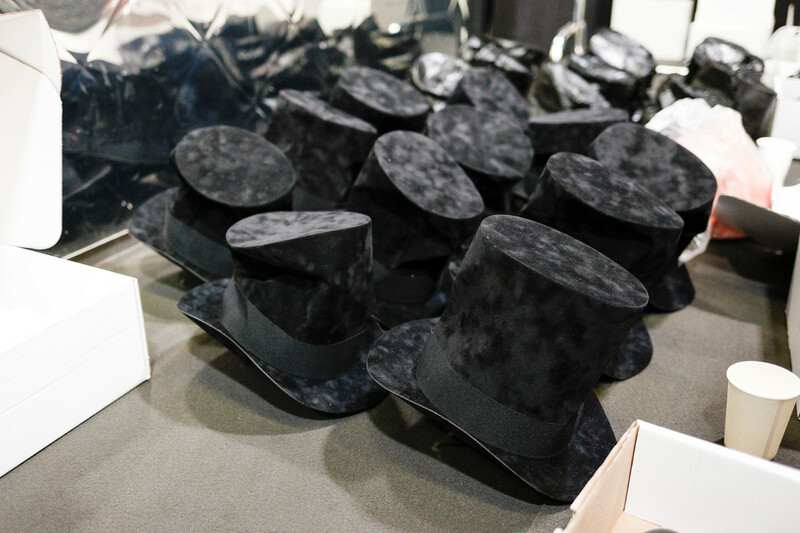 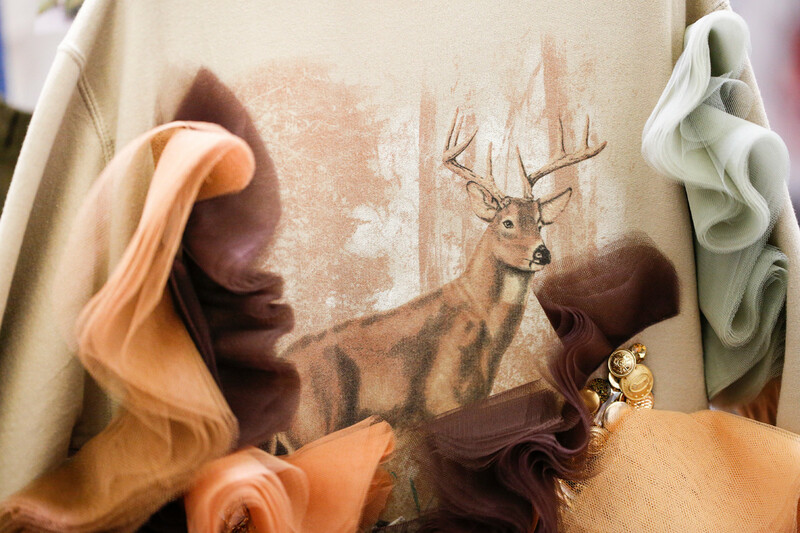 We’ve gathered the most memorable collections for you. 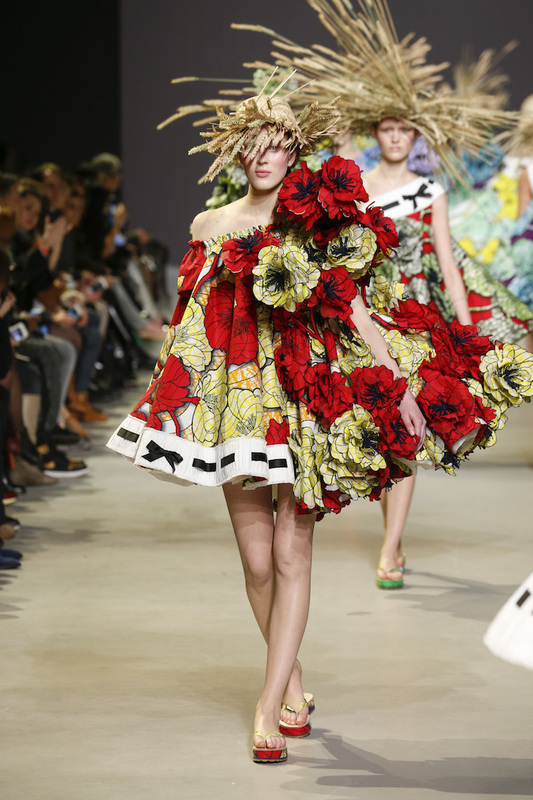 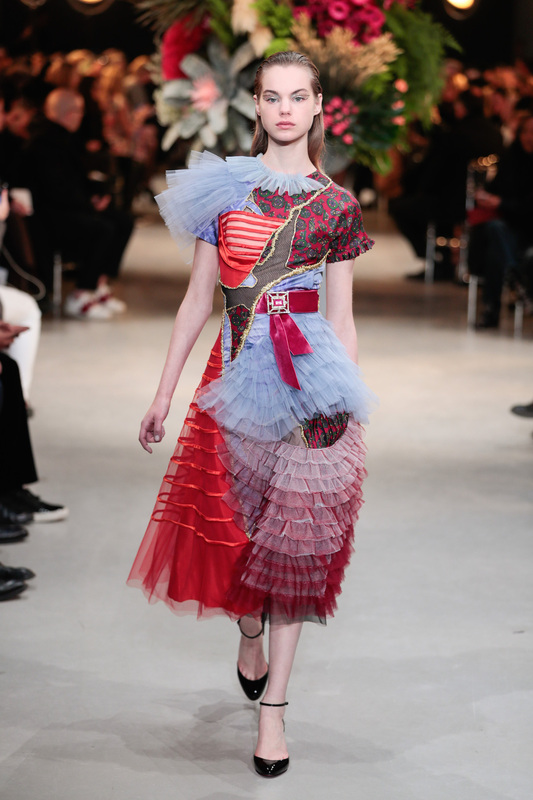 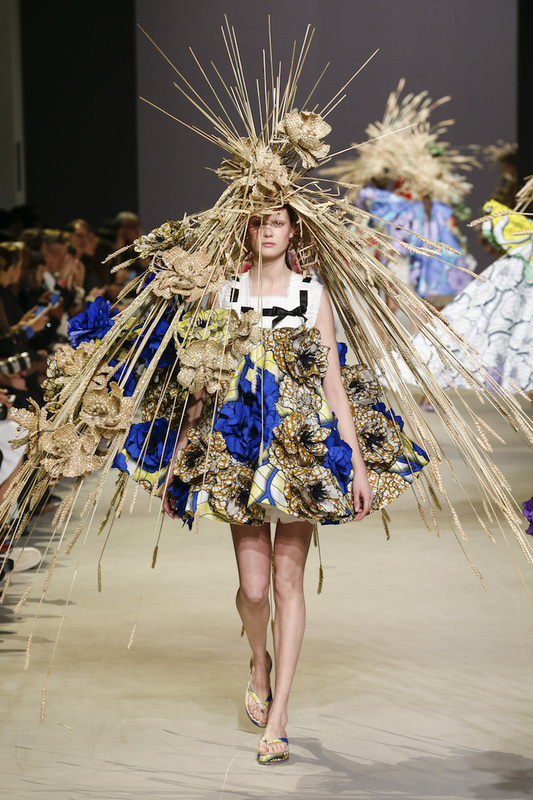 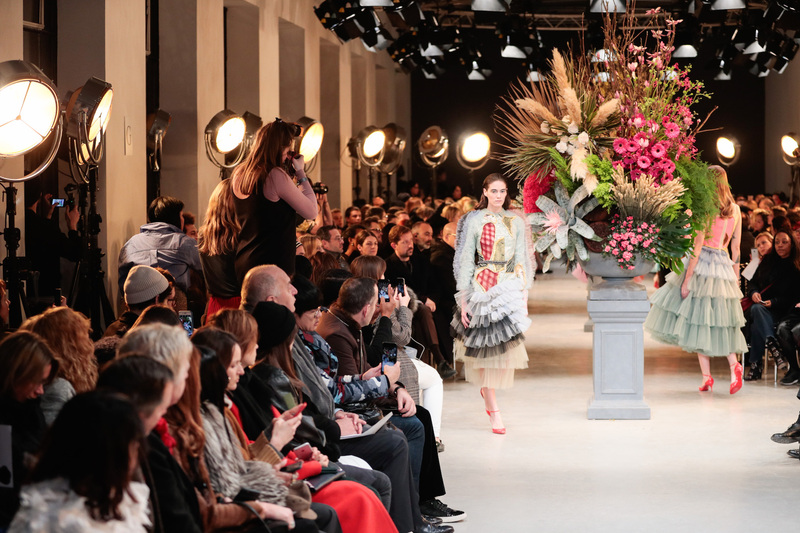 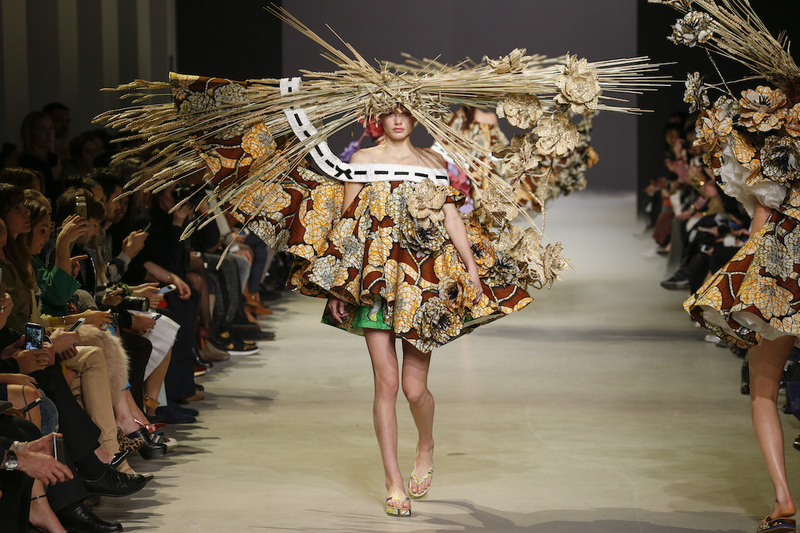 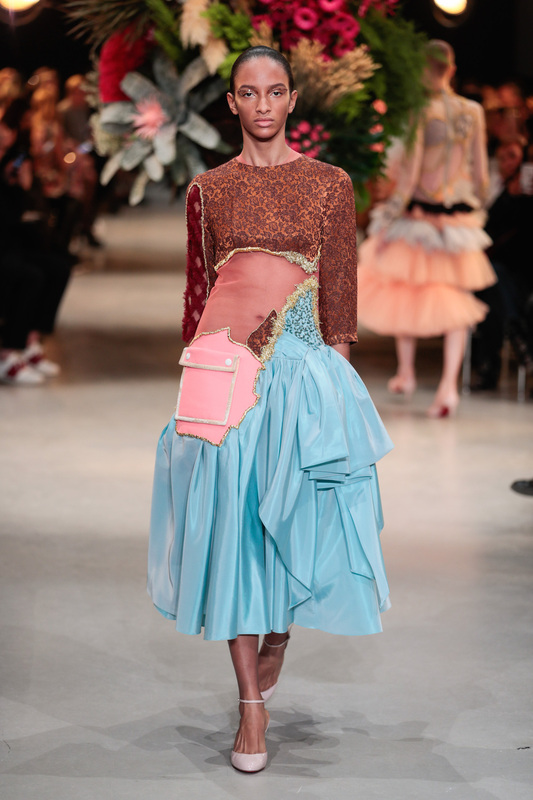 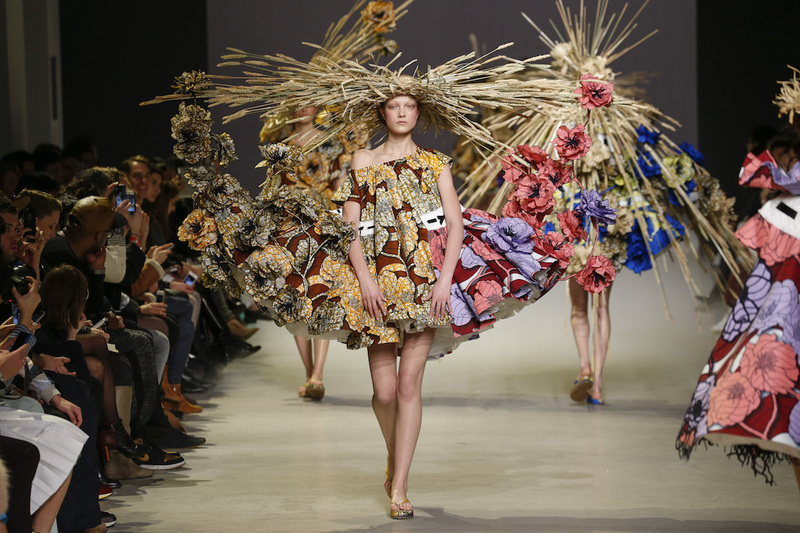 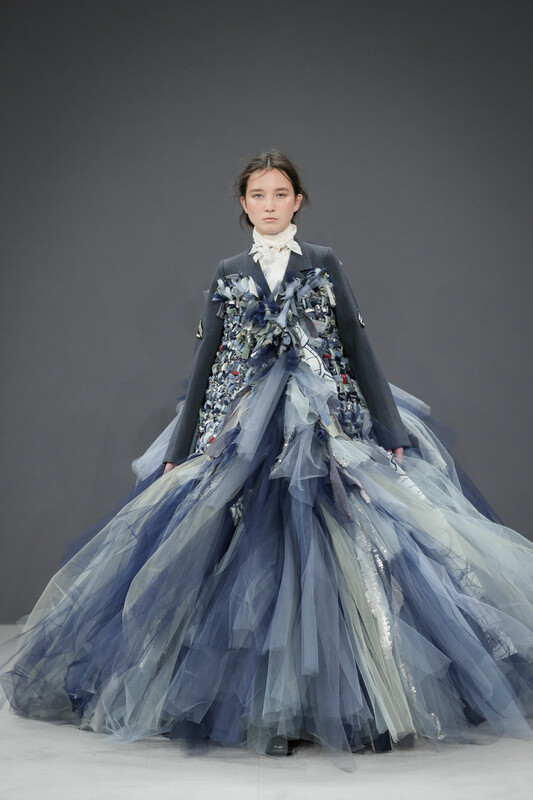 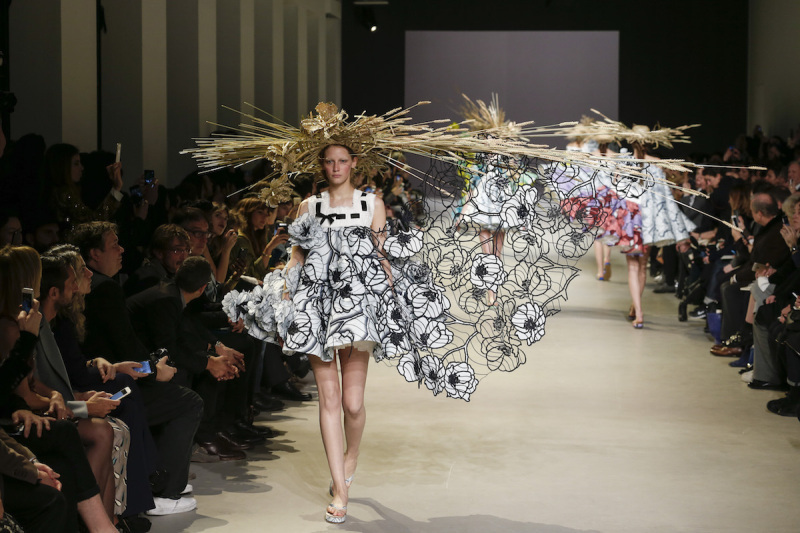 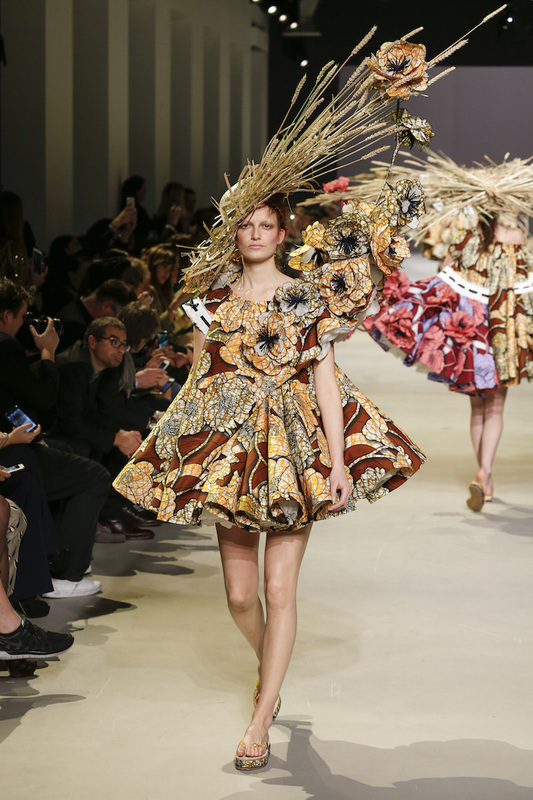 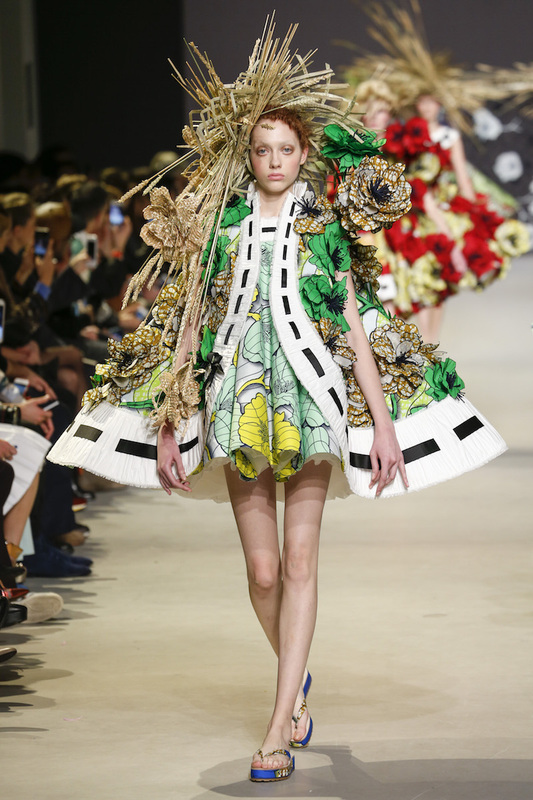 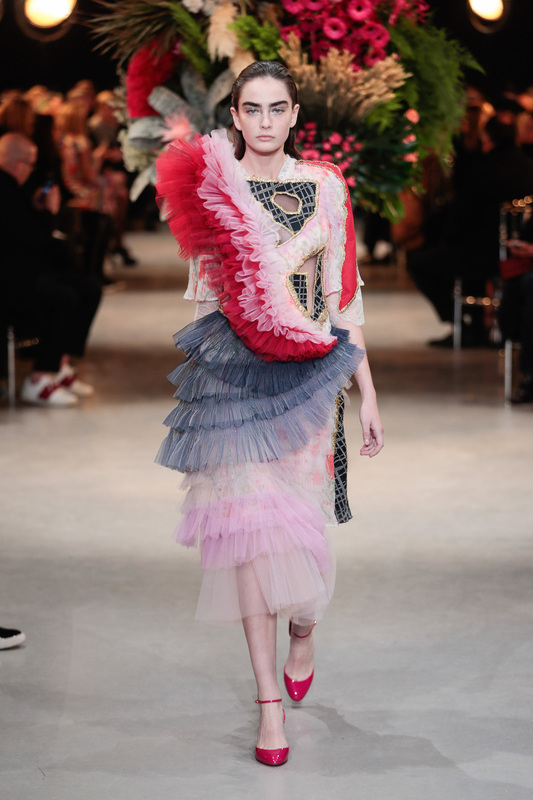 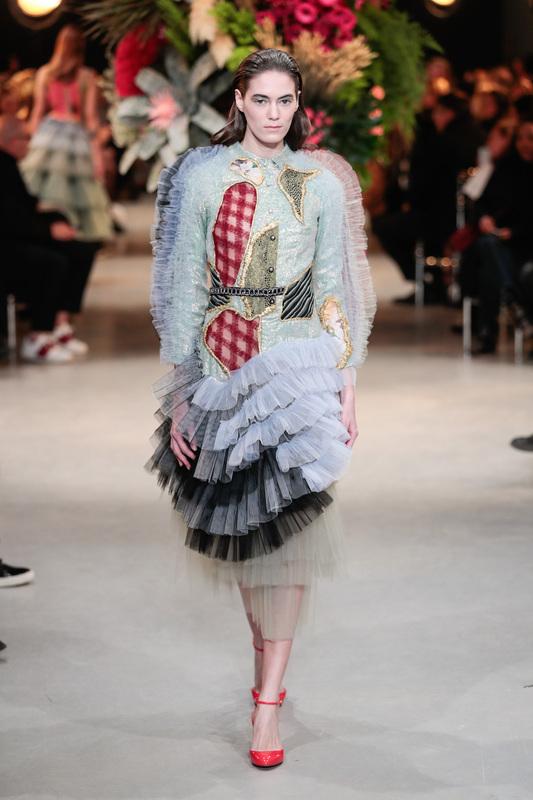 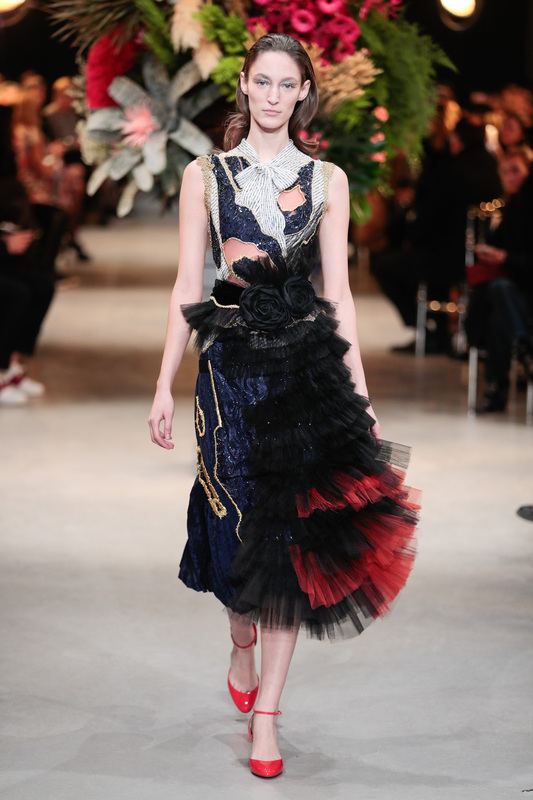 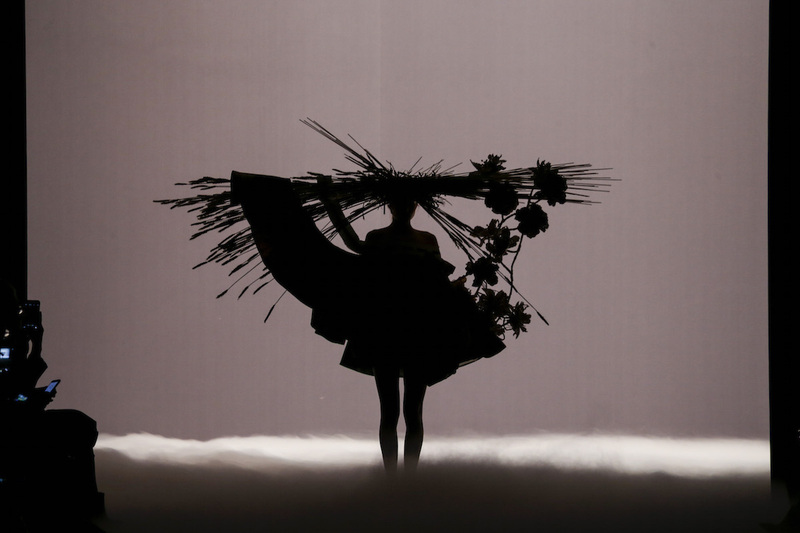 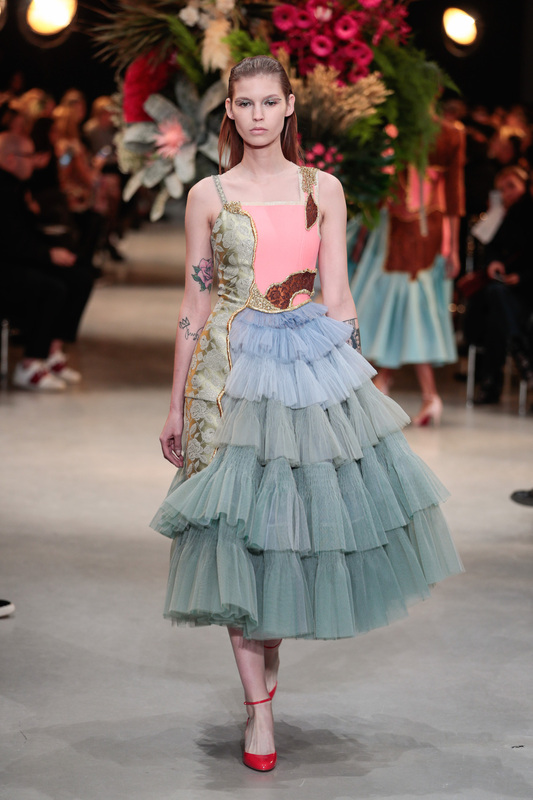 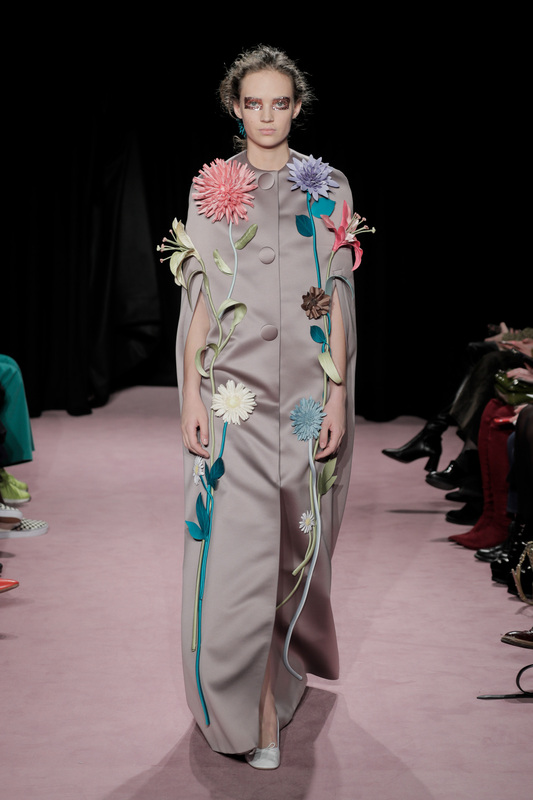 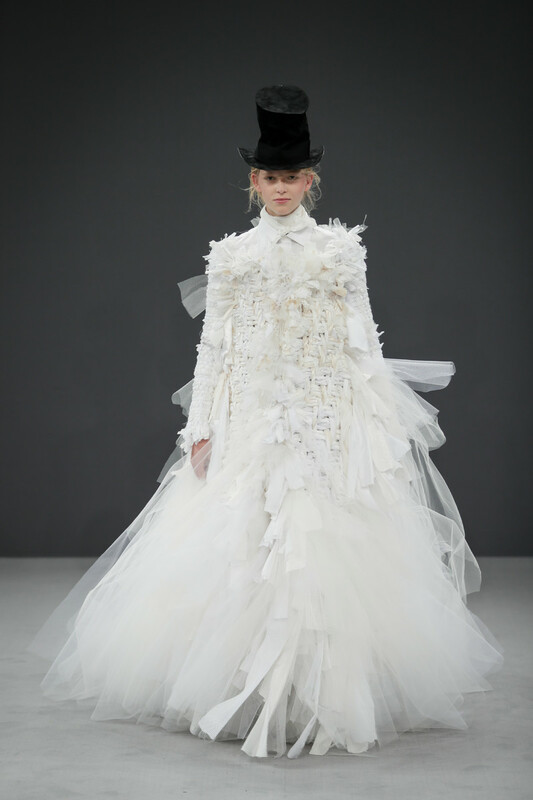 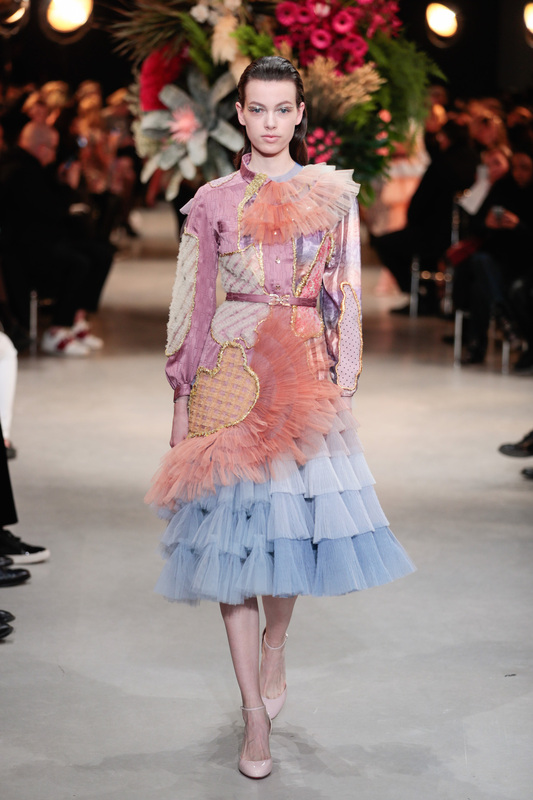 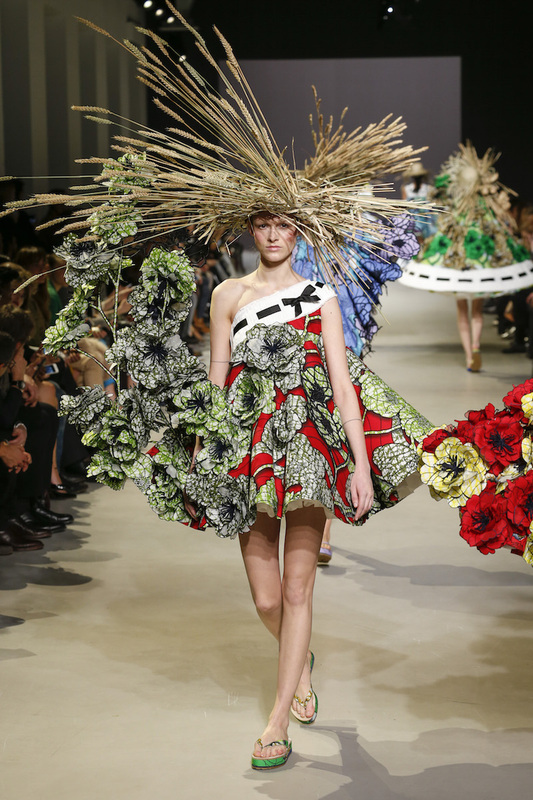 Viktor&Rolf’s Spring/Summer 2015 Haute Couture collection is inspired by the raw energy of Vincent van Gogh’s exuberant depiction of the rural countryside. 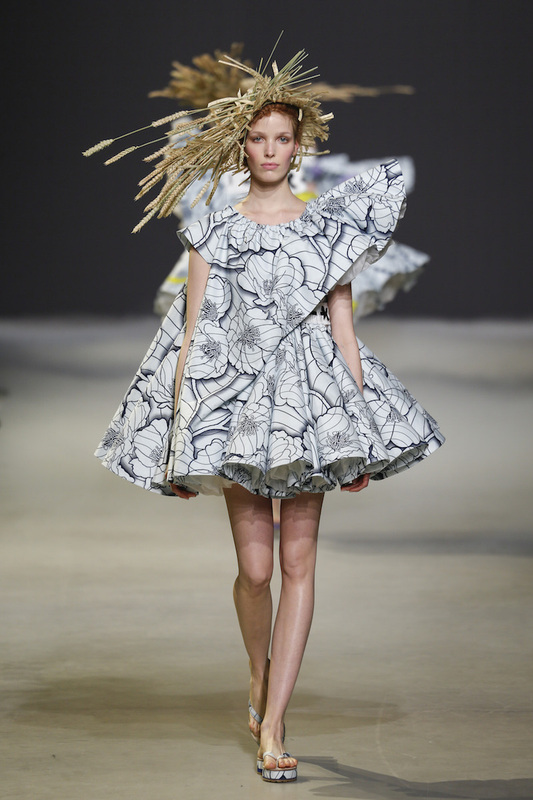 Flowerprint A-line babydoll dresses paired with straw hats and flipflops form the basis for a collection of increasingly colourful and sculptural looks. 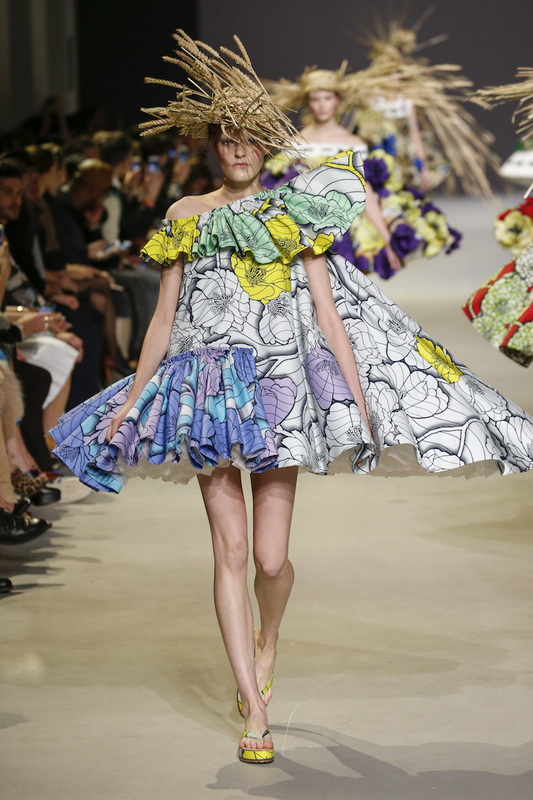 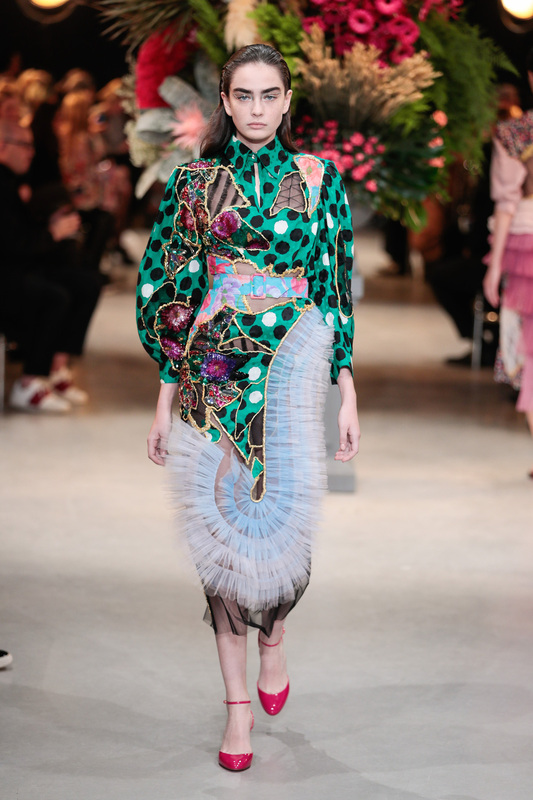 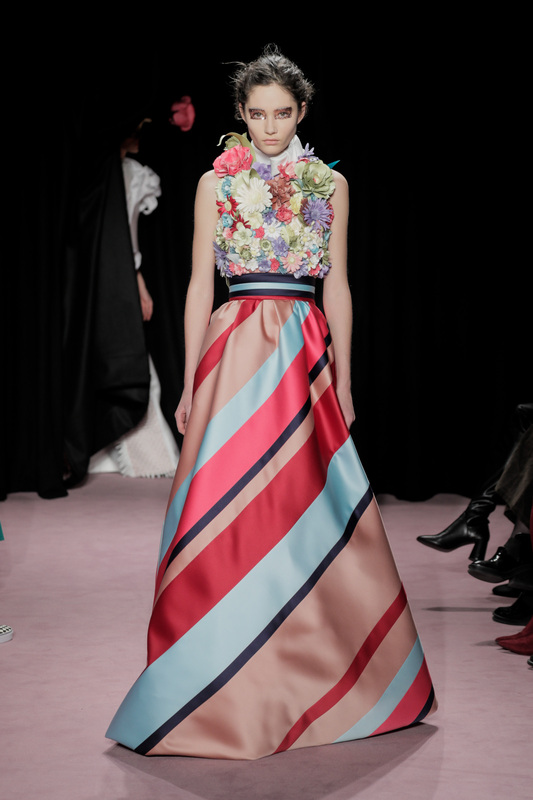 Spring/Summer 2015 Haute Couture is a surreal exploration of print: Flower petals sprout outwards and escape the garments, transforming 2D prints to 3D, and essentially bringing the flat surface to life. 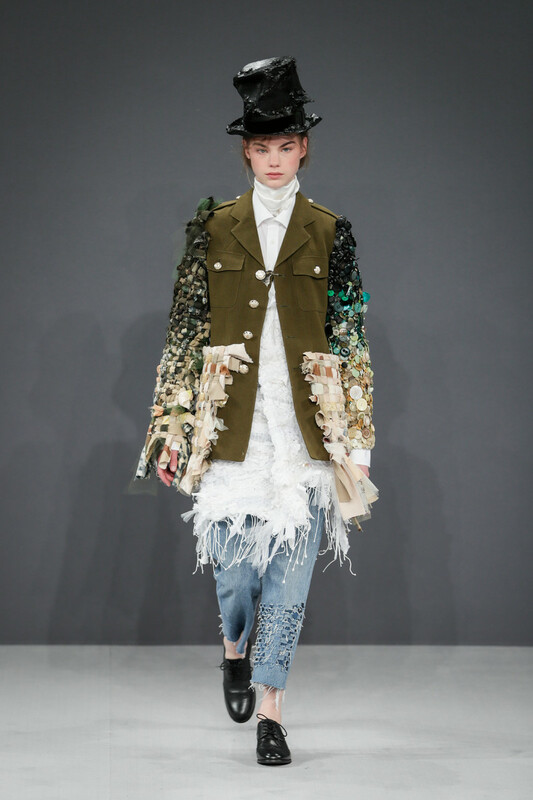 The essence of the countryside is translated into unexpected, sculptural looks that combine abstract graphic volumes with organic elements. 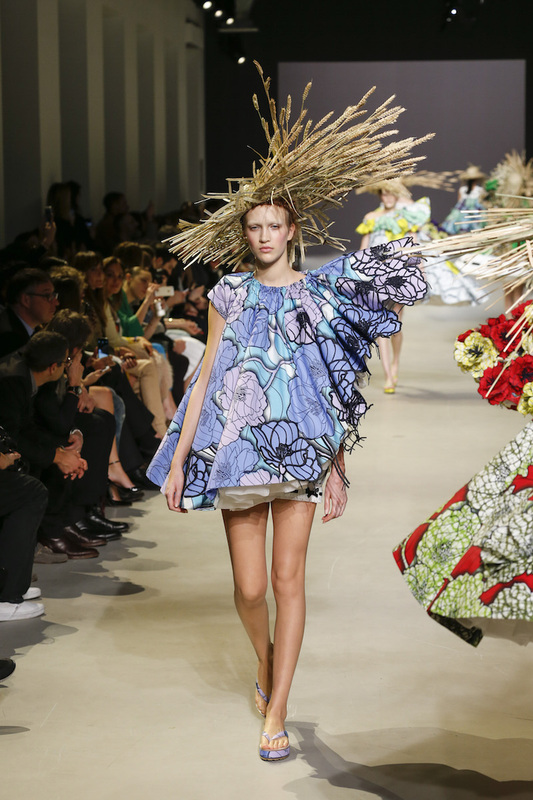 Straw hats, put together with a spontaneous touch, form a surreal nod to countryside living. 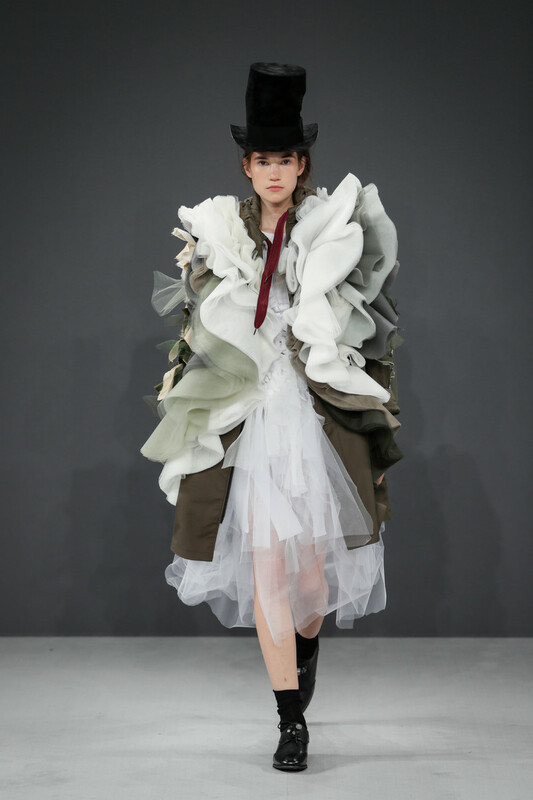 They enhance the bucolic mood of the looks, ultimately merging with the shapes of the garments, creating a new organic unity where hat and dress become one. 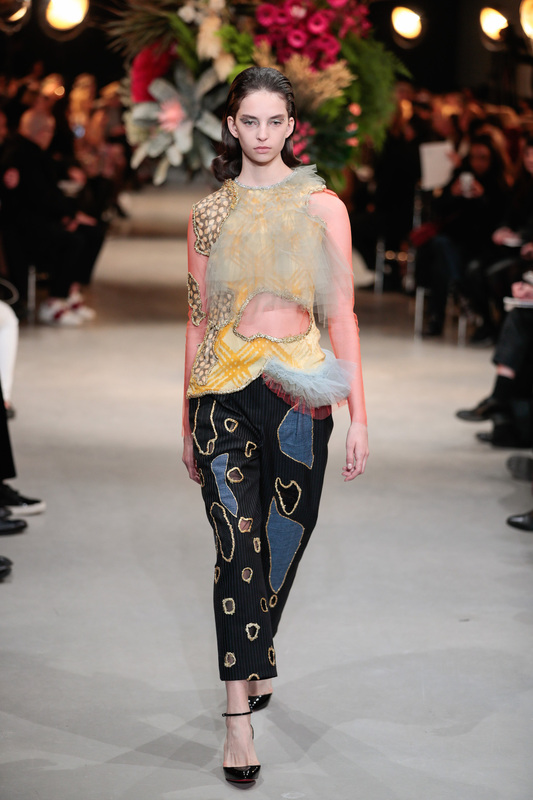 Sandals made in matching printed fabric complete the summer look. 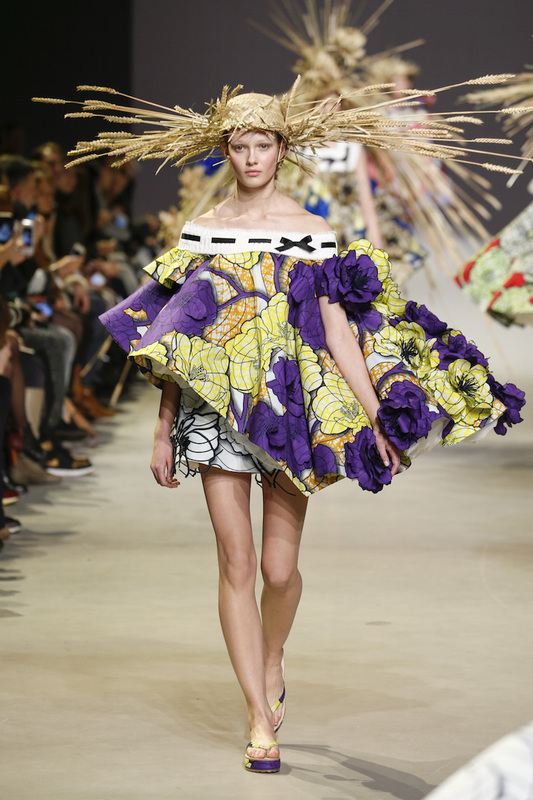 All fabric is manufactured through an authentic batik inspired “wax-dyeing & block printing” technique by VLISCO in the Netherlands. 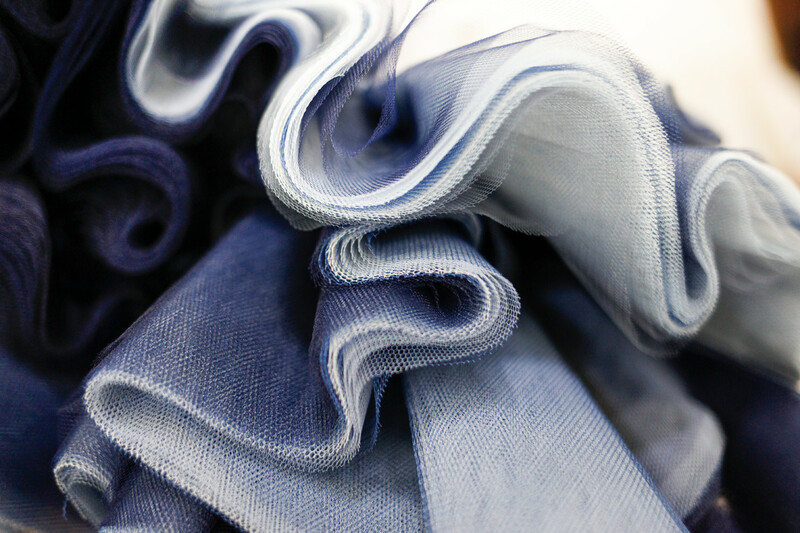 This ensures an unique high quality print with craquelé indigo lines and intense vibrant colours on both sides of the cloth. 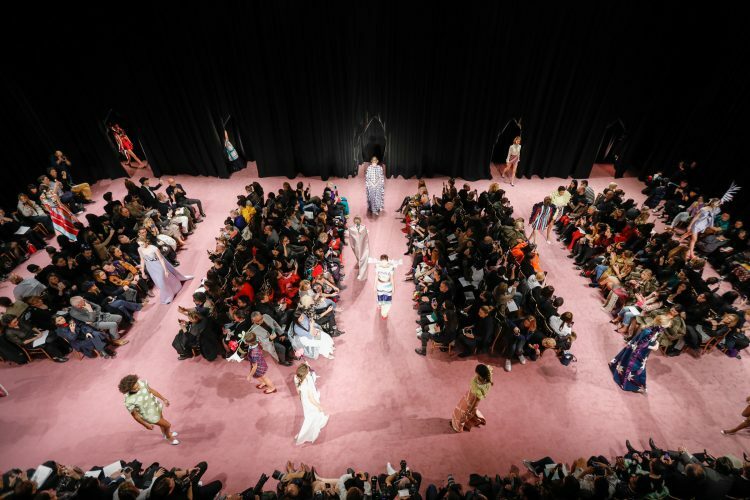 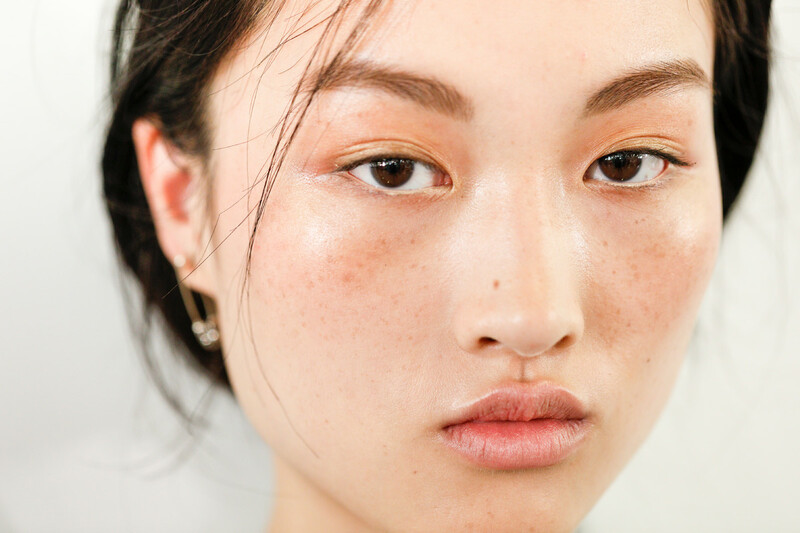 The mood of the collection is set with a musical injection of femininity from the theme of ‘Rosemary’s Baby’, which starts as a lullaby and grows into an eerie and mysterious vibe during the course of the show. 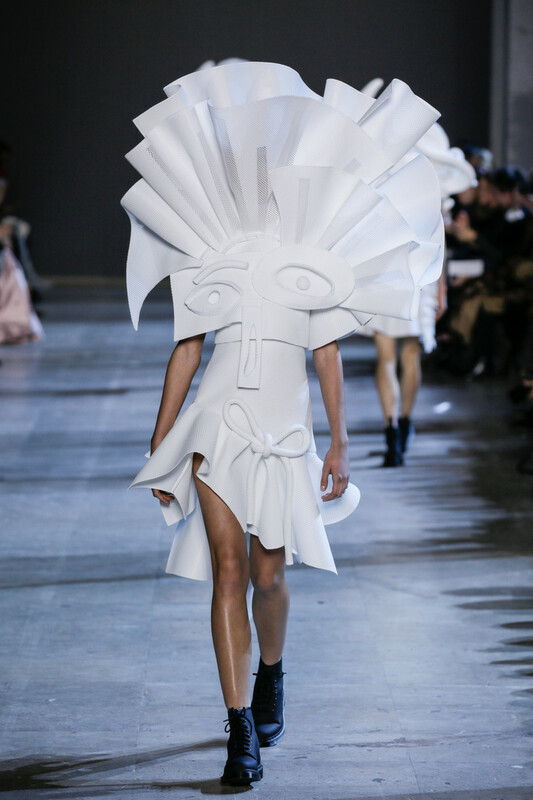 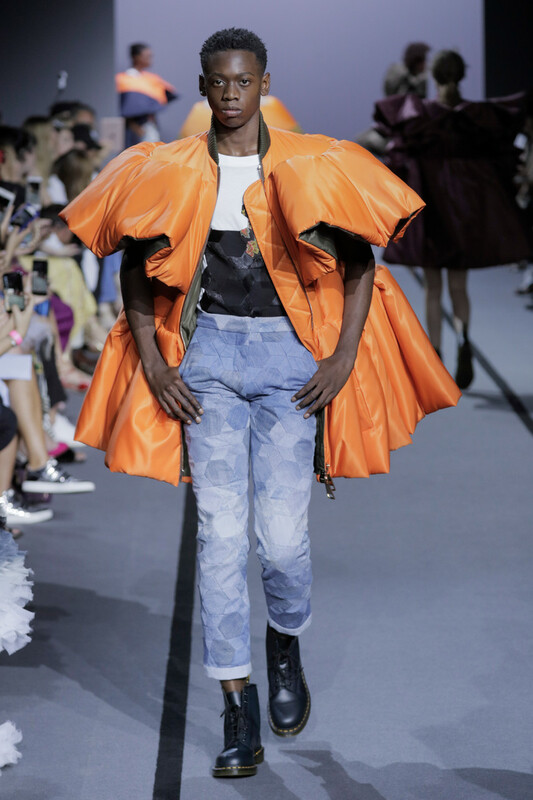 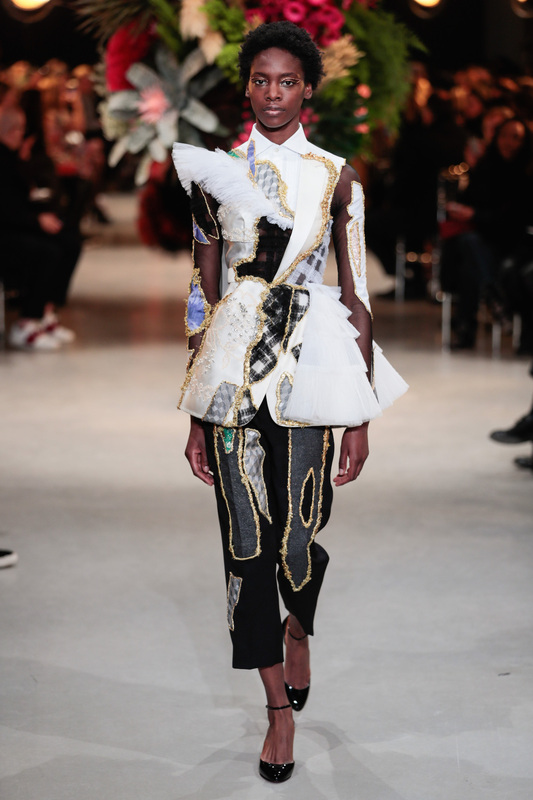 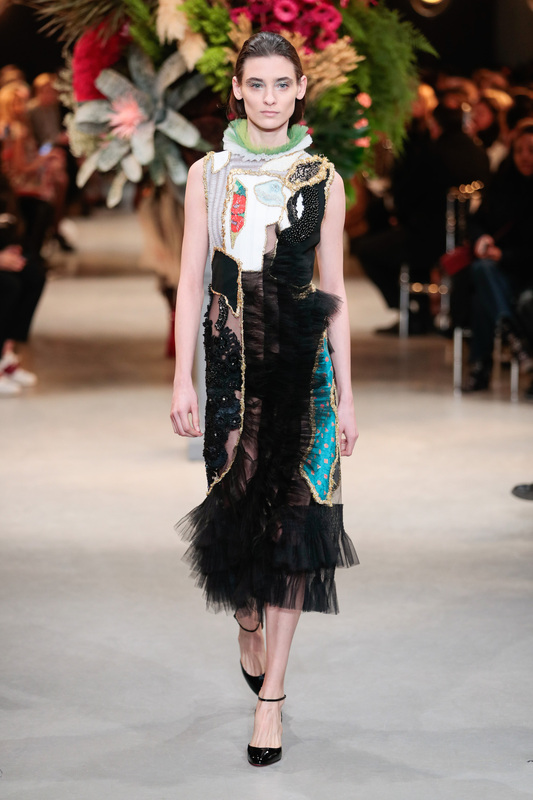 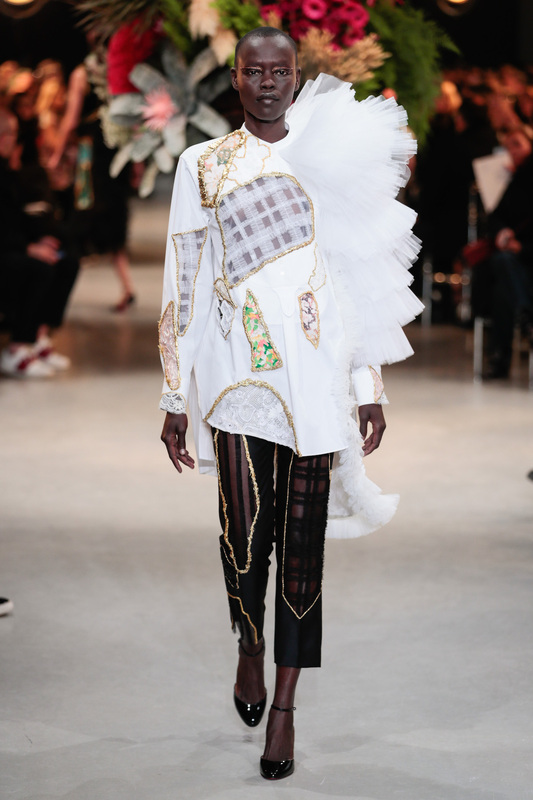 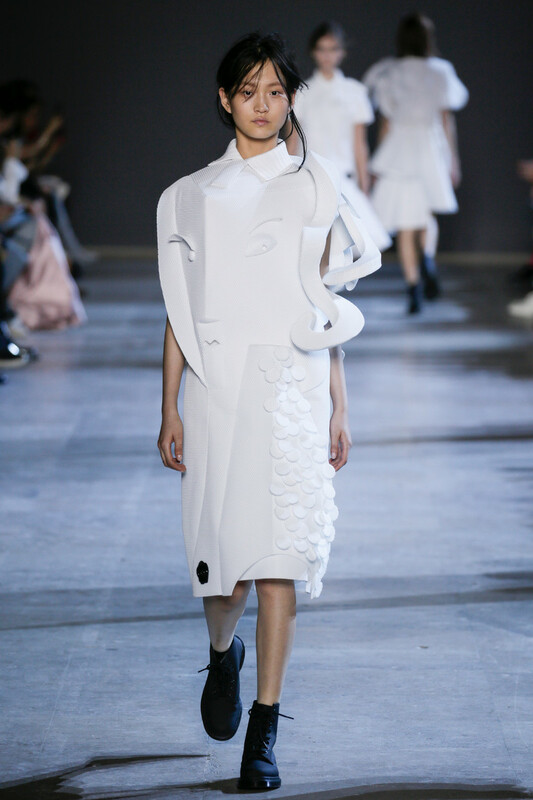 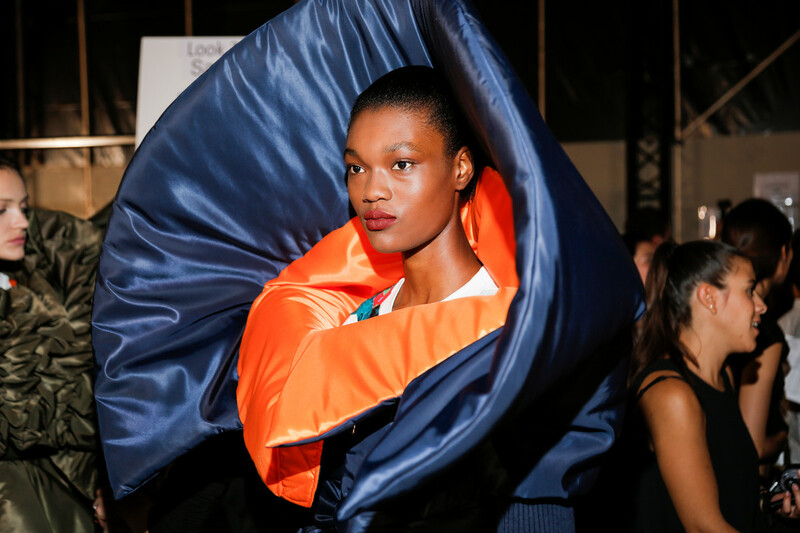 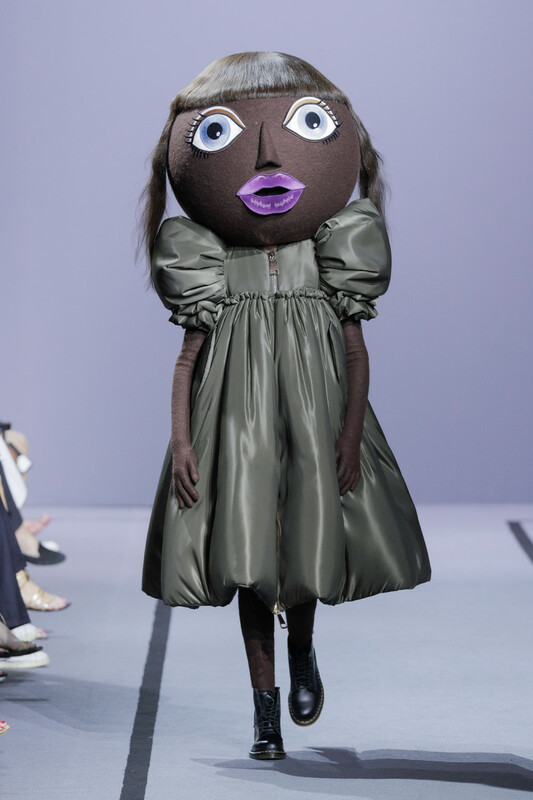 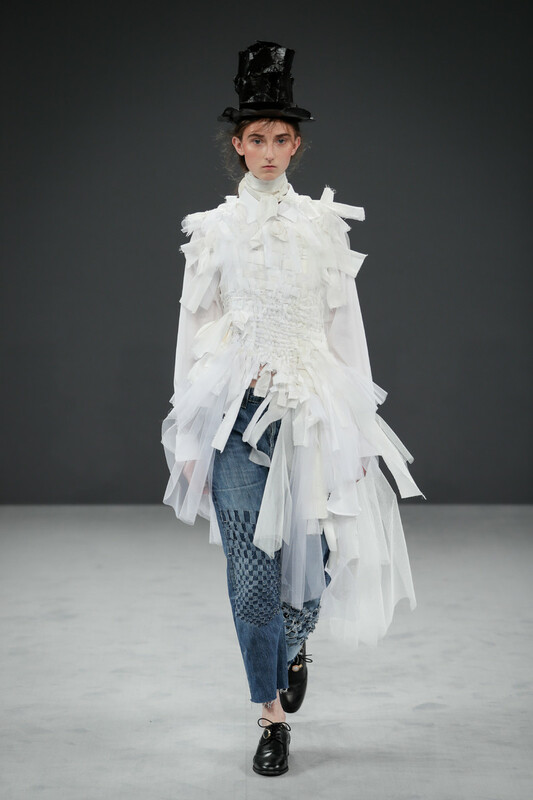 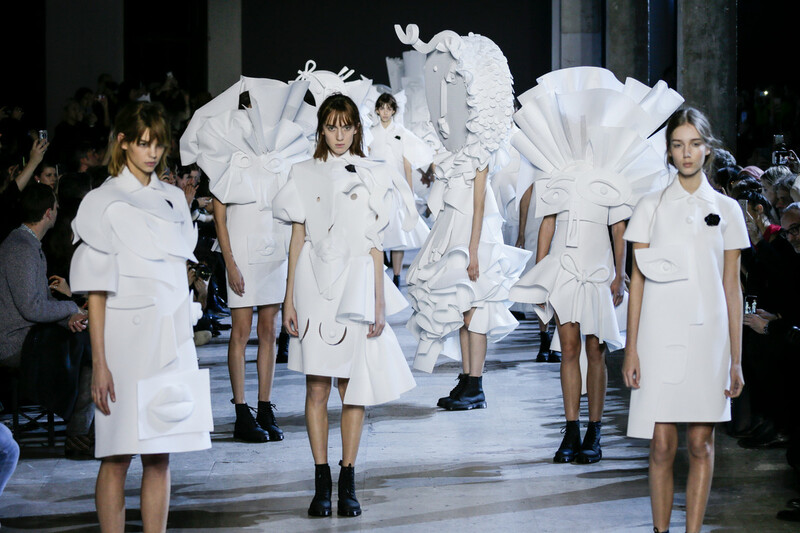 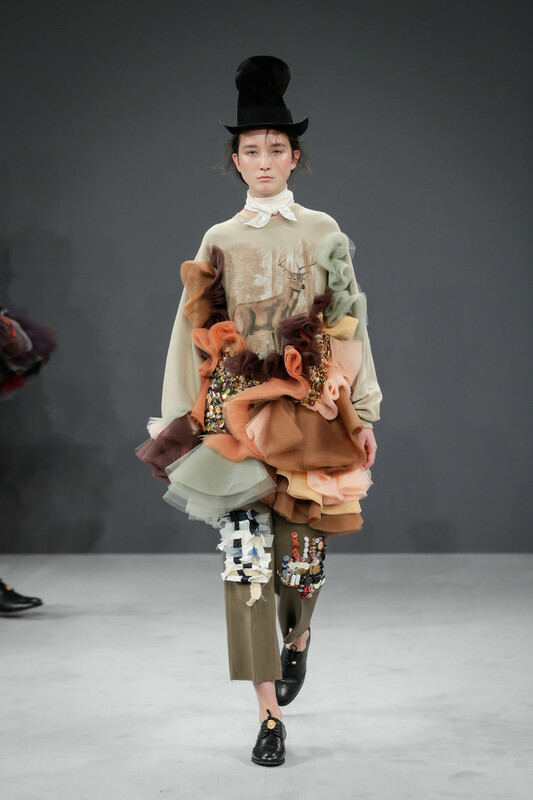 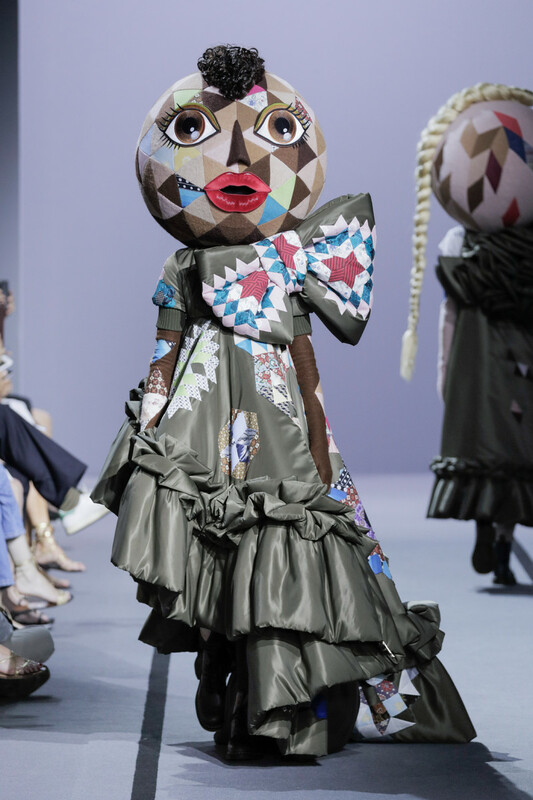 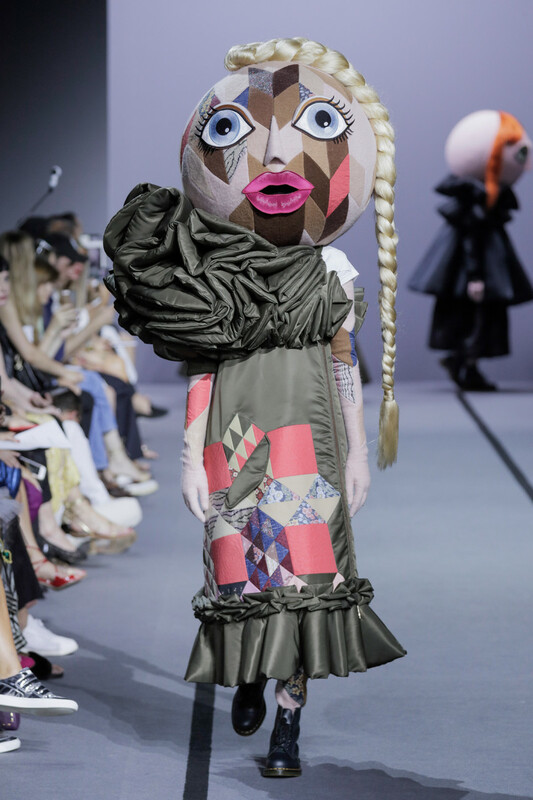 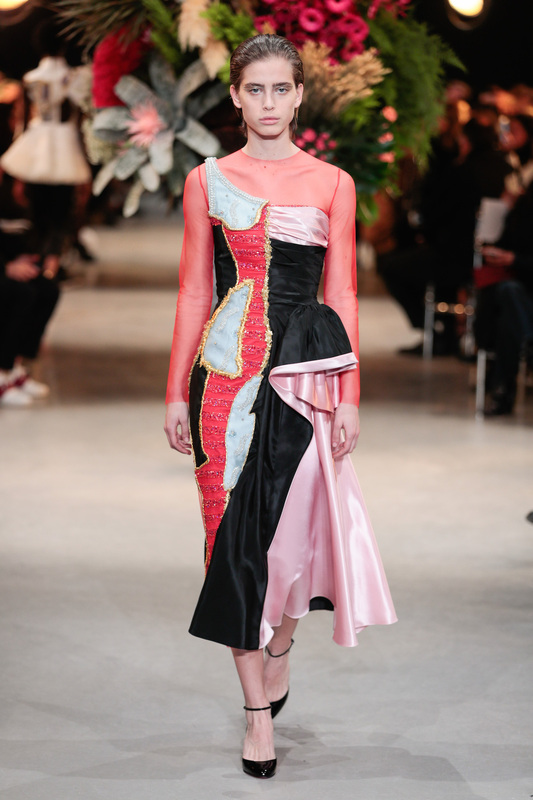 Art collector Han Nefkens, a longstanding collaborator of Viktor&Rolf acquired three pieces of the collection after the show debuted on January 28th on the catwalks of Paris Fashion Week. 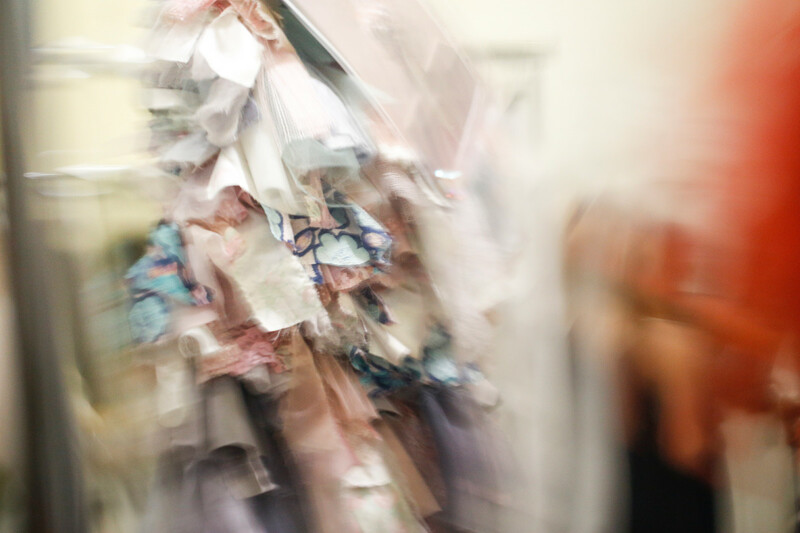 These three works will be donated to the Museum Boijmans Van Beuningen. 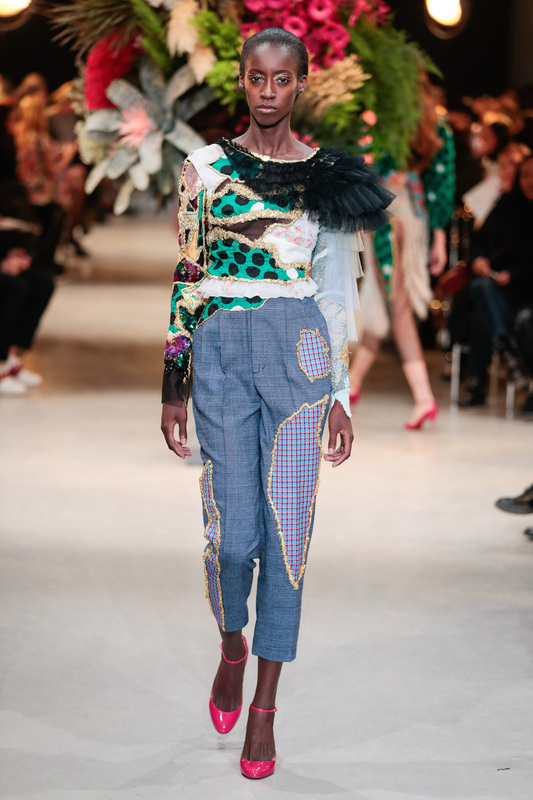 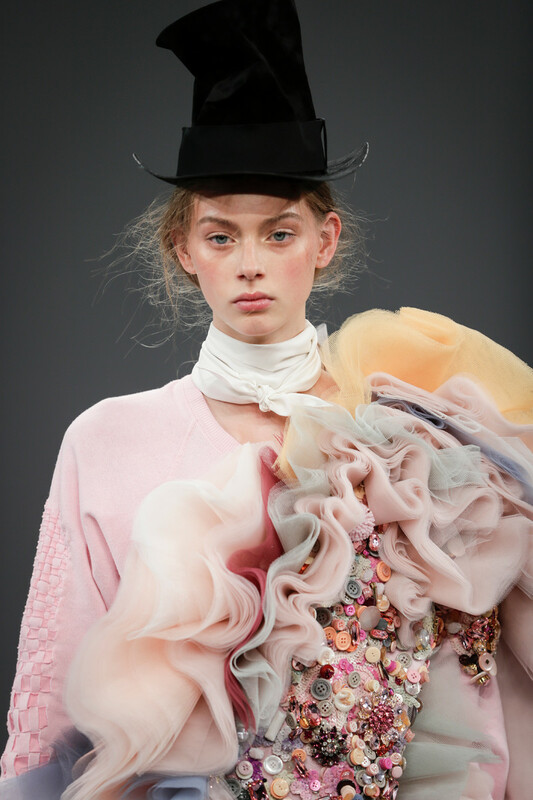 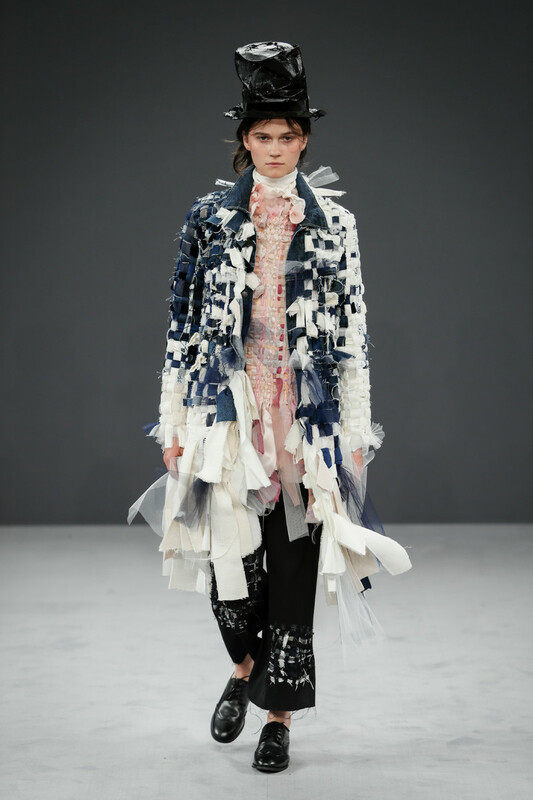 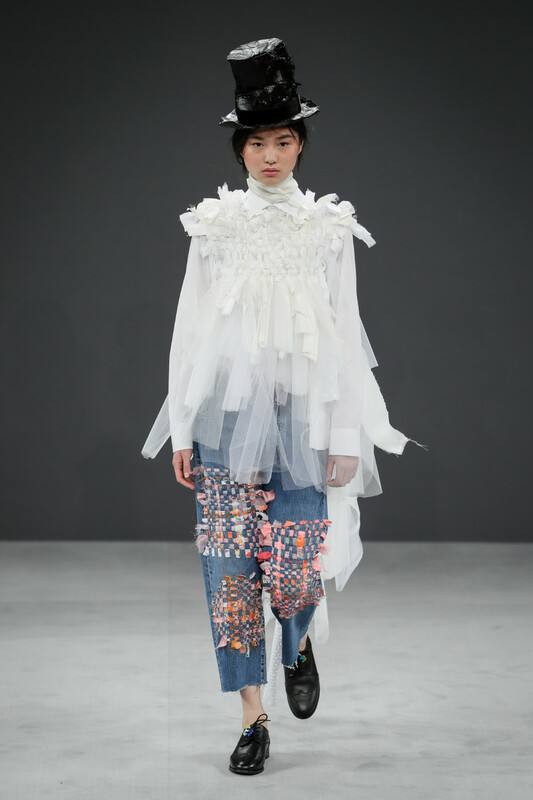 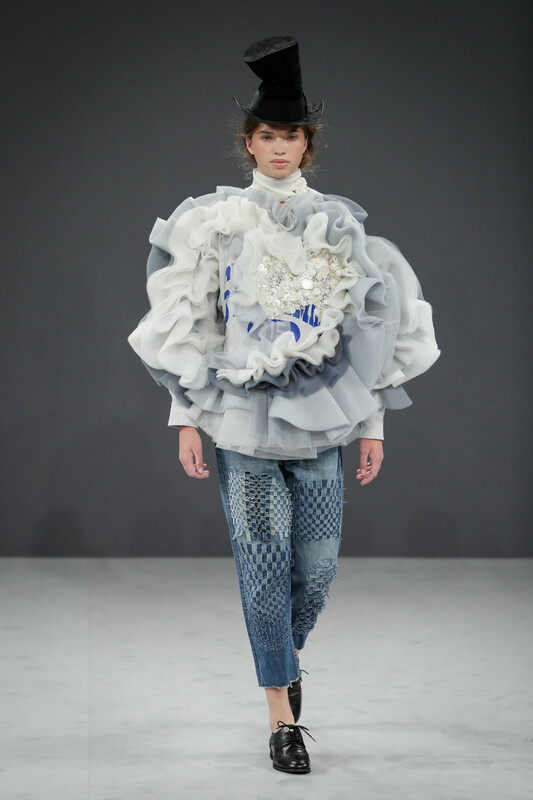 Their longstanding collaboration has led to the purchase or commissioning of pieces that are donated or given as a long term loan to the Museum Boijmans Van Beuningen as part of the Han Nefkens Fashion on the Edge project. 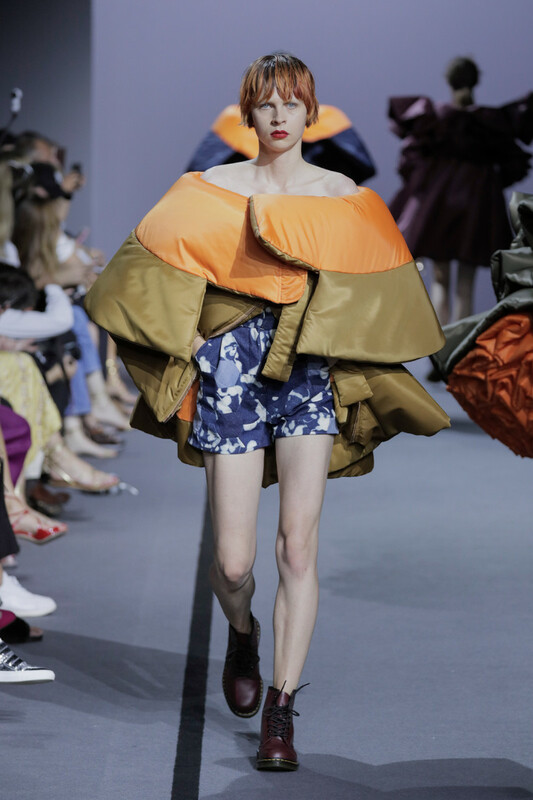 Viktor Horsting and Rolf Snoeren choose activewear as their inspiration, though worked it with their own irreverent touch. 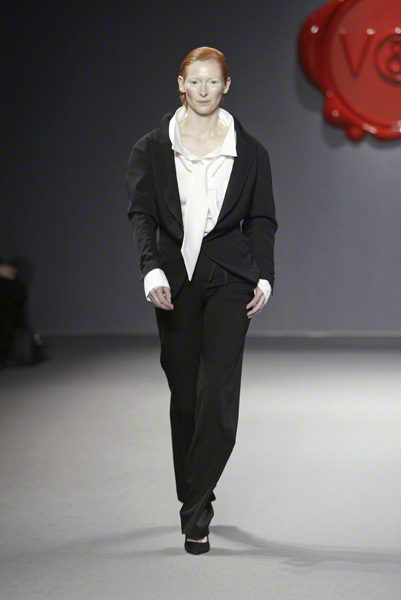 Several remakes of Olivia Newton-John’s ‘Physical’ were on the soundtrack and punctuated their theme. 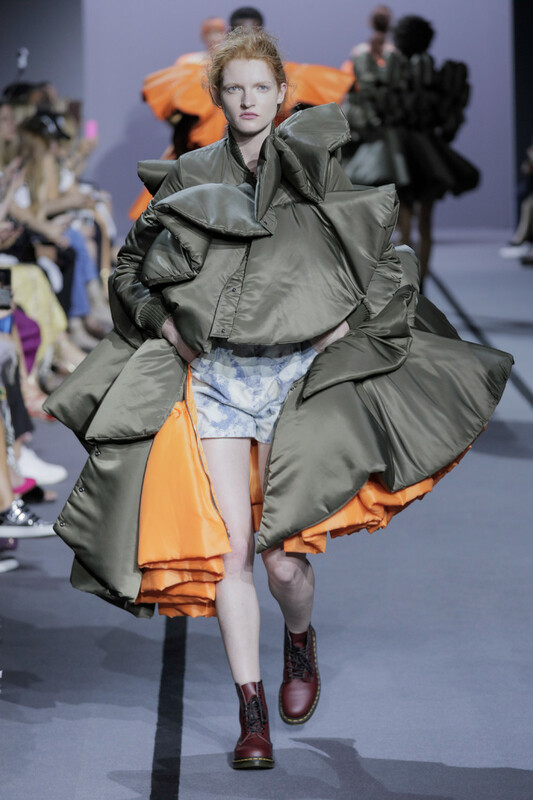 The duo played on the idea with biker shorts and slouchy pants. 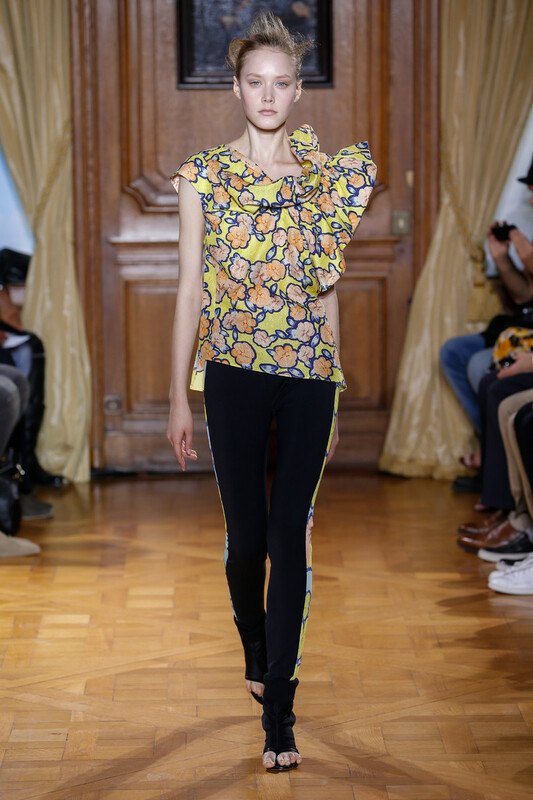 Theye were paired with mesh tops in upbeat floral prints. 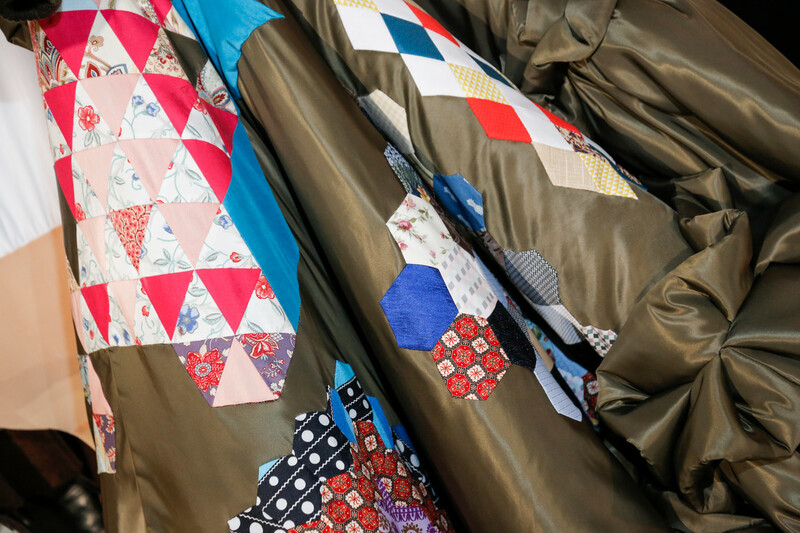 These looks riffed on traditional shirting, but were ruched, tweaked and cut together in an asymmetric way. 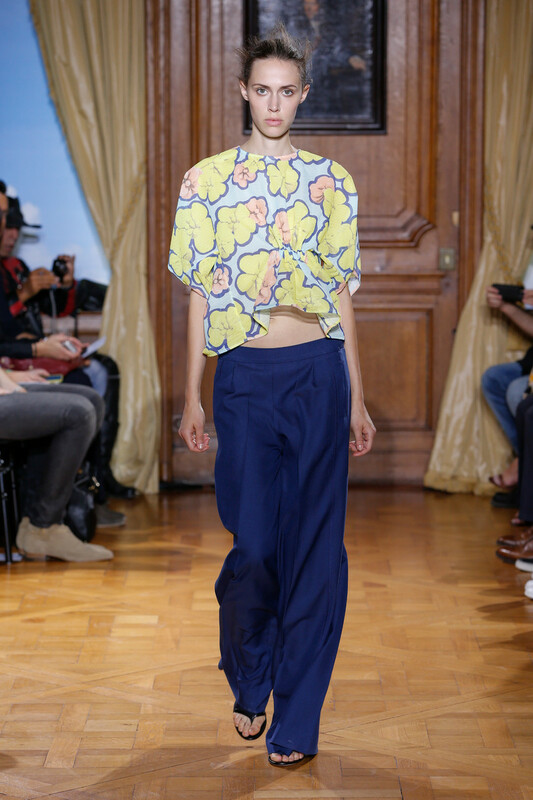 Playful touches were subtle, as in the way Horsting and Snoeren reworked tank tops, including one with an additional cross strap that added a graphic touch and cutout to the casual staple.